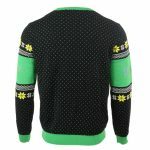 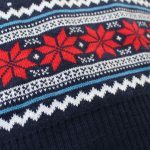 Holiday sweaters come in all shapes and sizes, but one thing they almost have in common is ugliness. 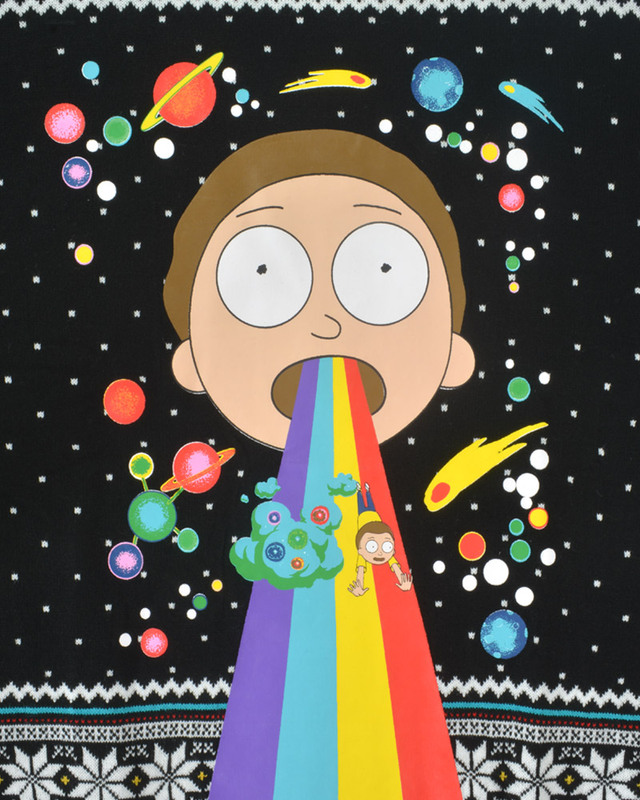 Who knows how or why it happened, it just did. 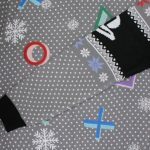 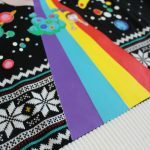 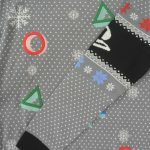 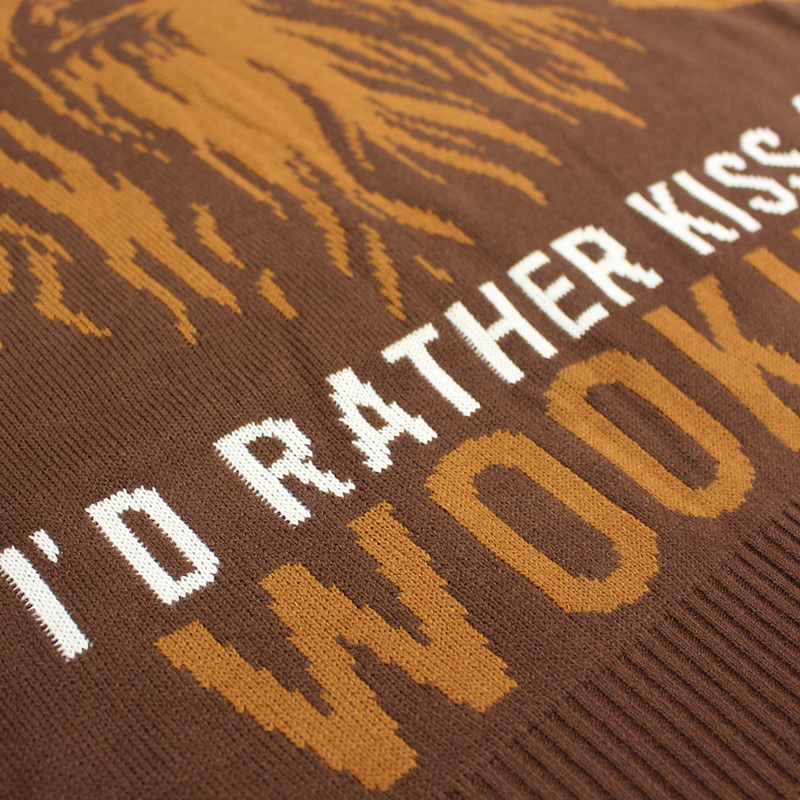 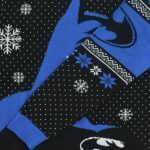 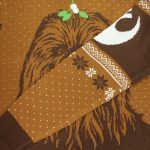 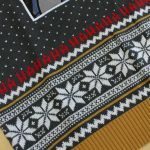 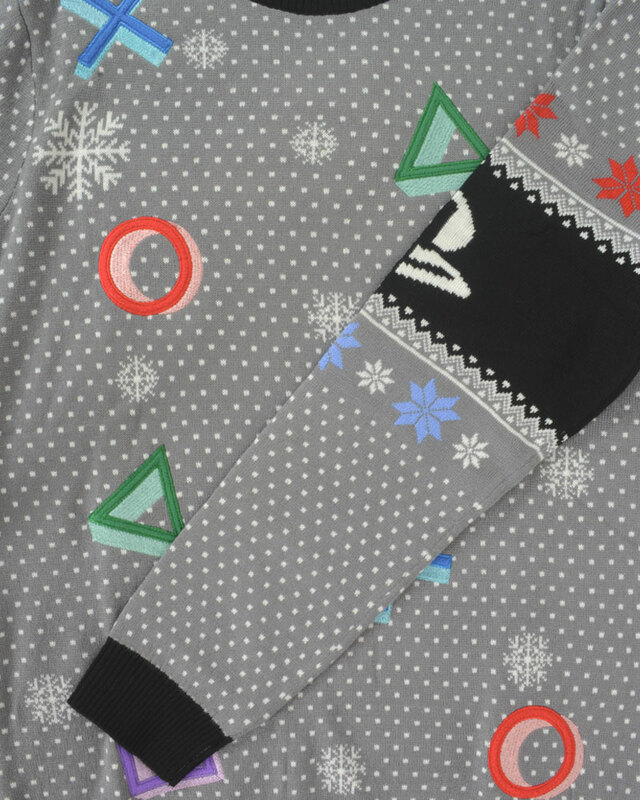 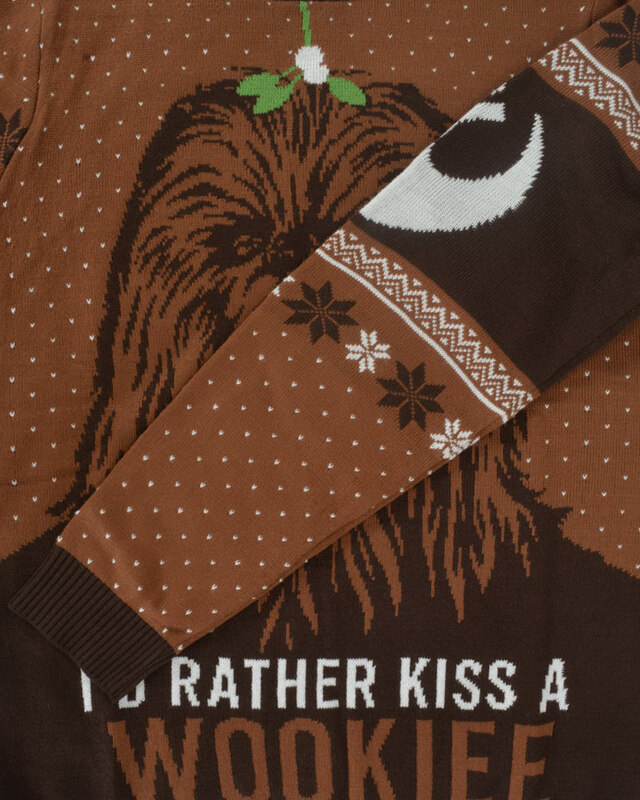 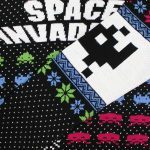 And now ugliness is the goal of most holiday sweaters, and Numskull is helping geeks get there as quickly as possible. 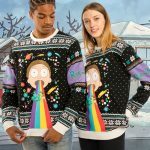 Numskull showed off its 2018 holiday sweaters line this week, and, well, you just have to flip through them for yourself. 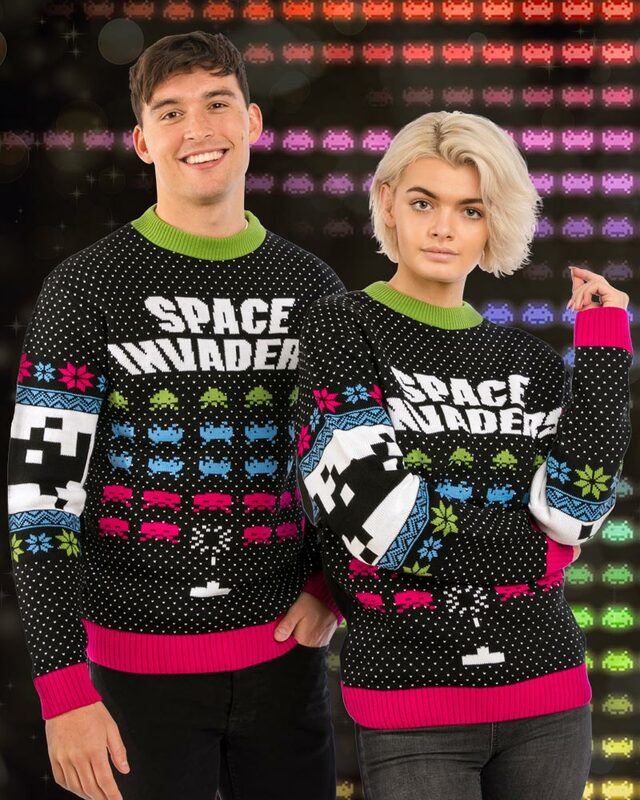 The sweaters are up for preorder now, so make sure to get those orders in now to have them in time for your holiday parties this year. 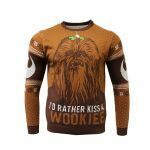 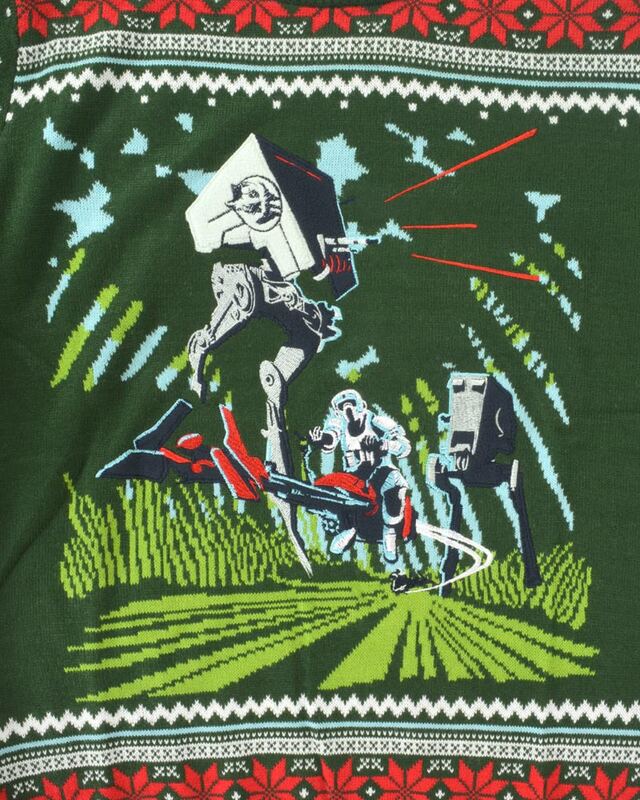 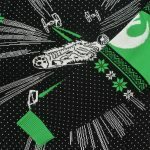 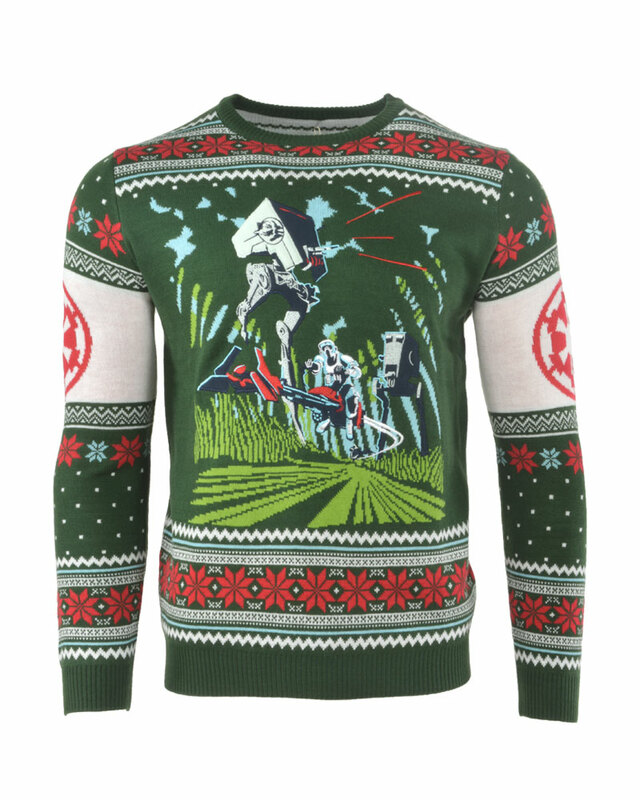 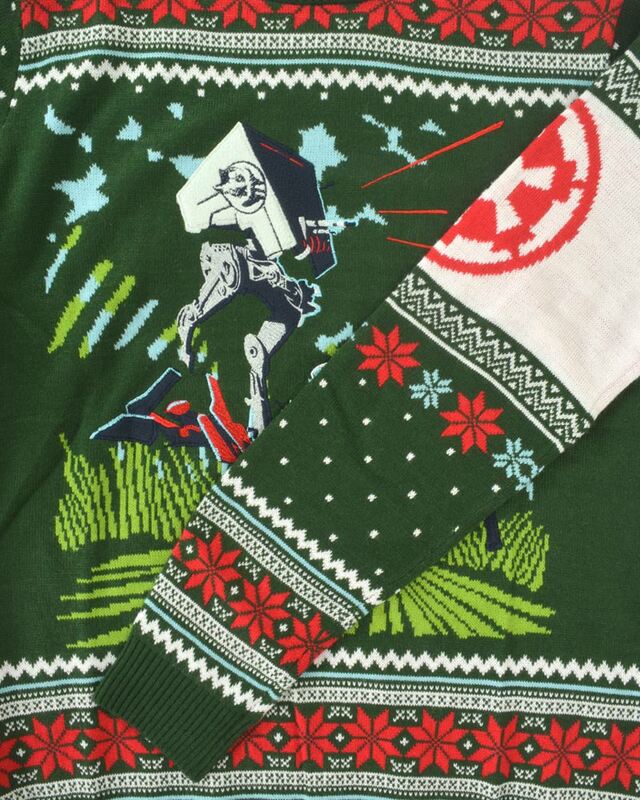 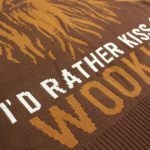 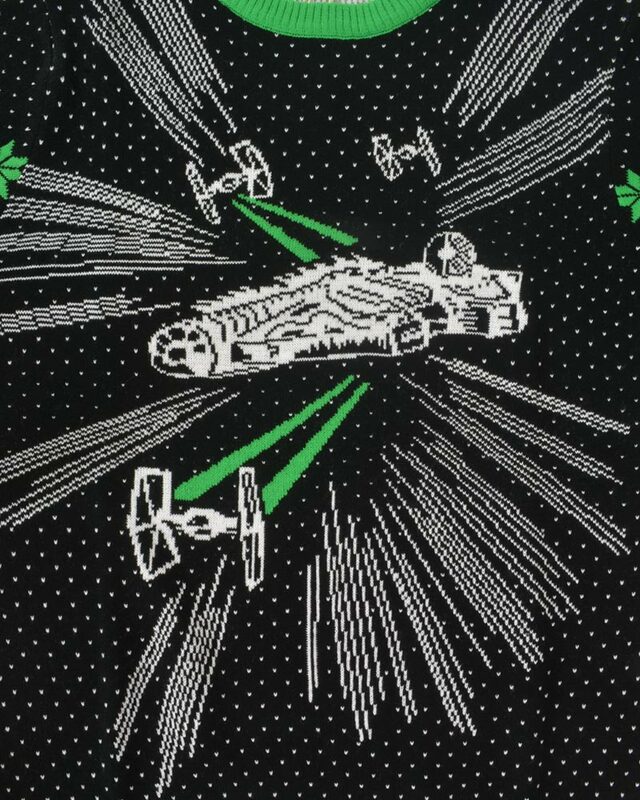 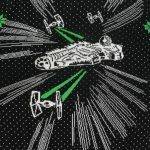 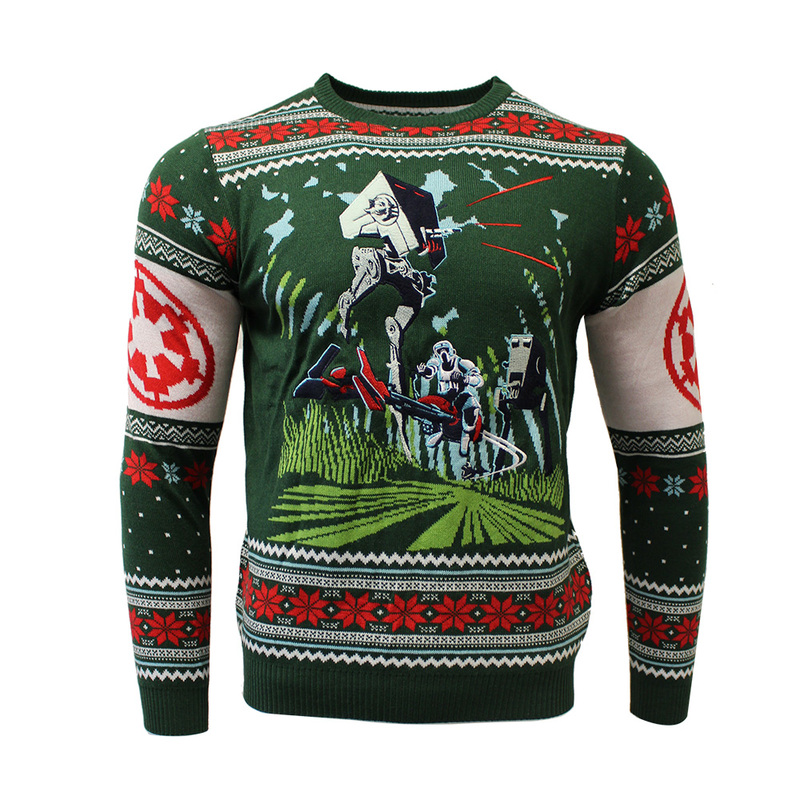 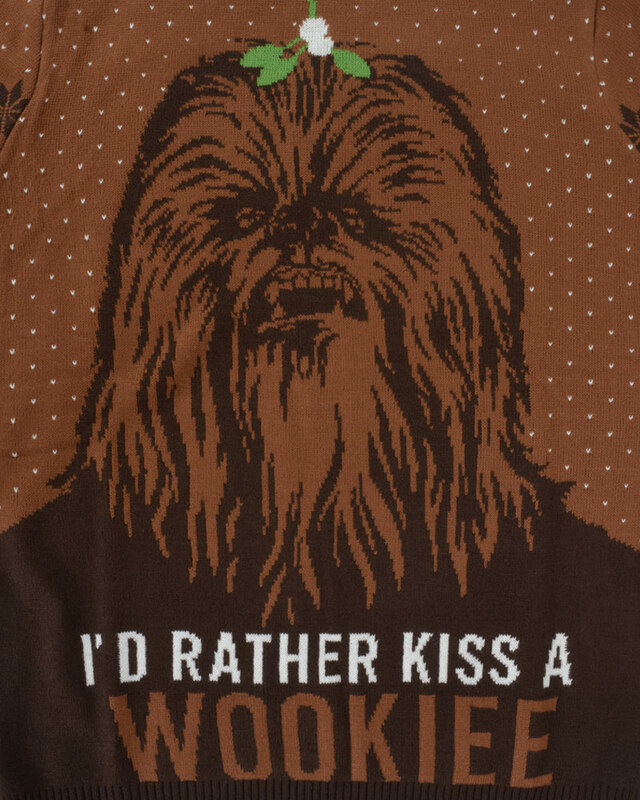 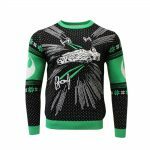 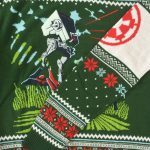 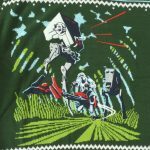 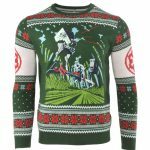 Amazon/other: This officially licensed Star Wars Christmas jumper, depicting the famous Battle of Endor scene from the original trilogy, is the ideal Xmas sweater for any Star Wars fan. 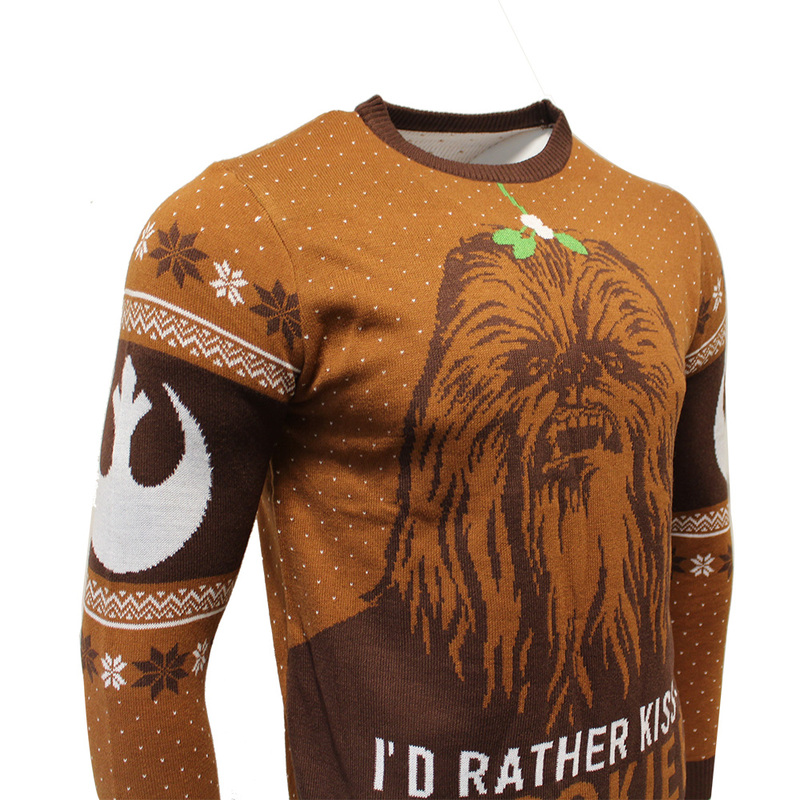 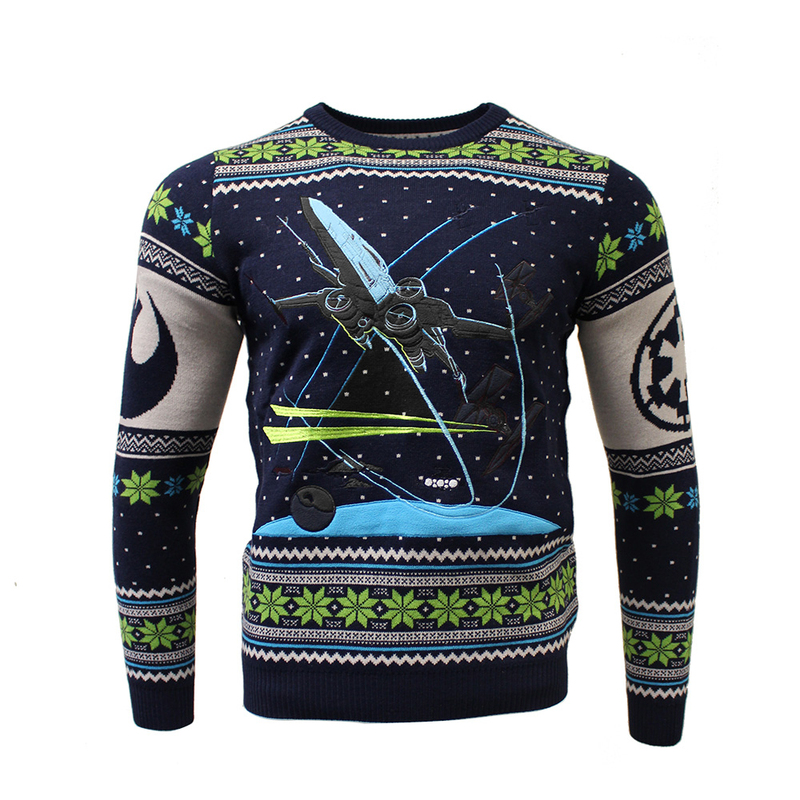 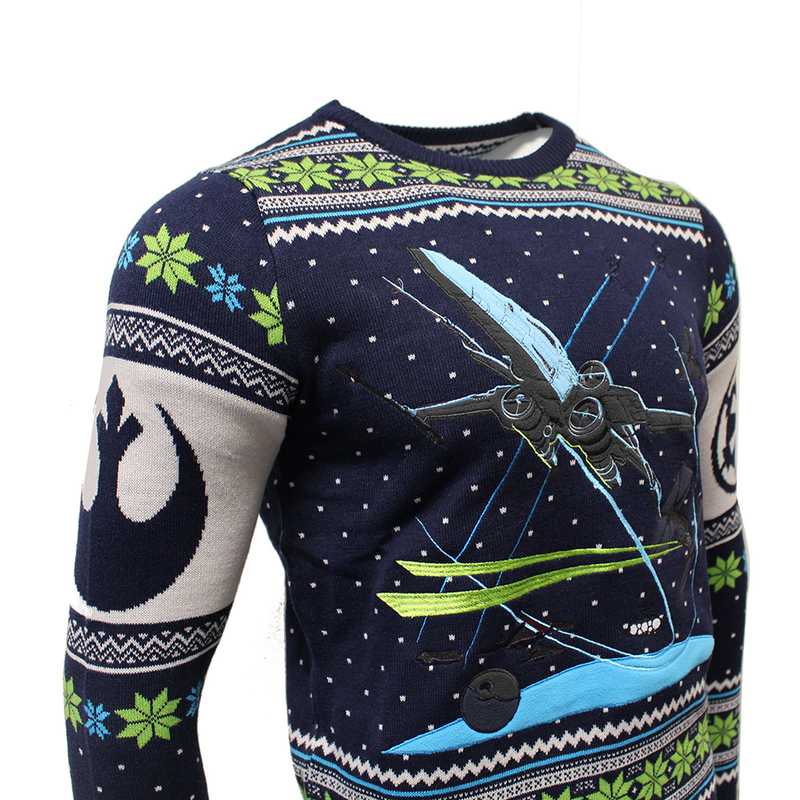 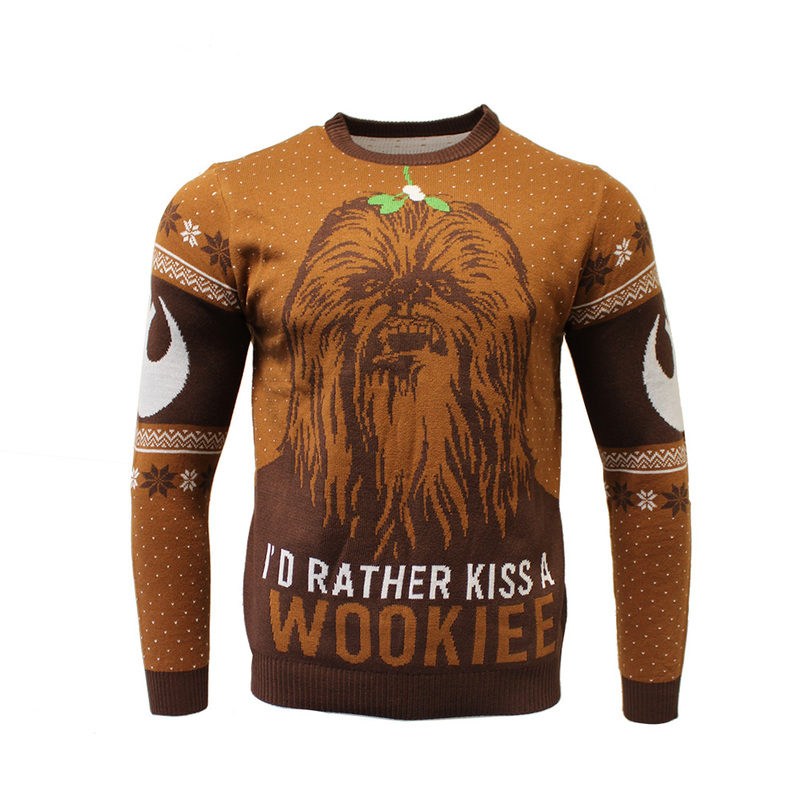 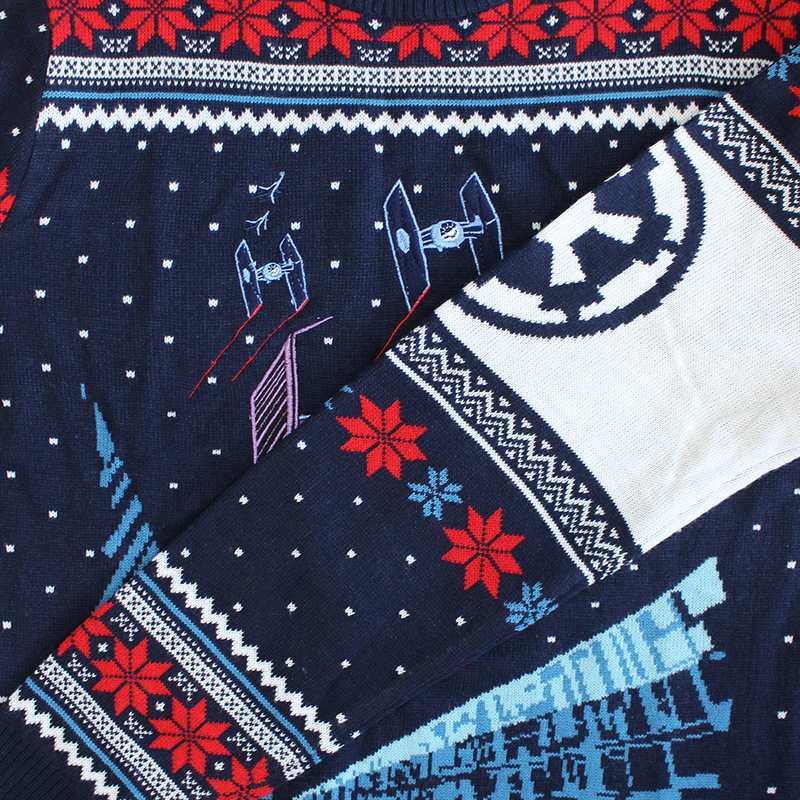 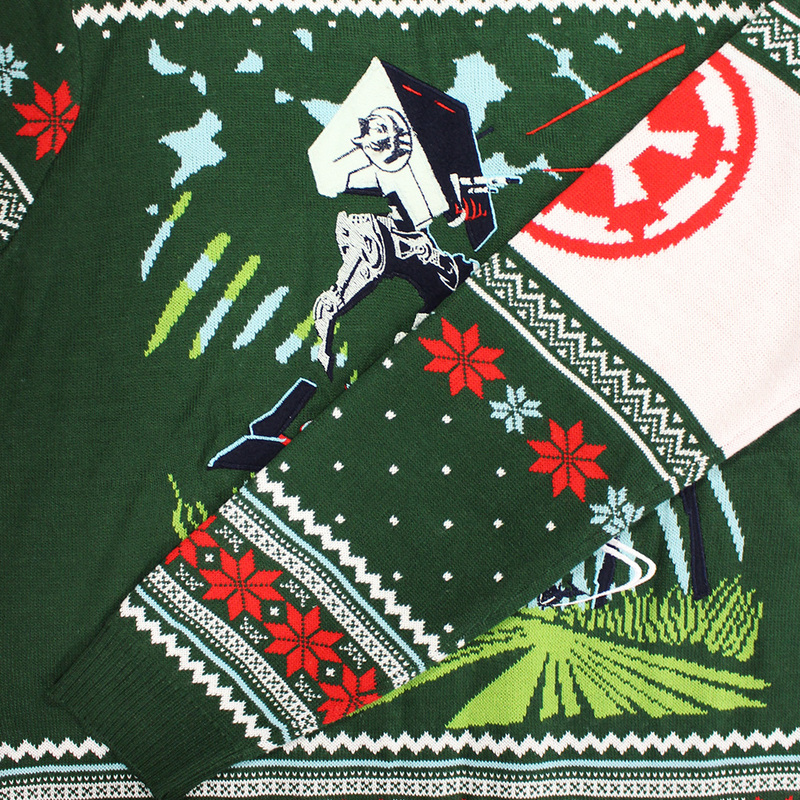 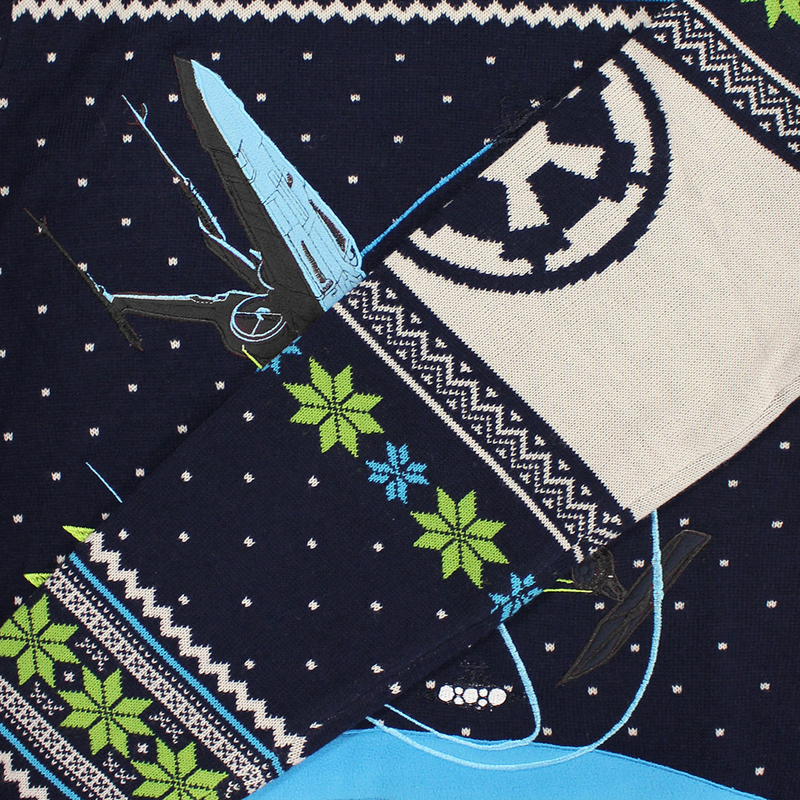 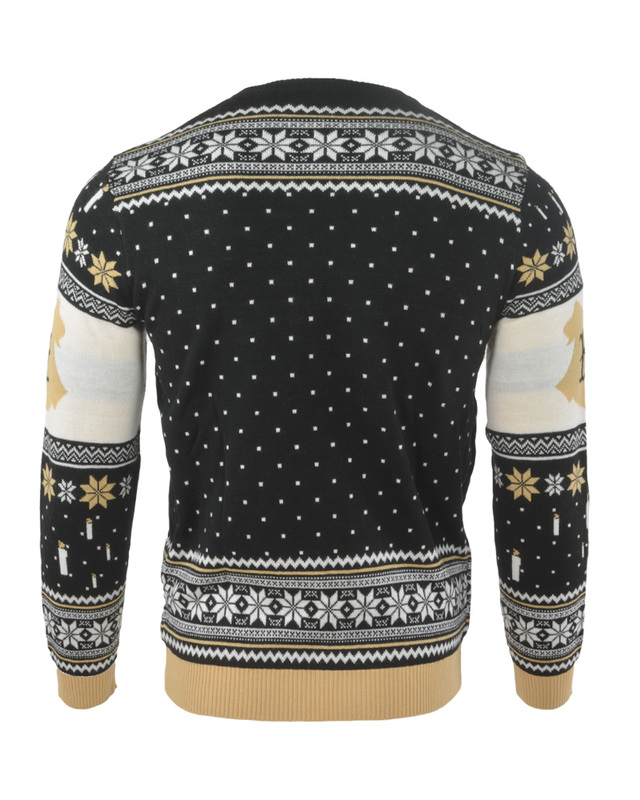 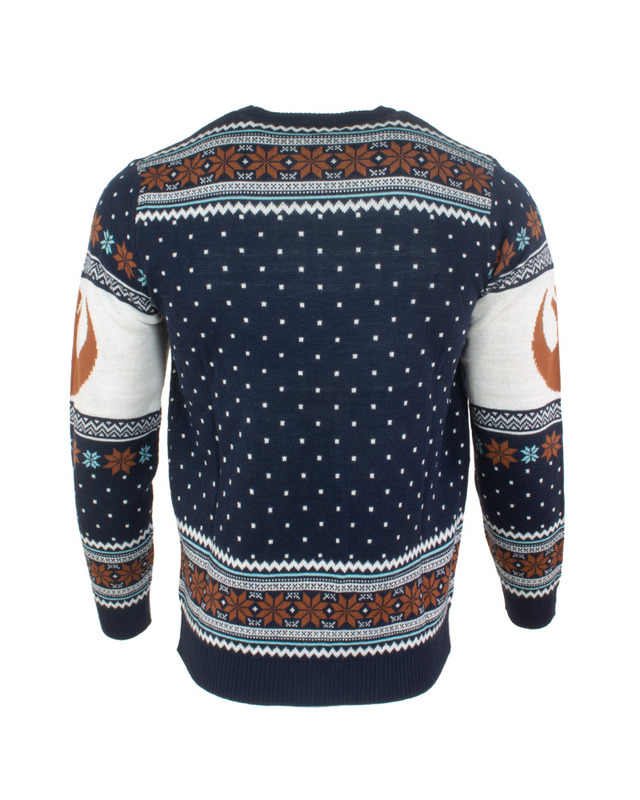 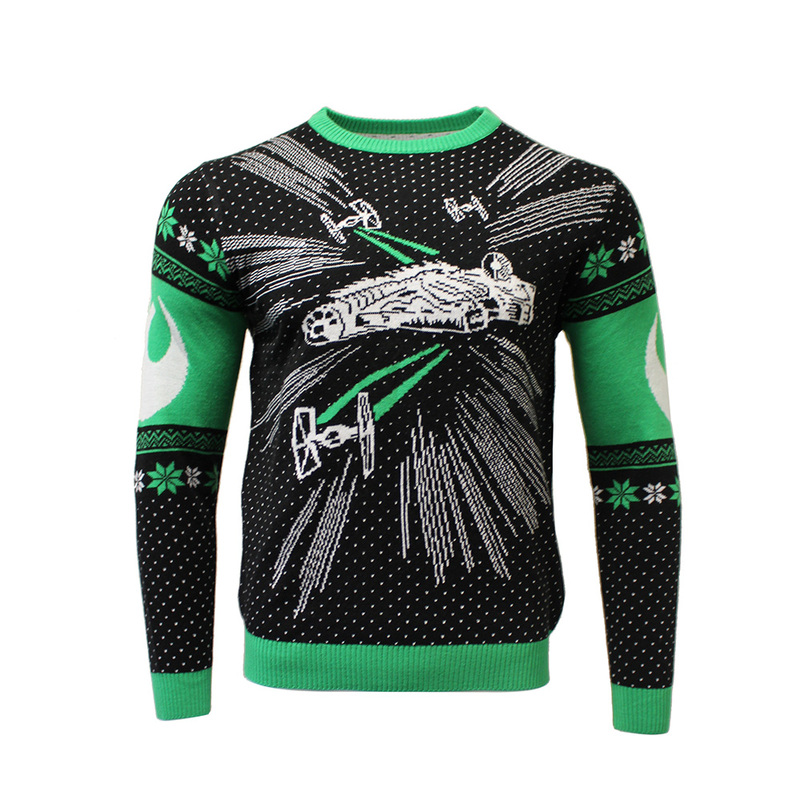 A high quality knitted jumper with embroidered designs, celebrate everything to do with the Force this Xmas with this warm sweater! 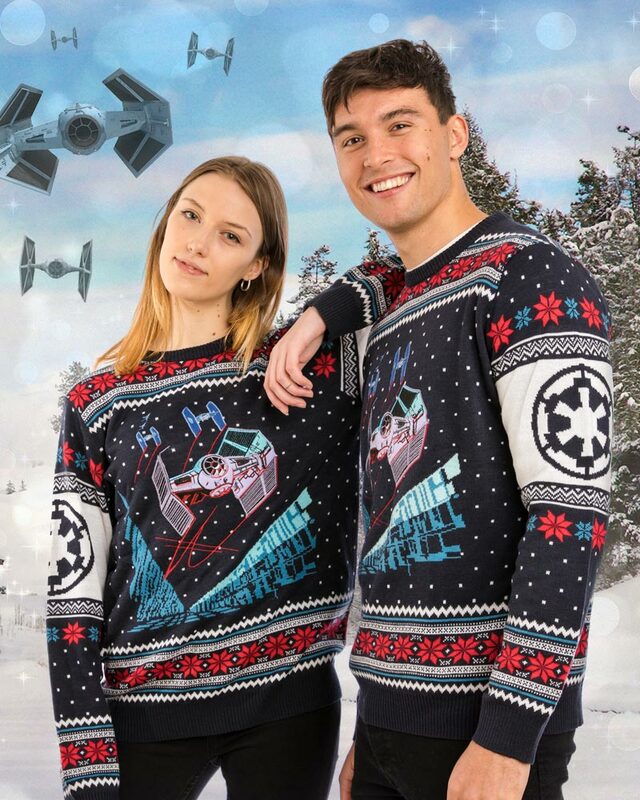 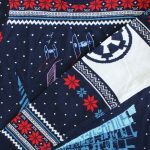 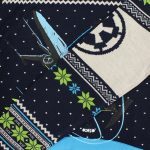 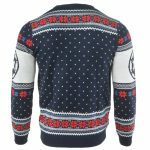 Amazon/other: This officially licensed Star Wars Christmas jumper, depicting a TIE Fighter from the famous Battle of Yavin scene from the original trilogy, is the ideal Xmas sweater for any Star Wars fan. 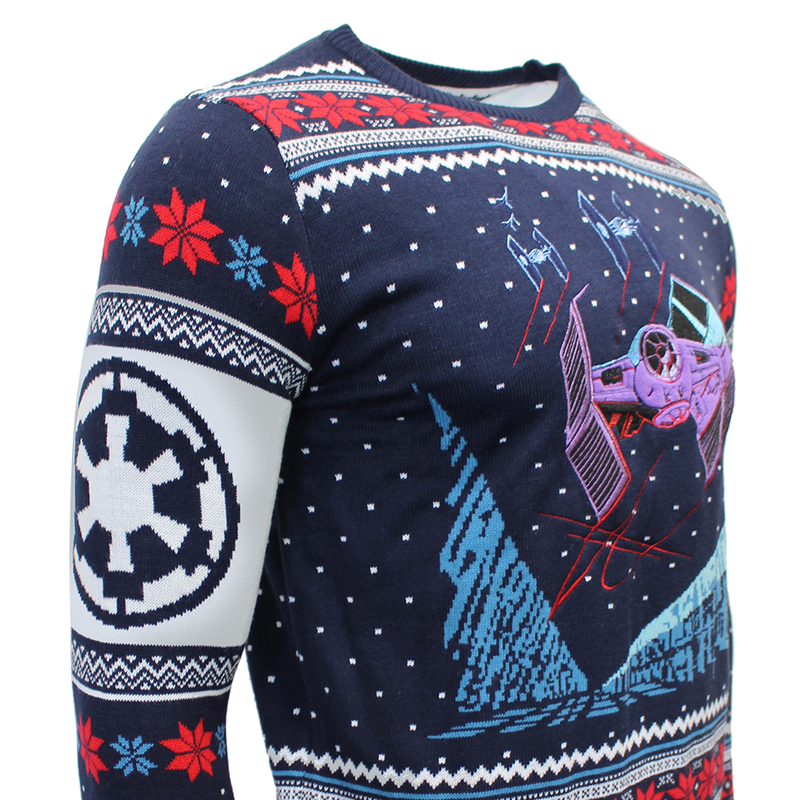 A high quality knitted jumper with embroidered designs, celebrate everything to do with the Force this Xmas with this warm sweater! 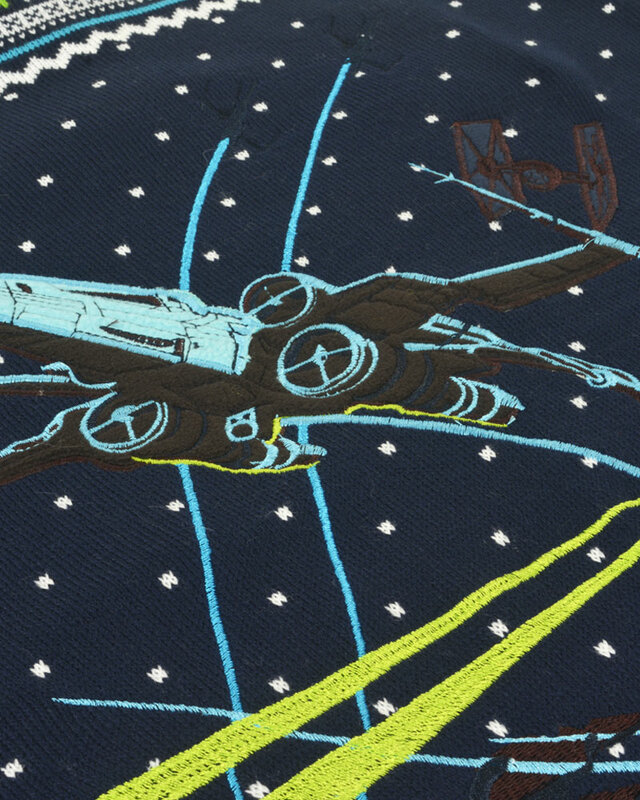 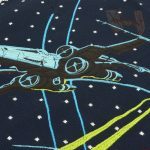 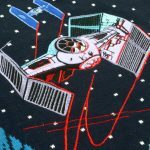 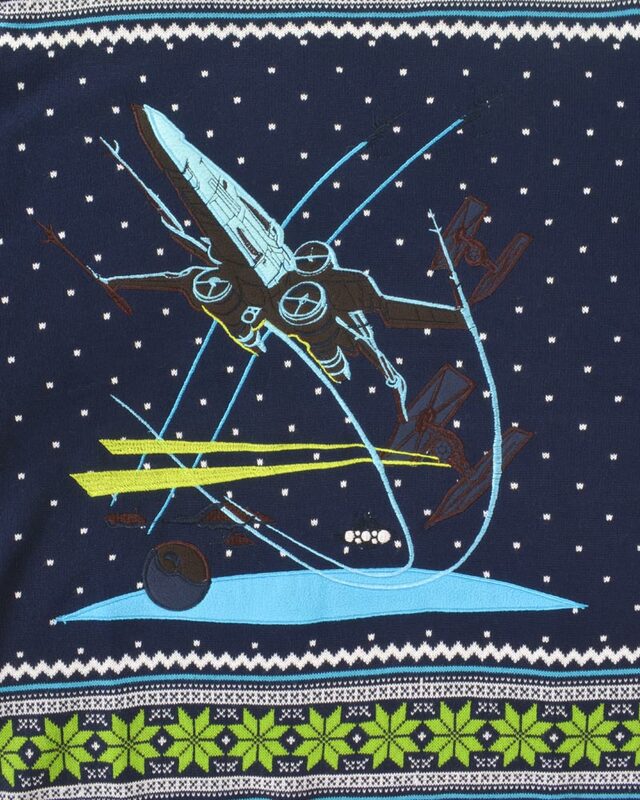 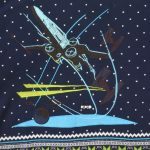 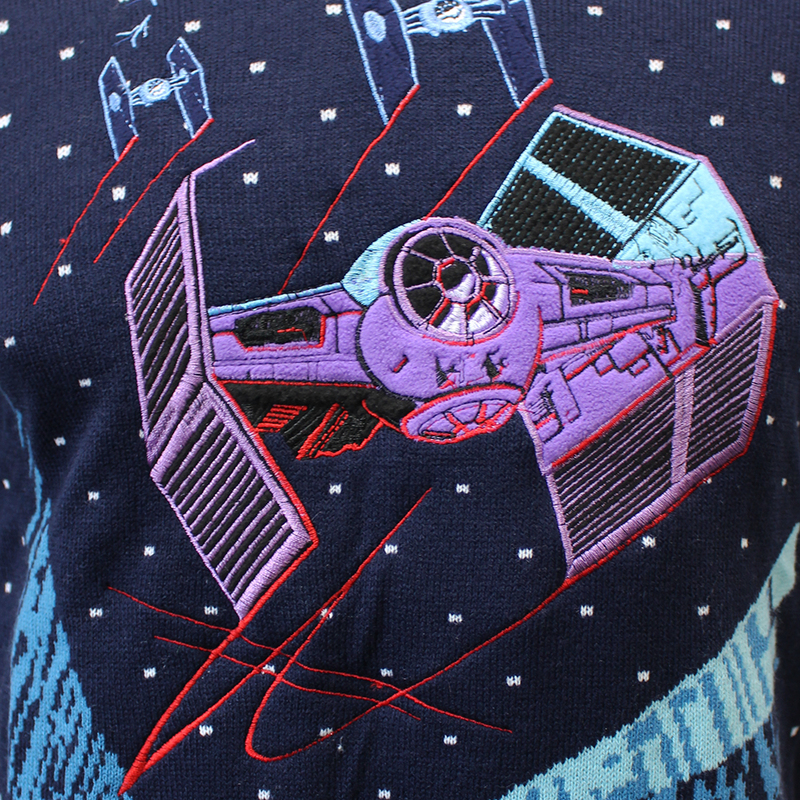 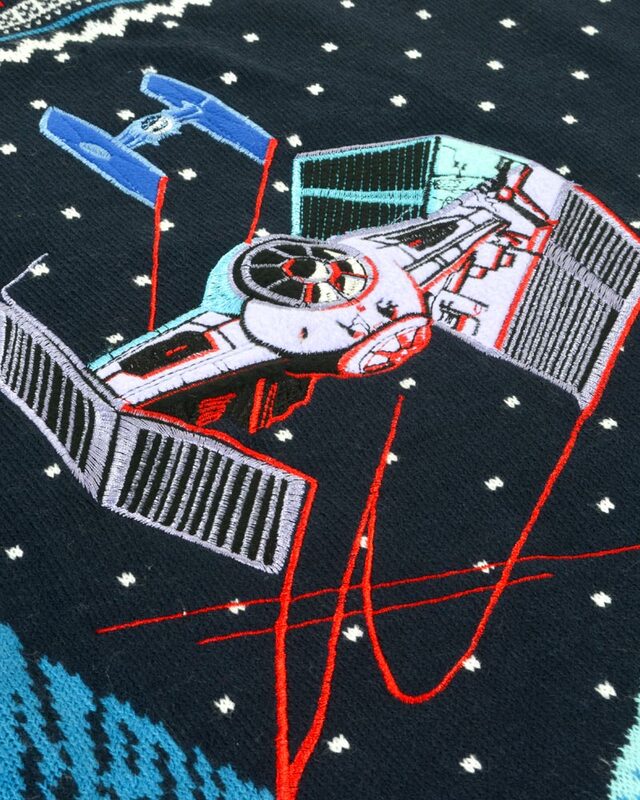 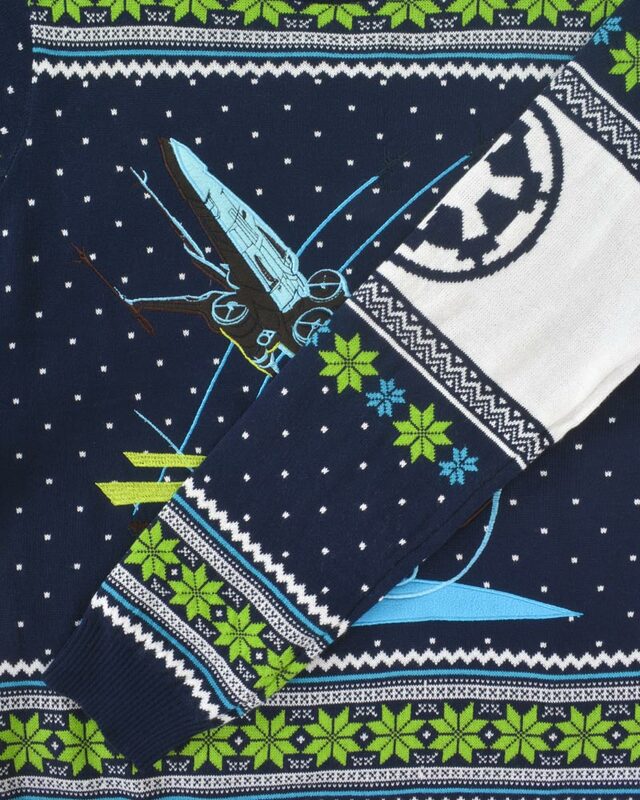 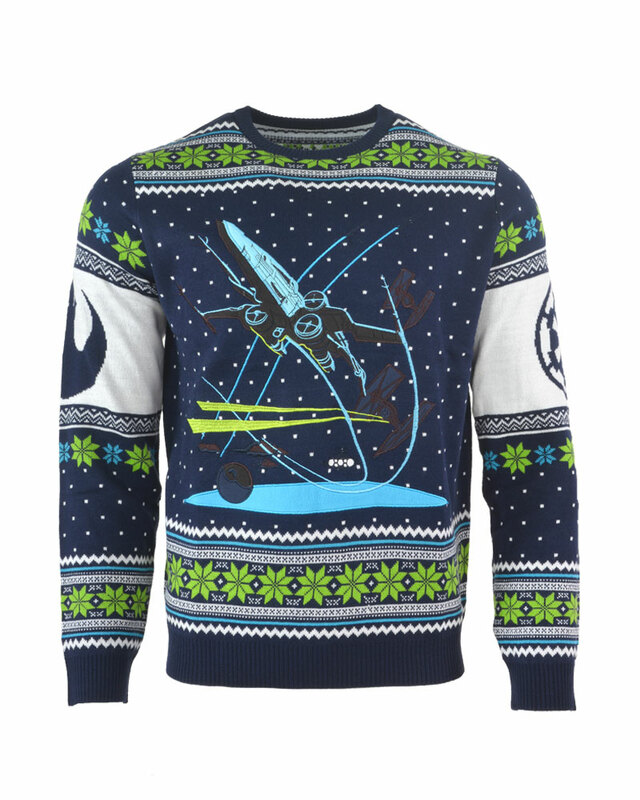 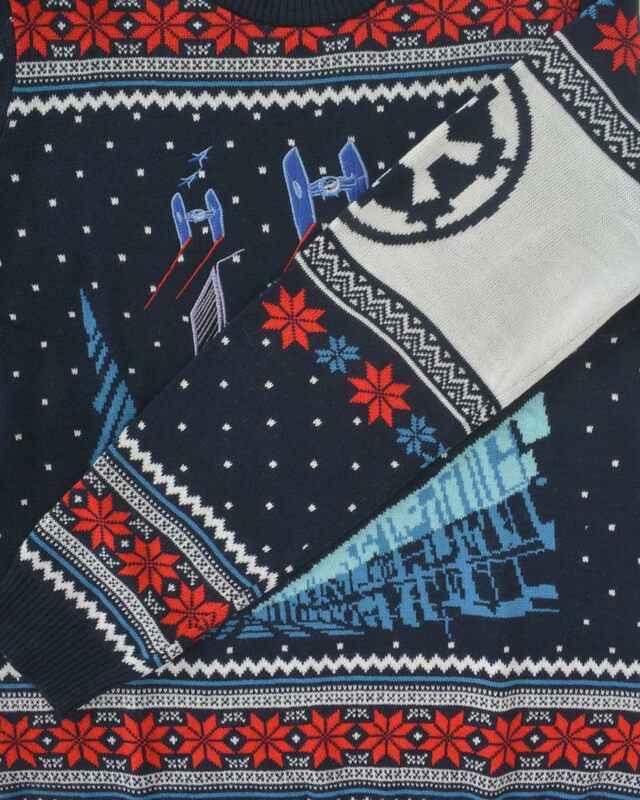 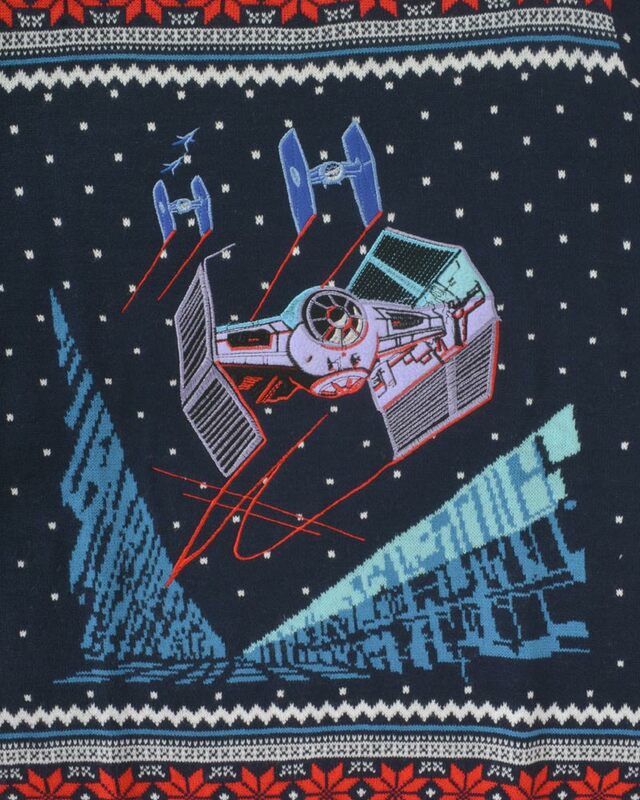 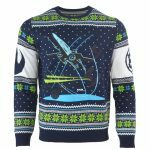 Amazon/other: This officially licensed Star Wars Christmas jumper, depicting an X-Wing from the famous Battle of Yavin scene from the original trilogy, is the ideal Xmas sweater for any Star Wars fan. A high quality knitted jumper with embroidered designs, celebrate everything to do with the Force this Xmas with this warm sweater! 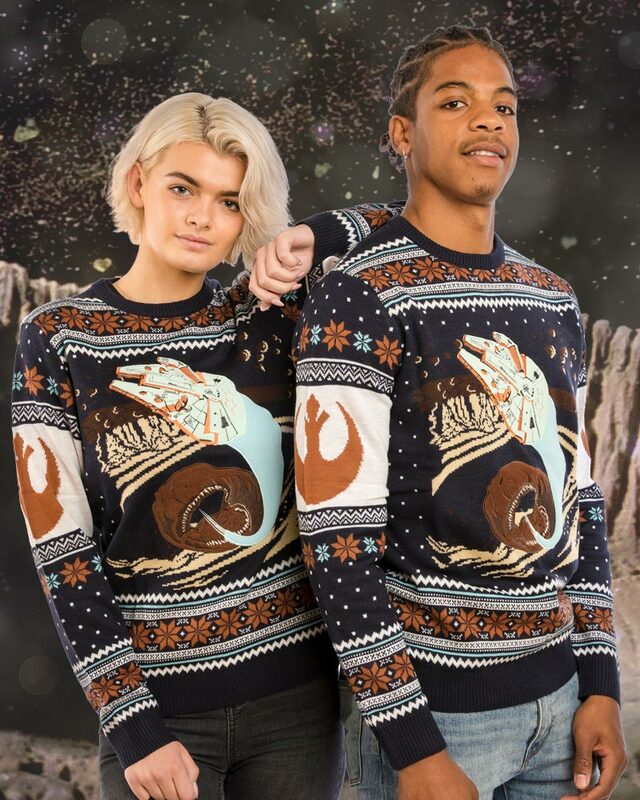 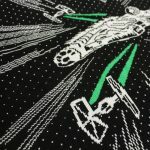 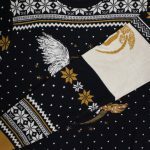 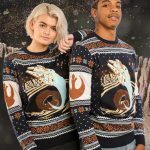 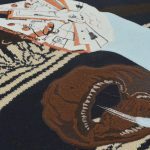 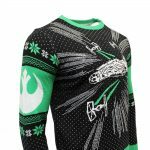 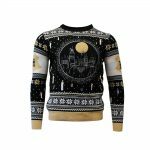 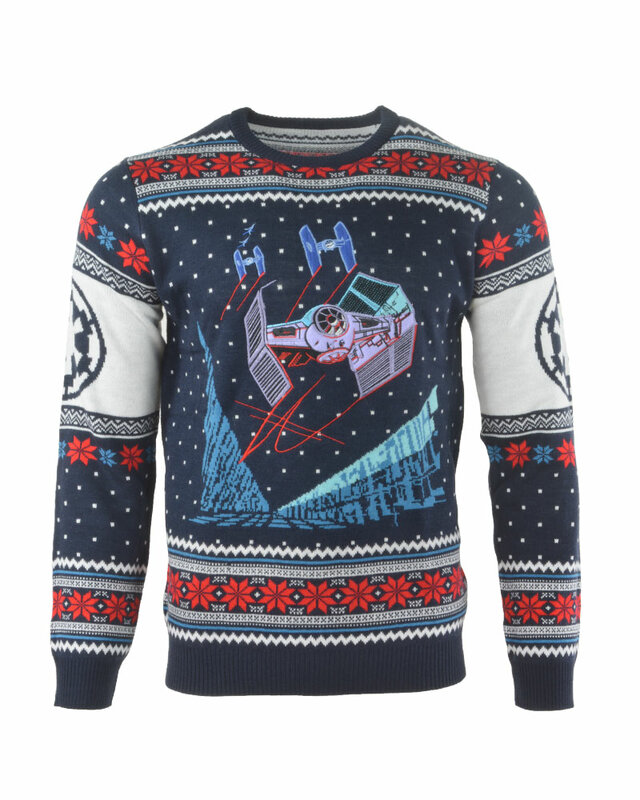 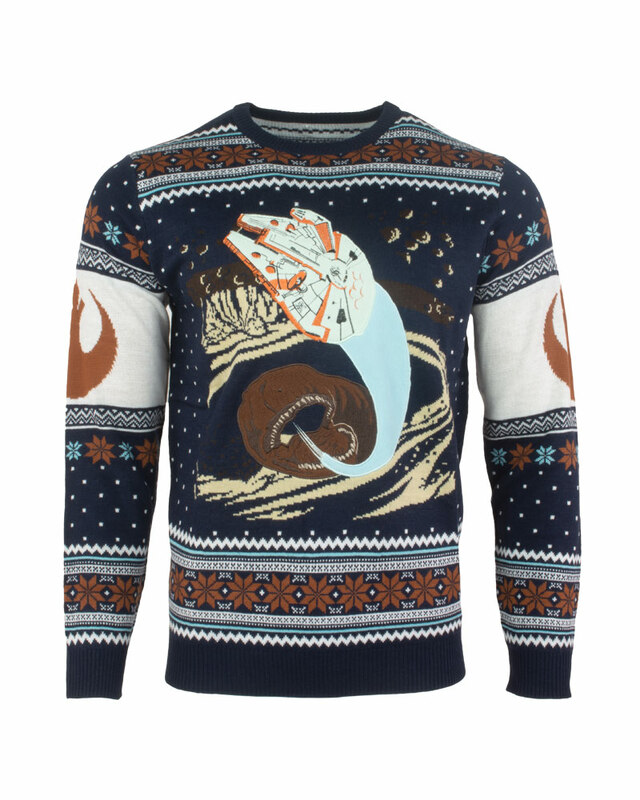 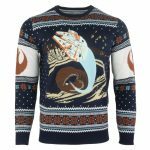 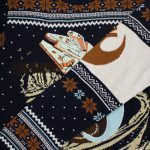 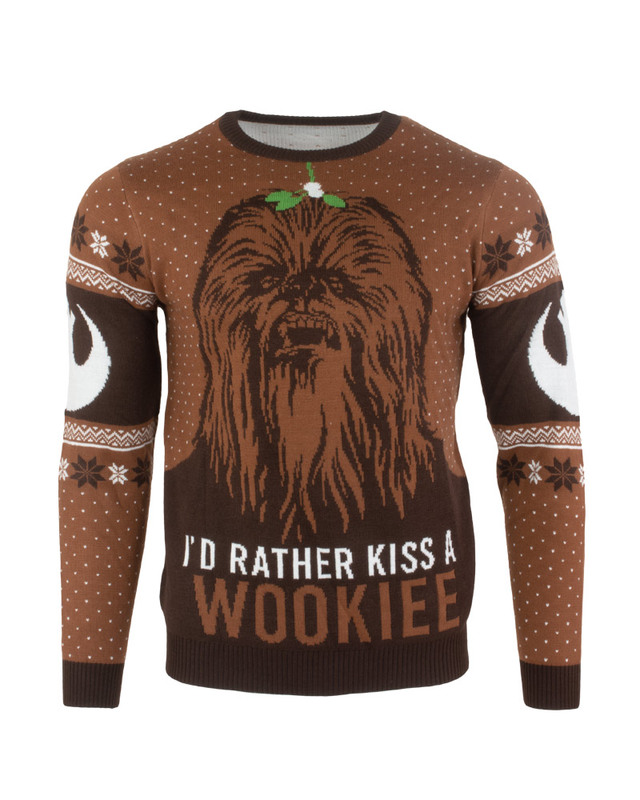 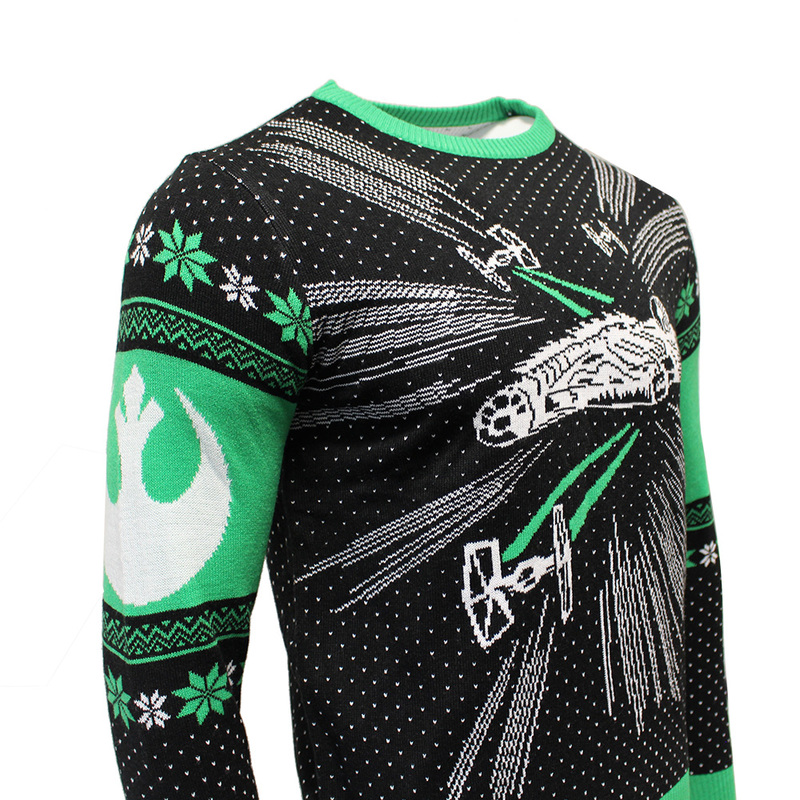 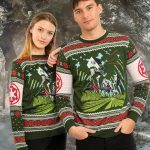 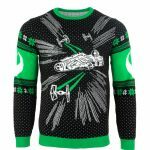 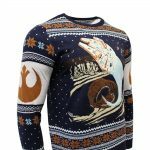 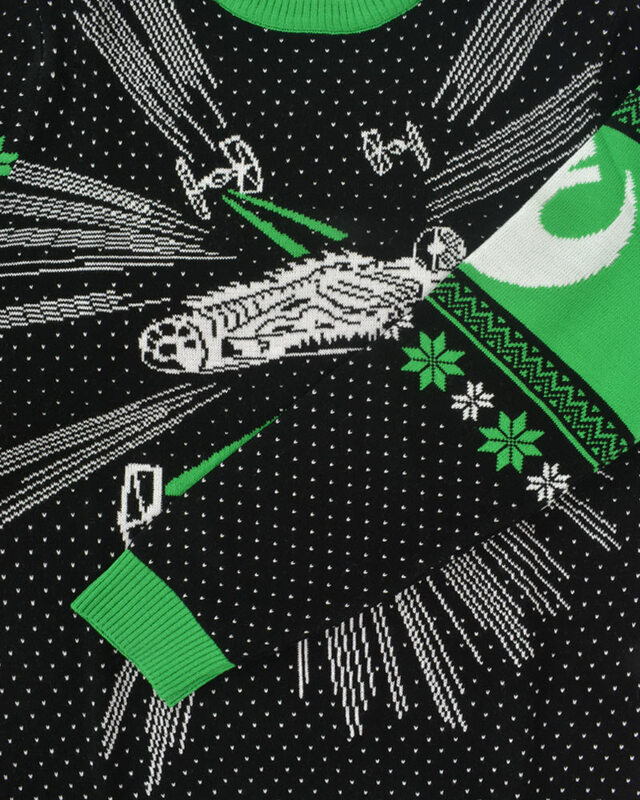 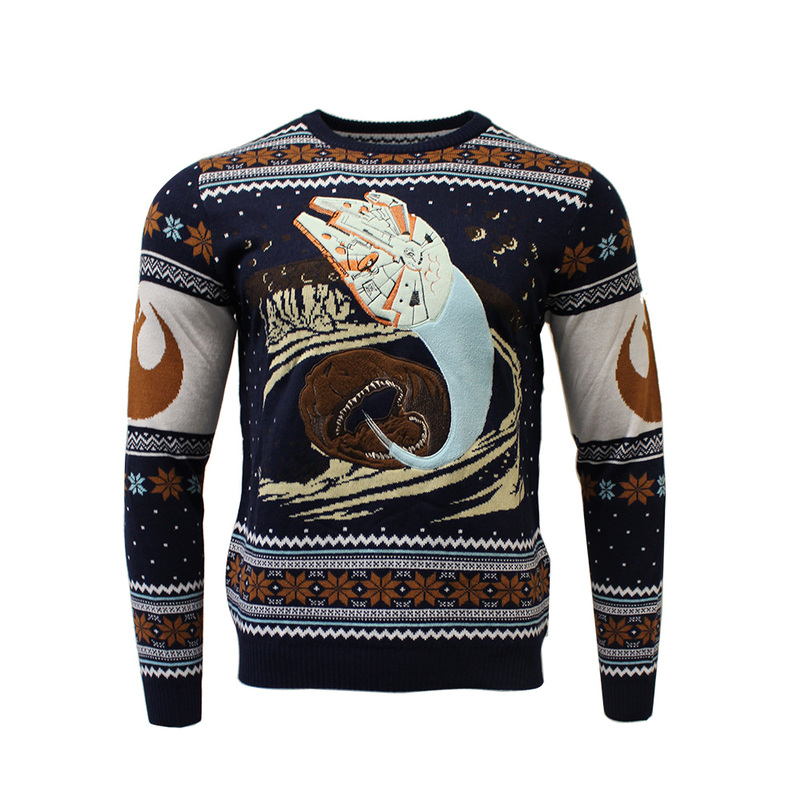 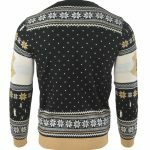 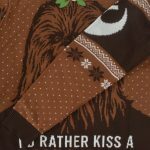 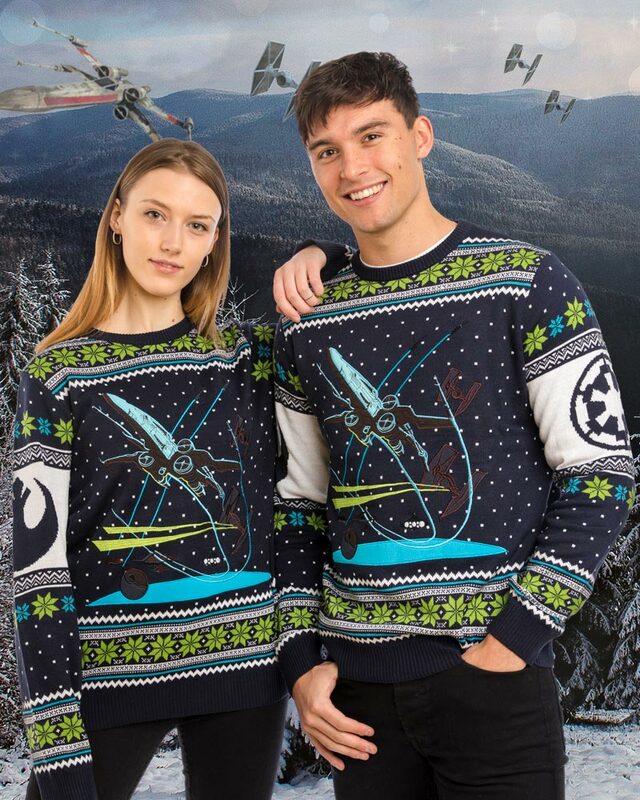 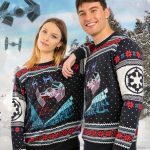 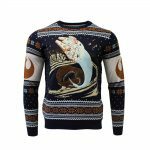 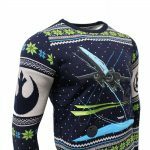 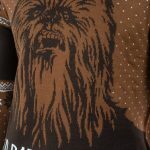 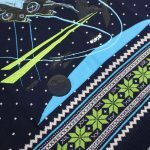 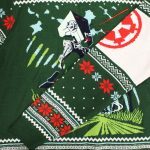 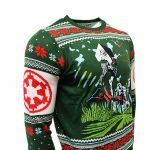 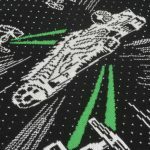 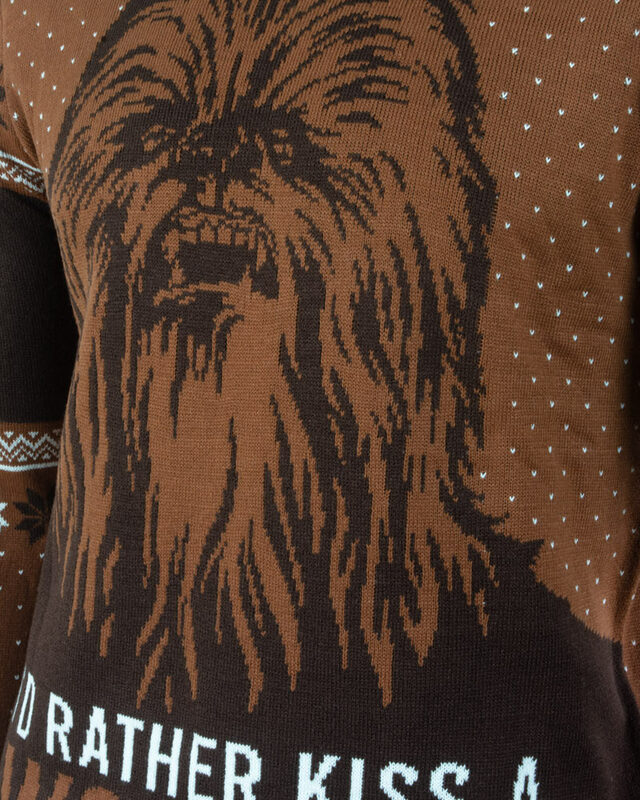 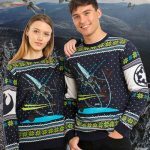 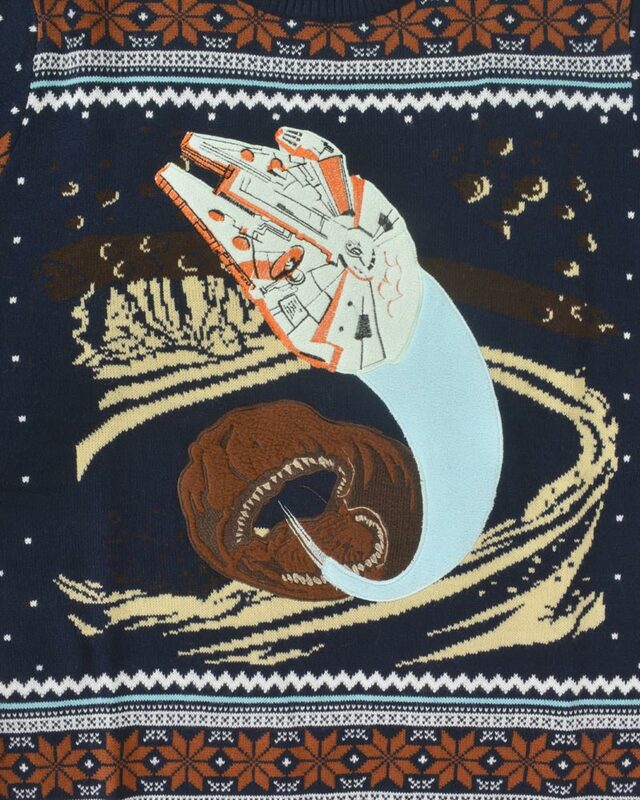 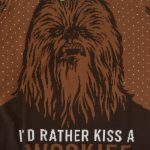 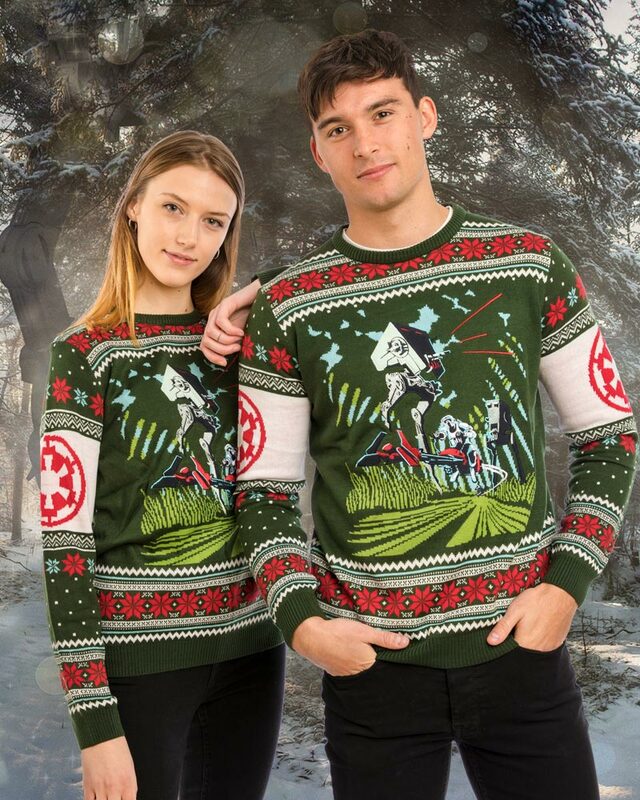 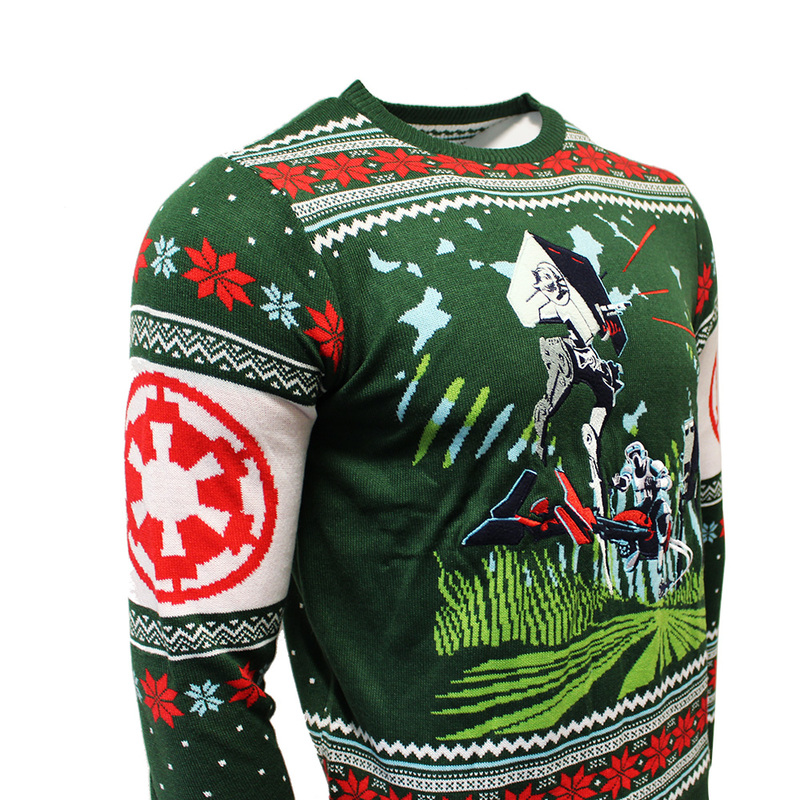 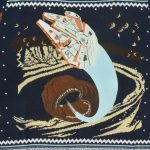 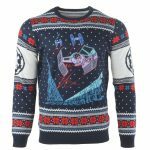 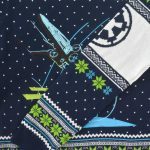 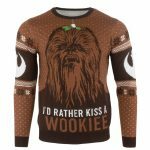 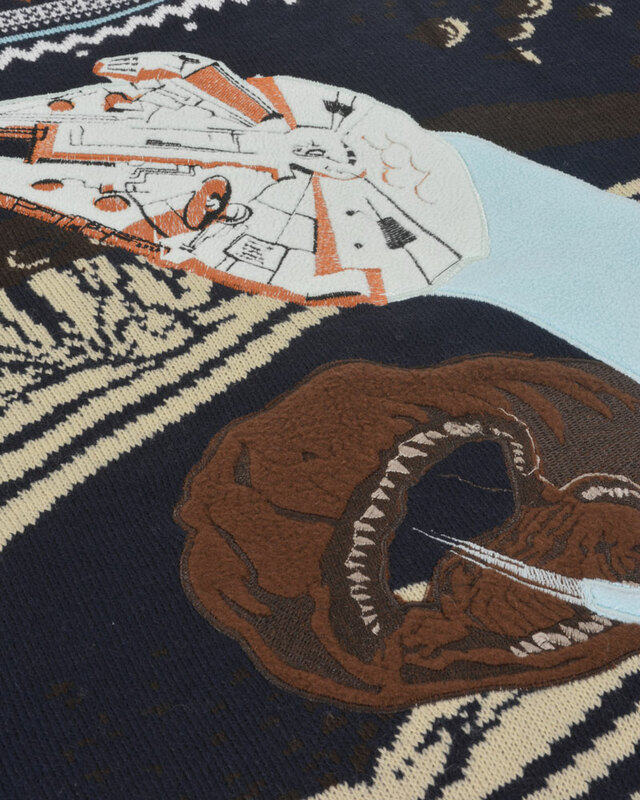 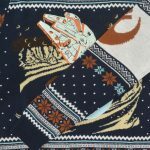 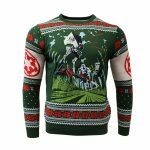 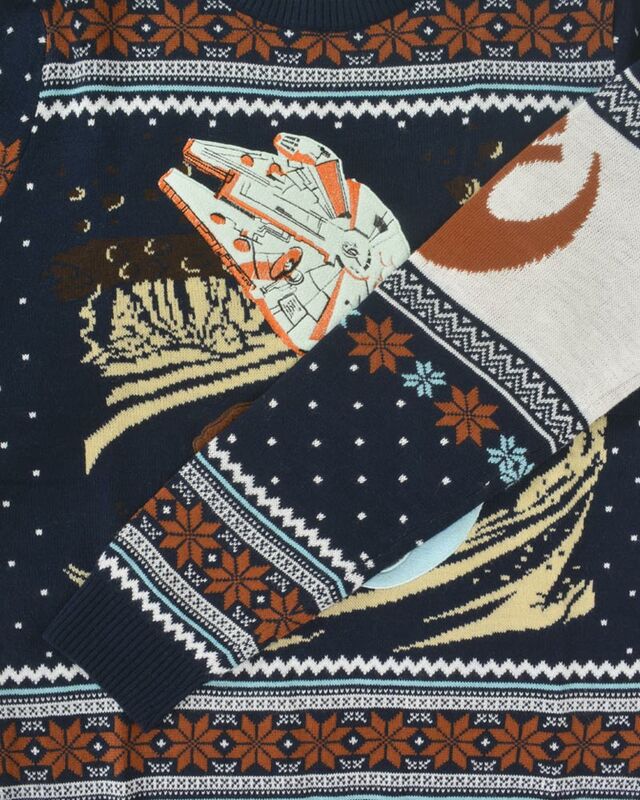 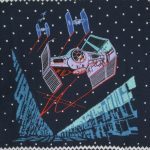 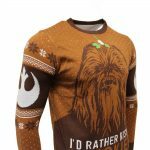 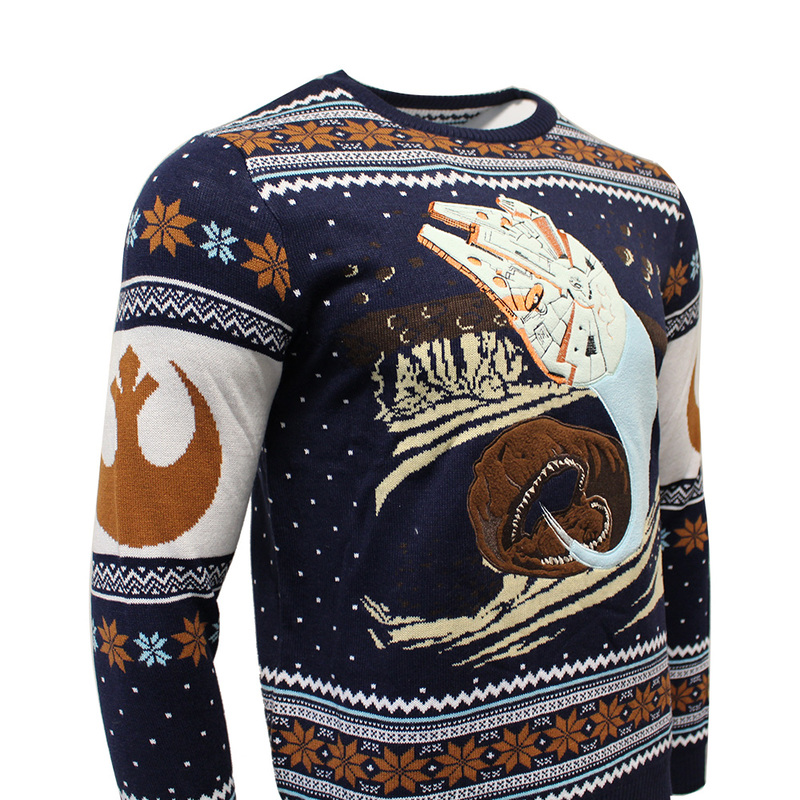 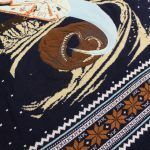 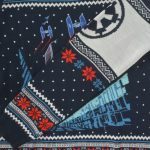 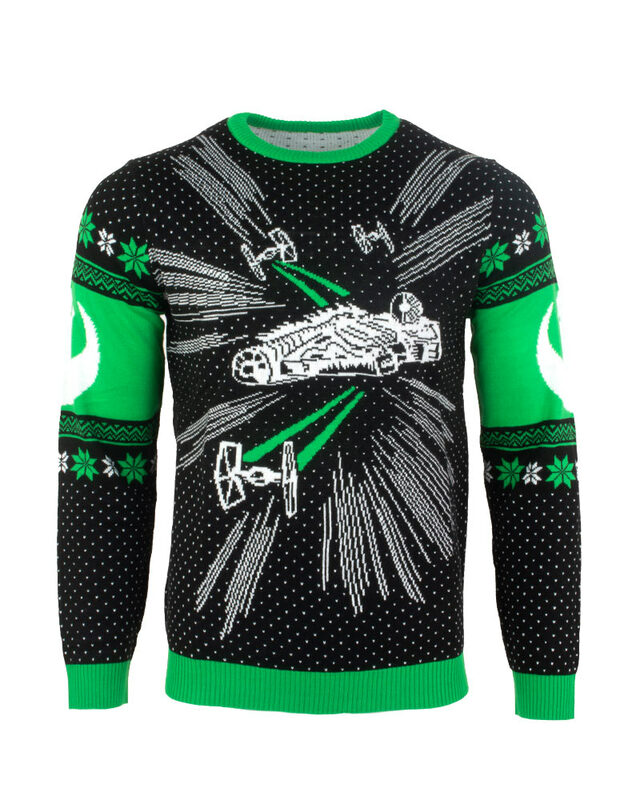 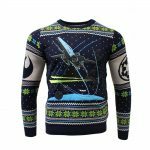 Amazon/other: This officially licensed Star Wars Christmas jumper, depicting a famous Exogorth escape scene from the original trilogy, is the ideal Xmas sweater for any Star Wars fan. 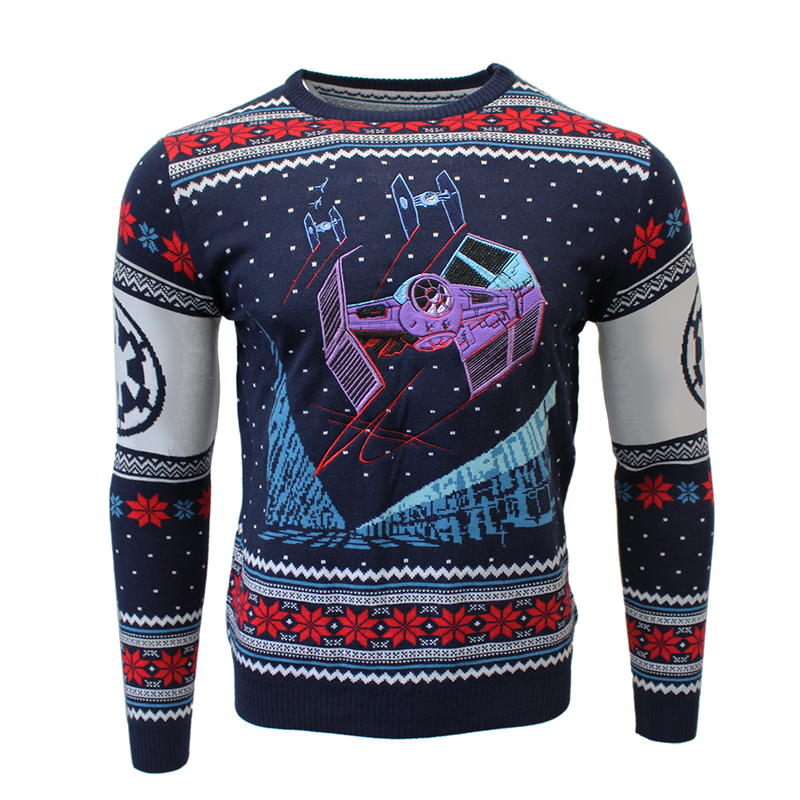 A high quality knitted jumper with embroidered designs, celebrate everything to do with the Force this Xmas with this warm sweater! 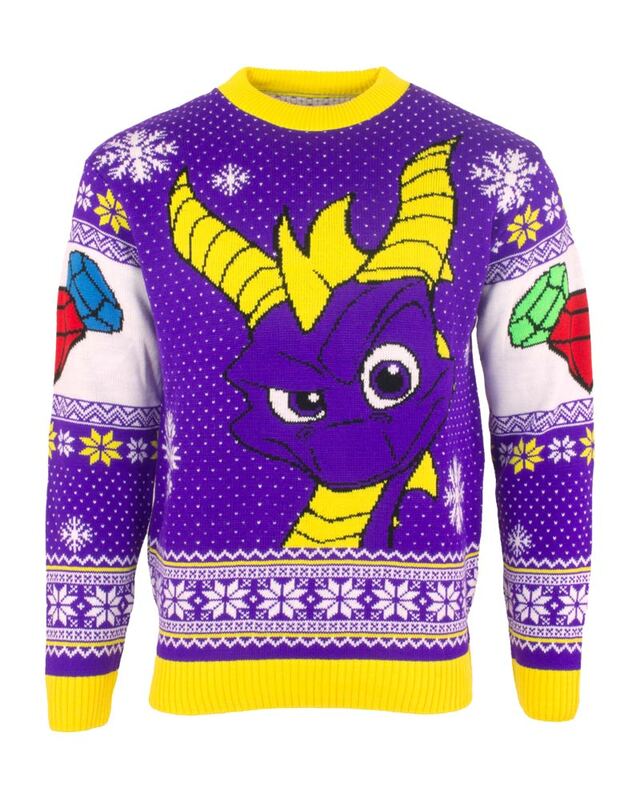 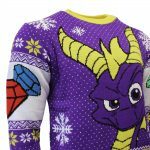 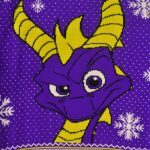 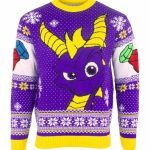 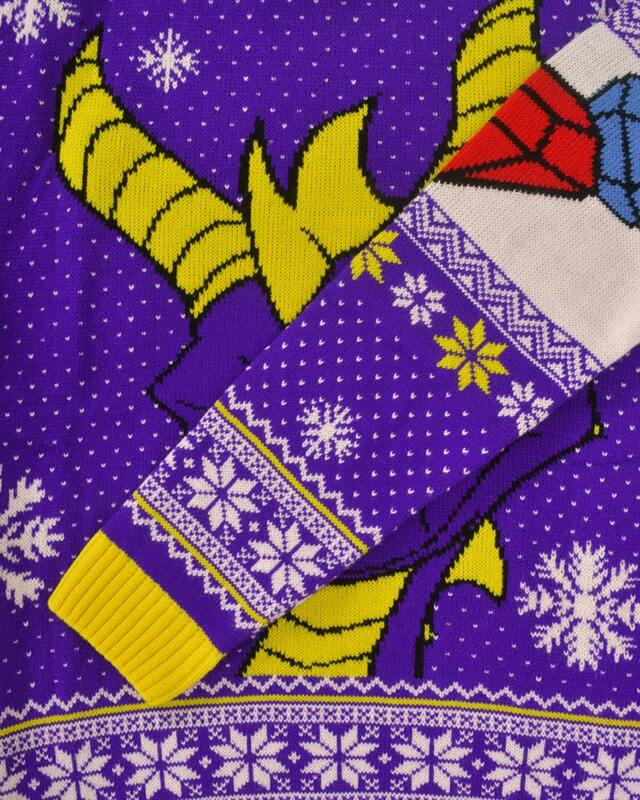 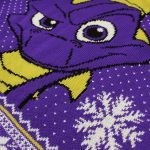 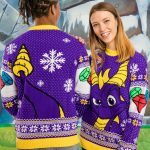 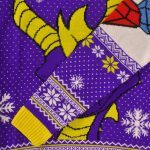 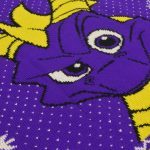 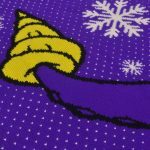 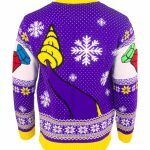 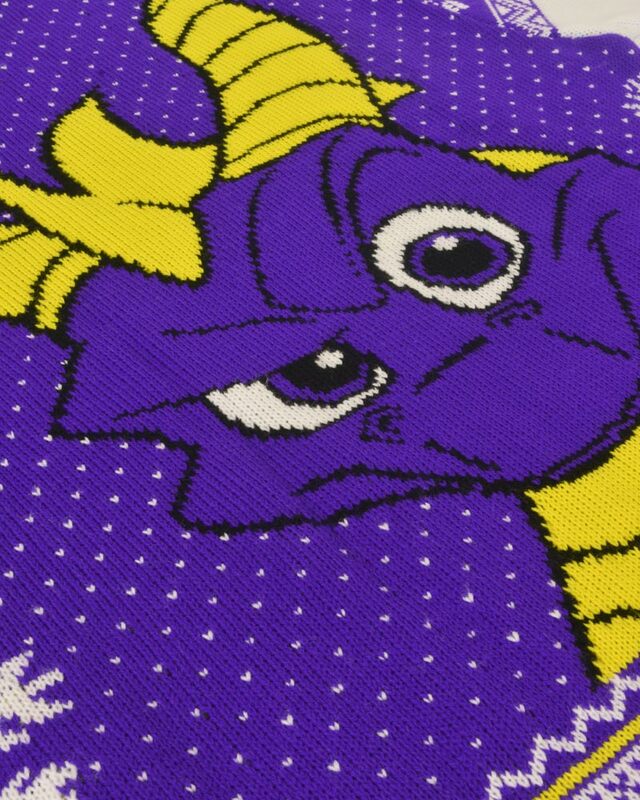 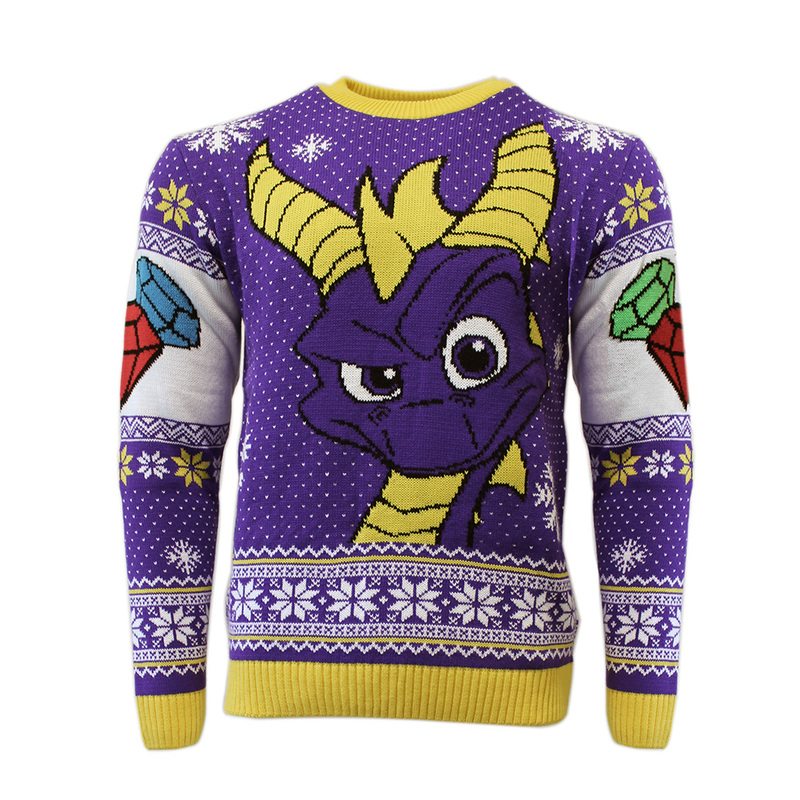 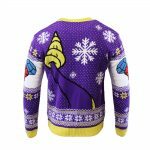 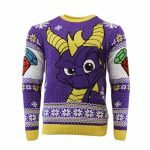 Amazon/other: This officially licensed Spyro the Dragon Christmas jumper is a 100% knitted sweater based on everybody’s favourite video game dragon! 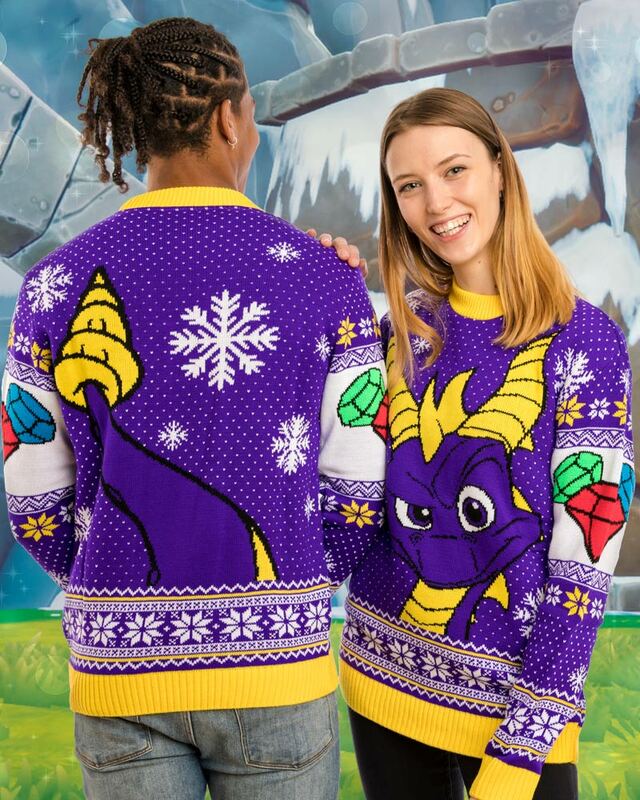 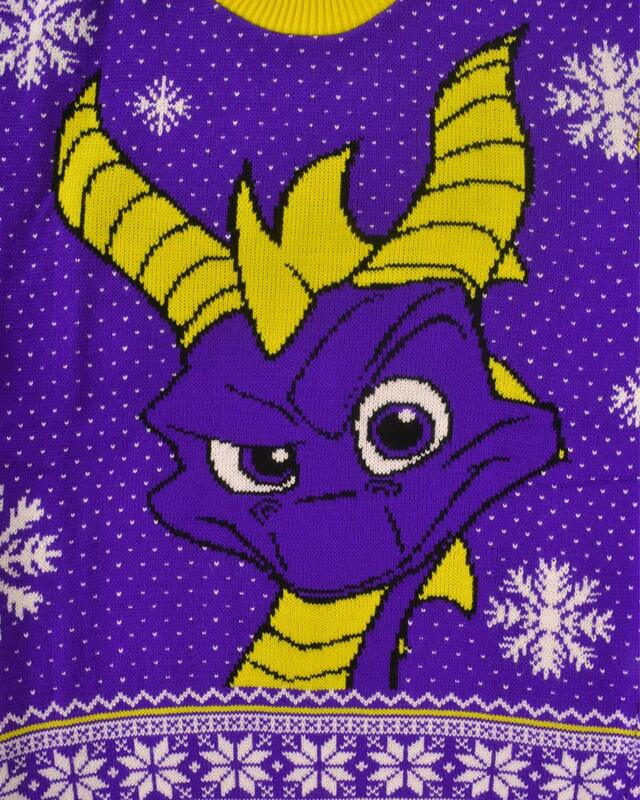 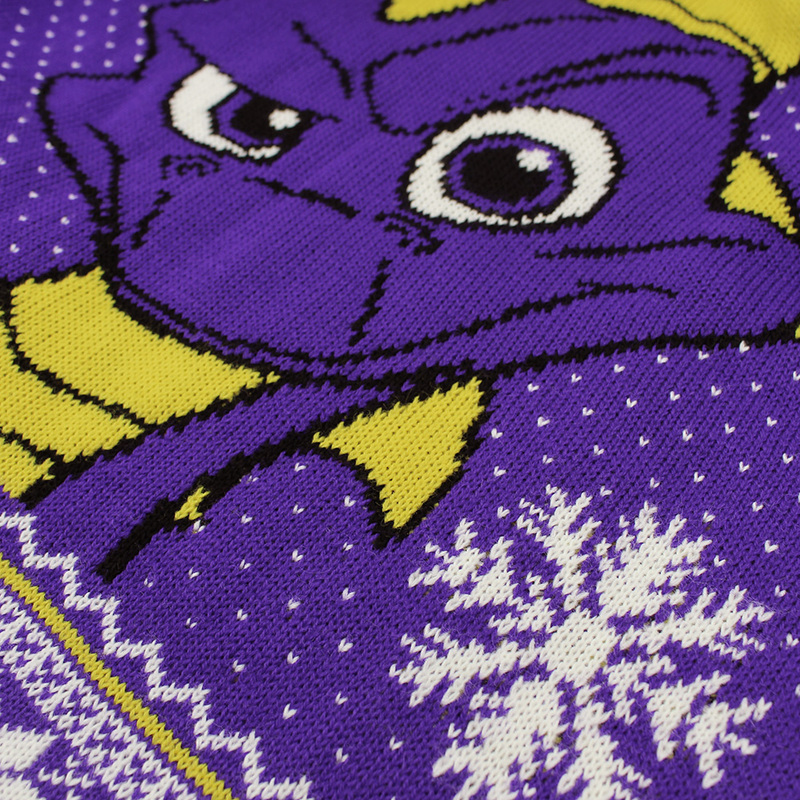 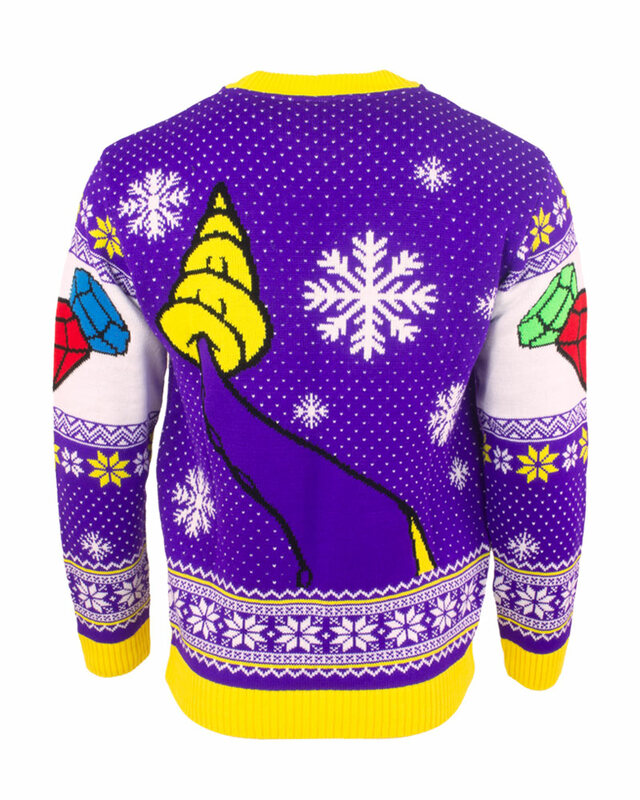 Featuring the cheeky grin from Spyro on the front, his tail on the back, and gem features on the sleeves, this is the ideal Xmas sweater for every fan! 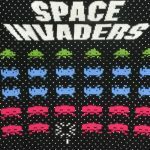 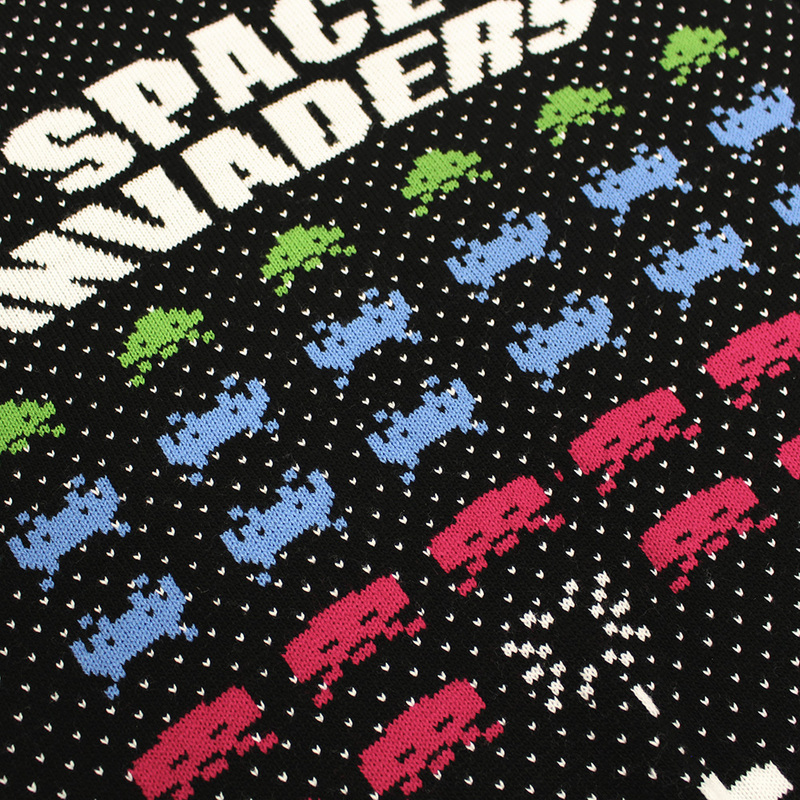 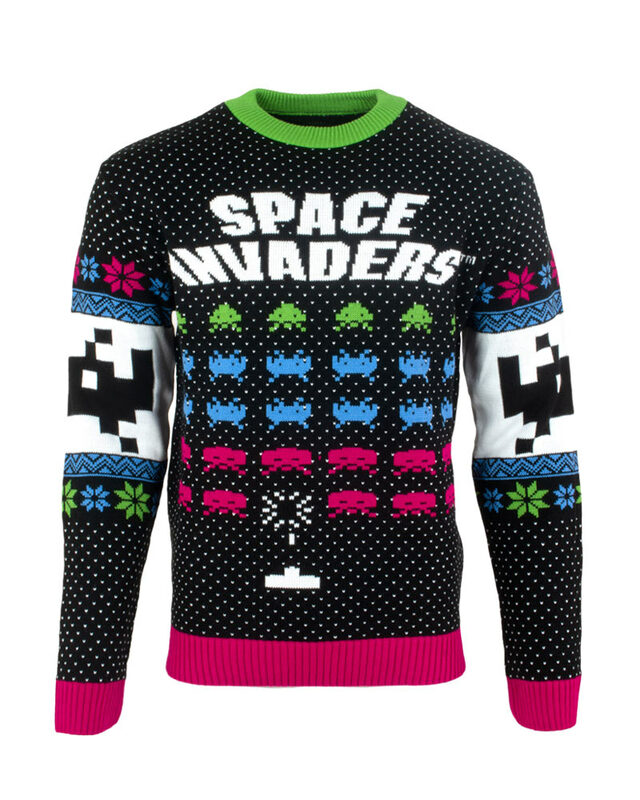 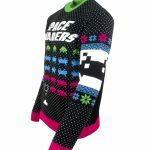 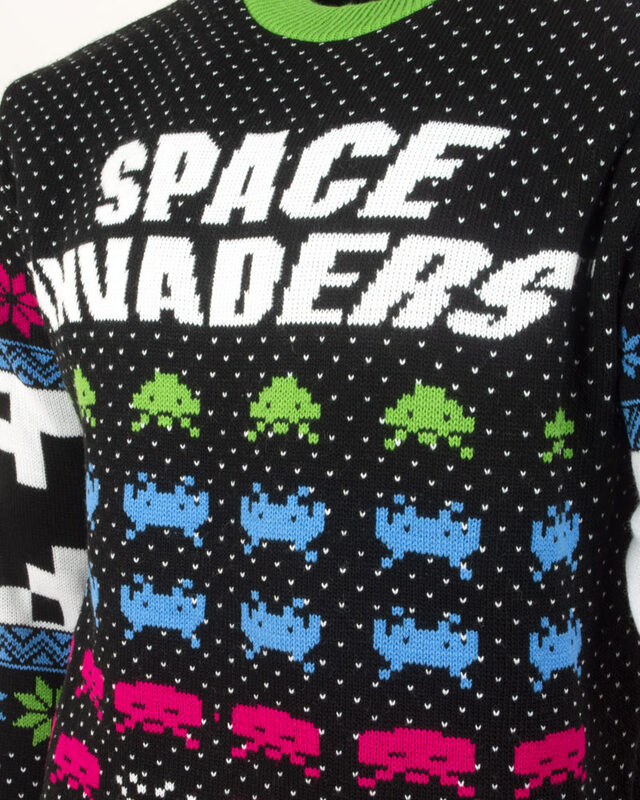 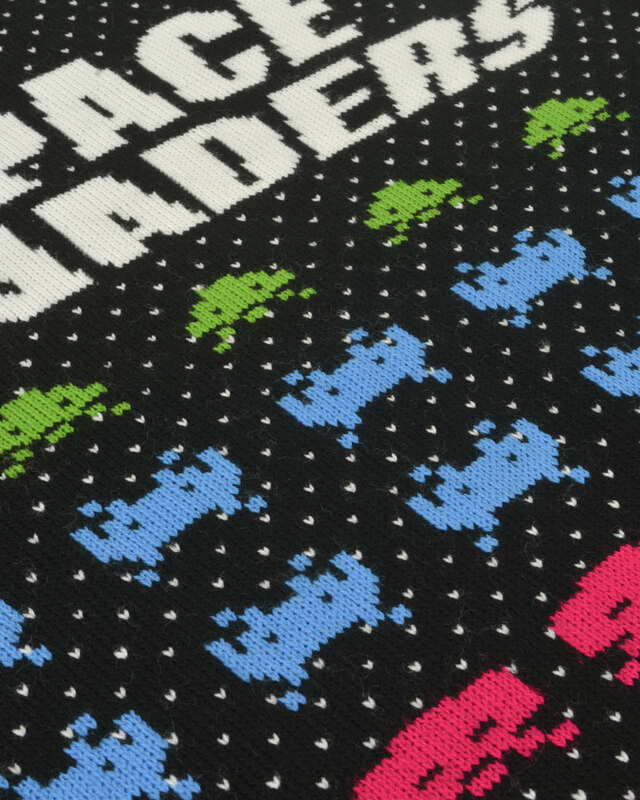 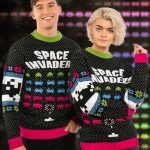 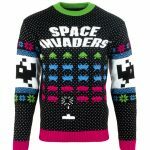 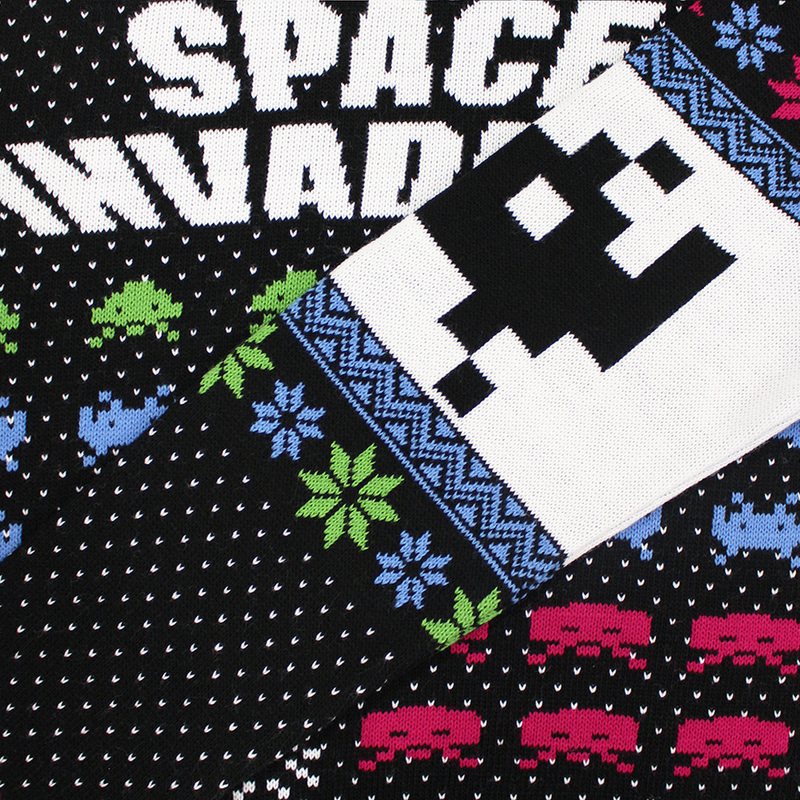 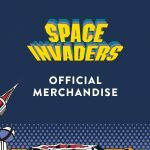 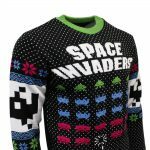 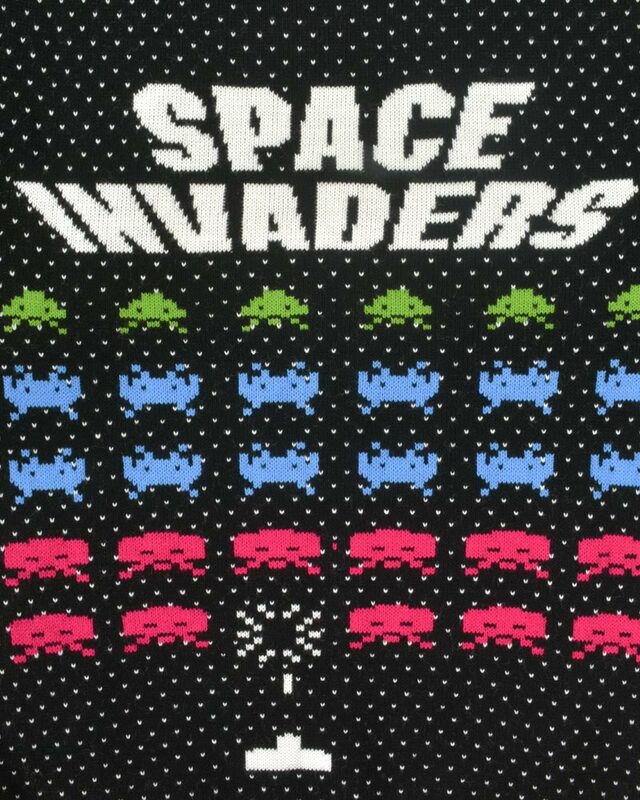 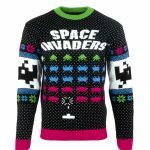 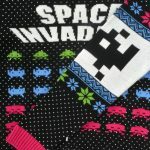 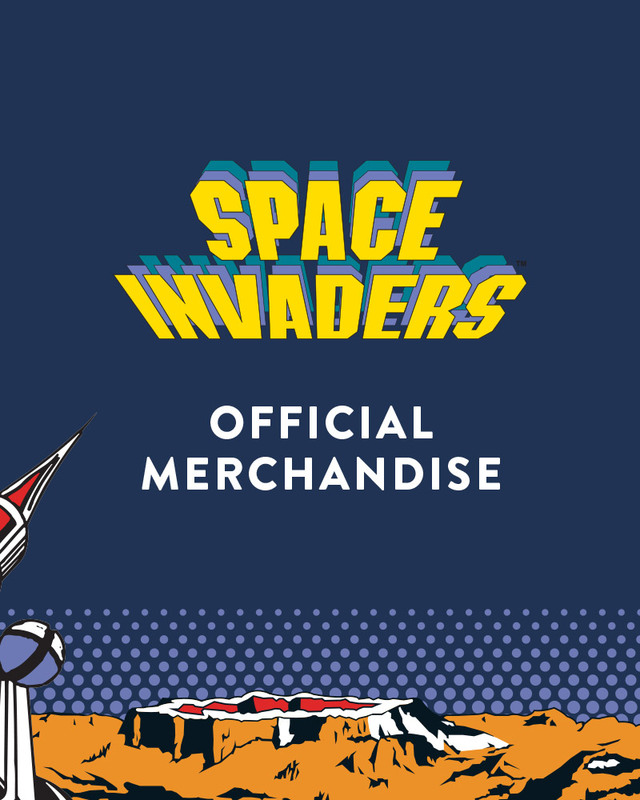 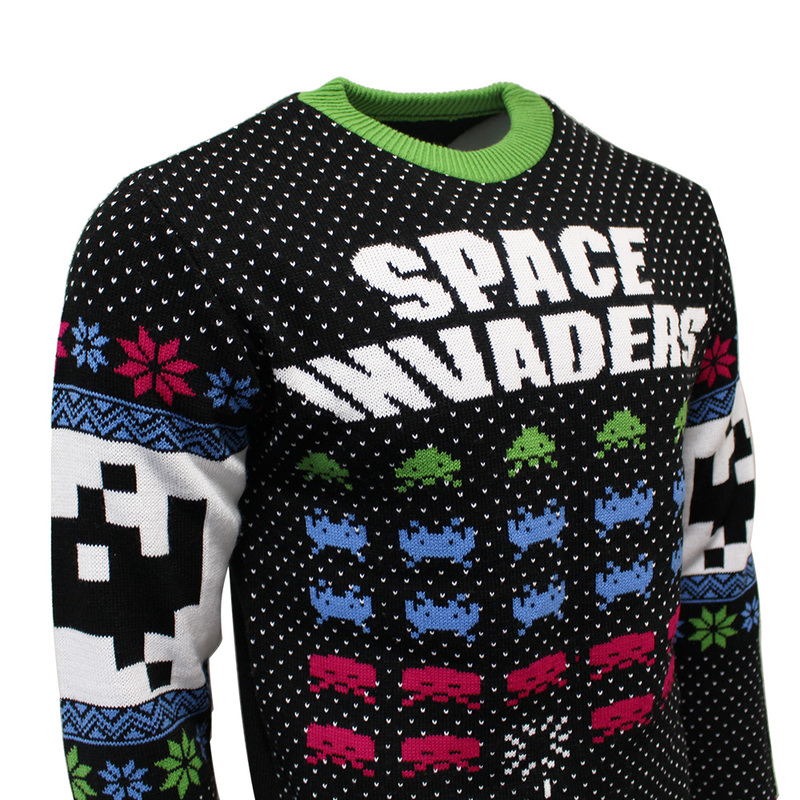 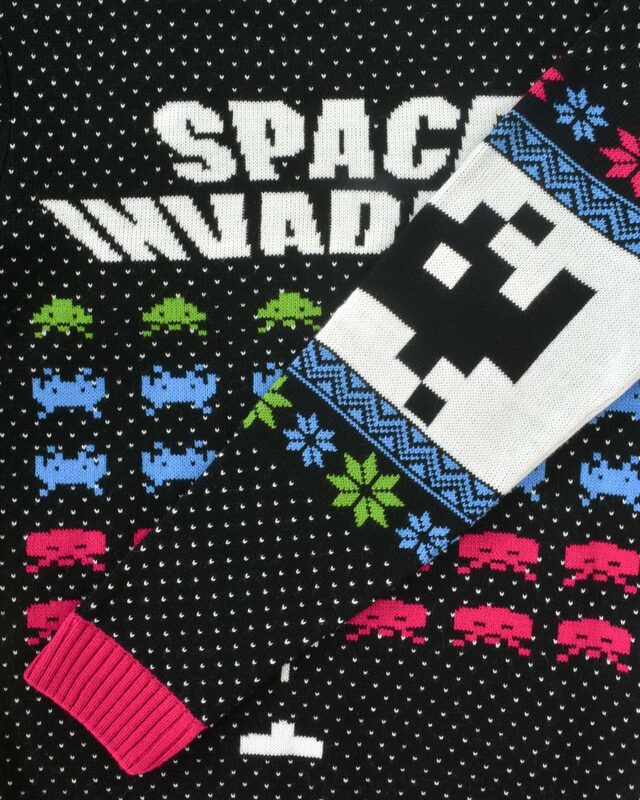 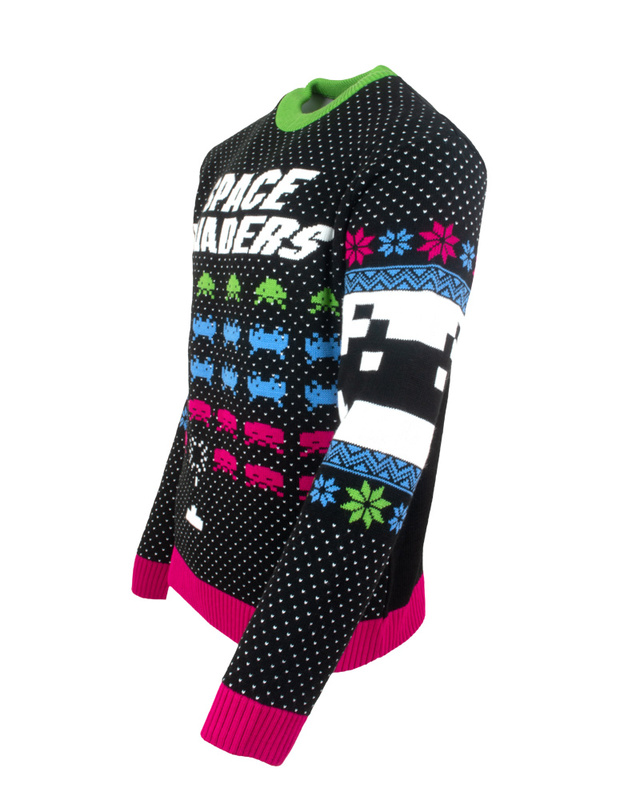 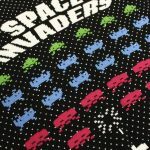 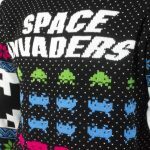 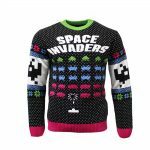 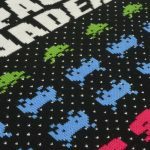 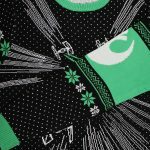 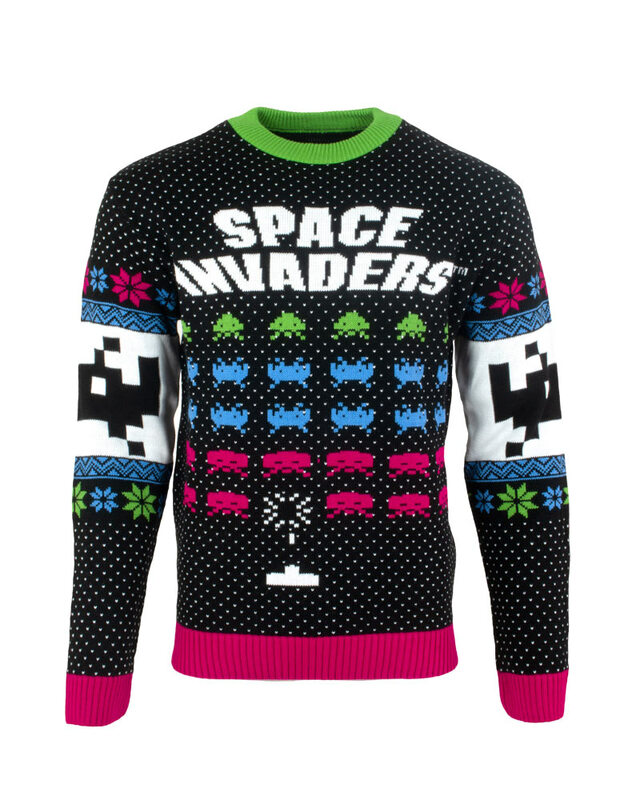 Amazon/other: This officially licensed Space Invaders Christmas jumper puts gaming’s most iconic alien enemies to Xmas sweater form for the very first time! 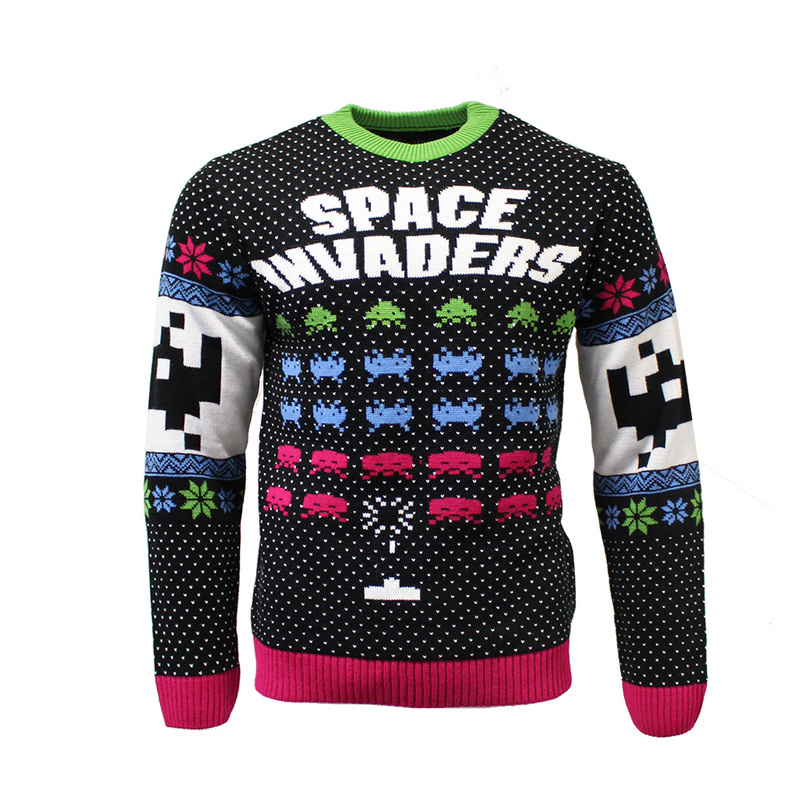 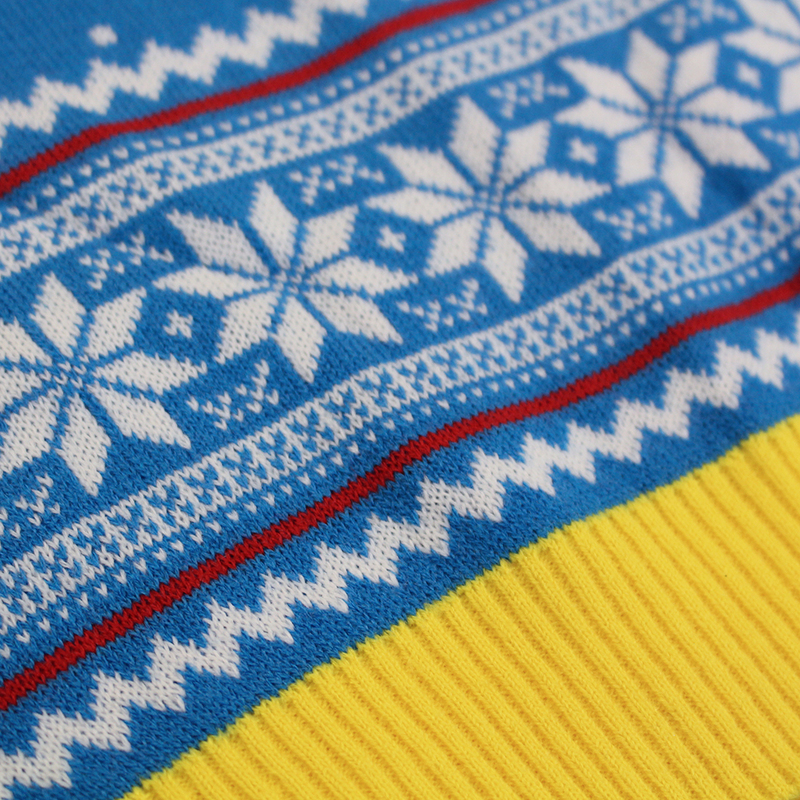 A high quality, 100% knitted sweater, this is the ultimate Christmas jumper for every retro gamer. 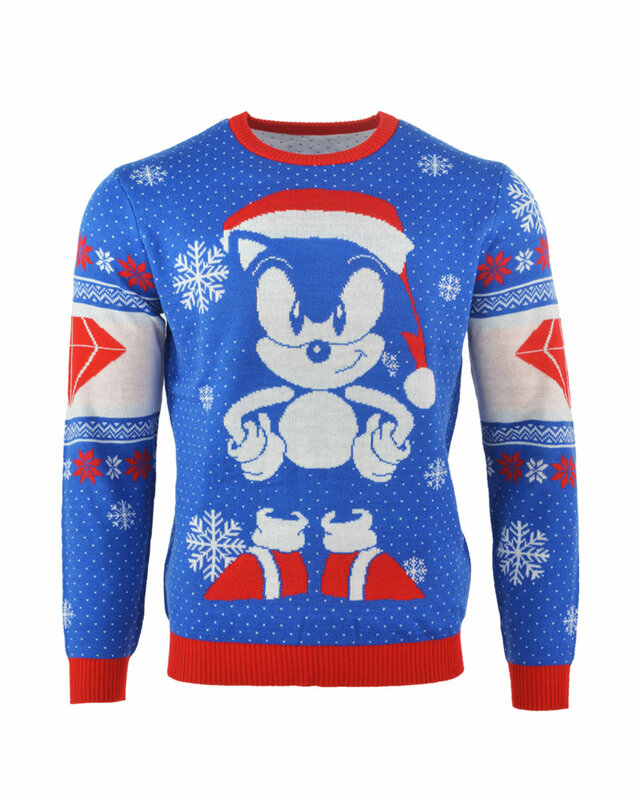 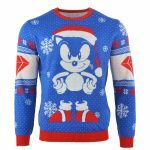 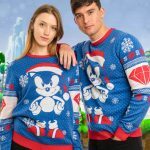 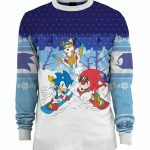 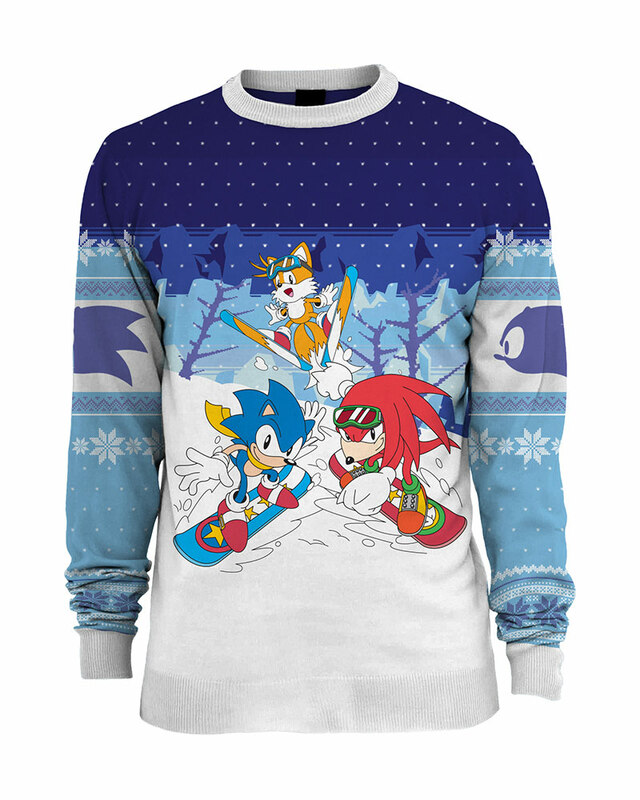 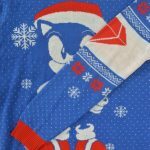 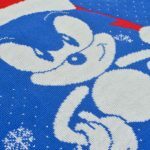 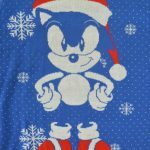 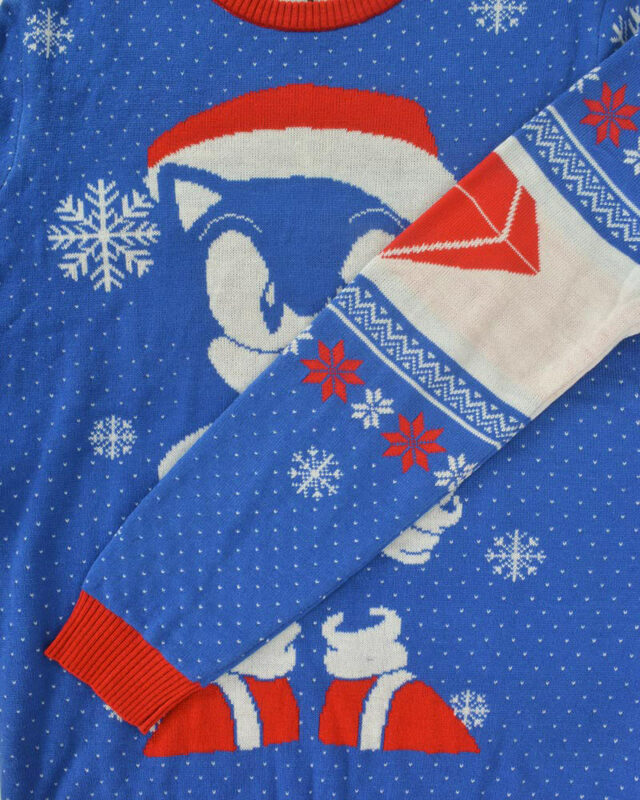 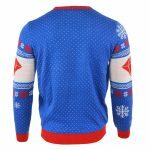 Amazon/other: This officially licensed Sonic the Hedgehog Christmas jumper features our three favourite SEGA heroes – Sonic, Knuckles, and Tails – all dressed up for winter and in snowboarding gear, just in time for Christmas! 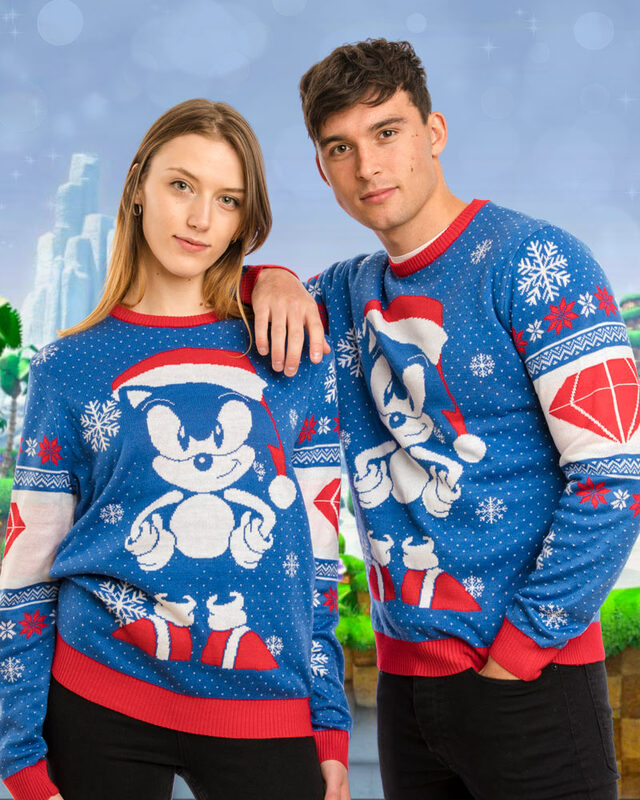 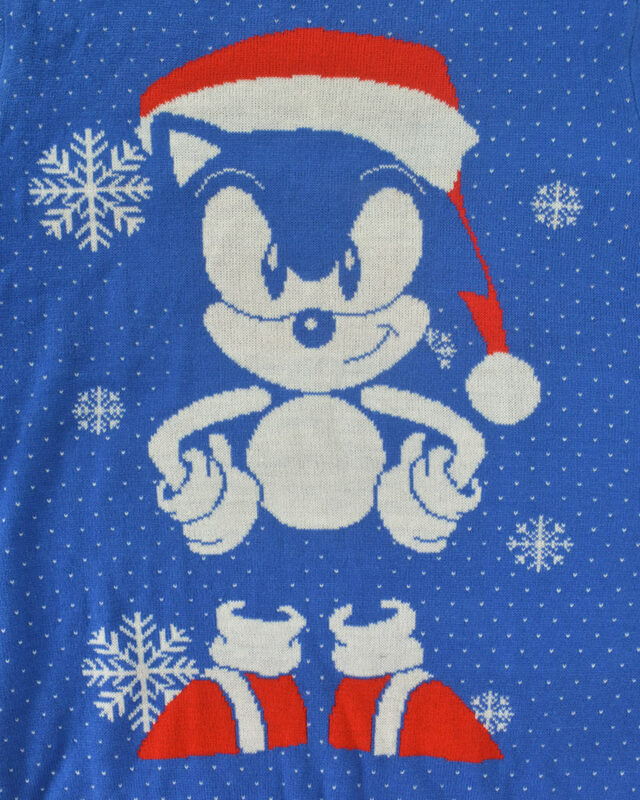 A fully knitted Xmas jumper with patch embroidery, this is the ultimate ugly sweater for Sonic fans to wear for the holidays! 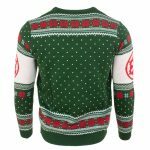 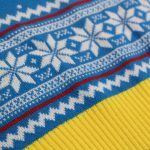 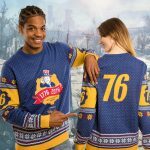 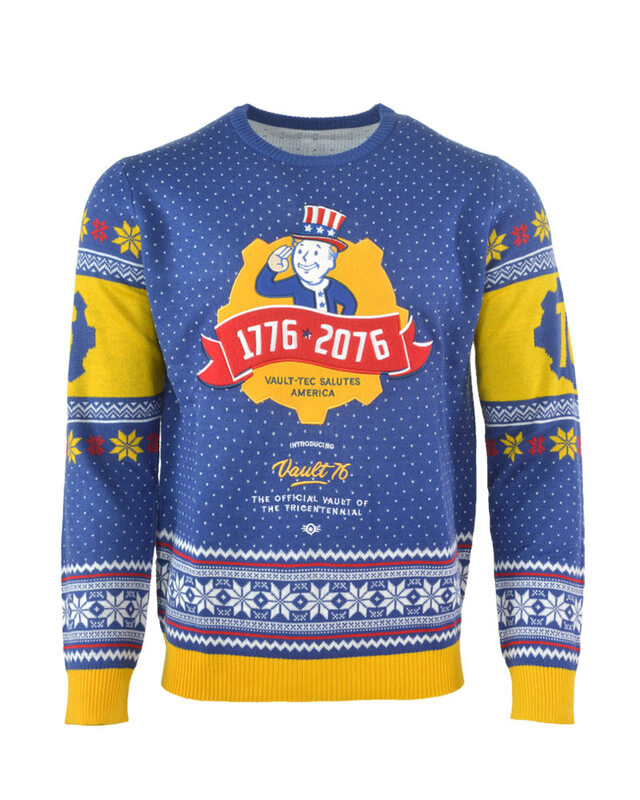 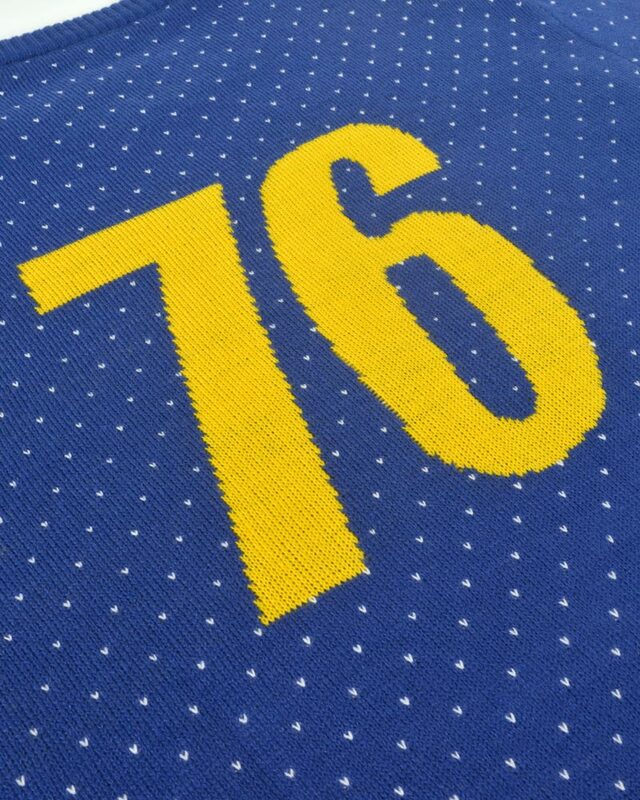 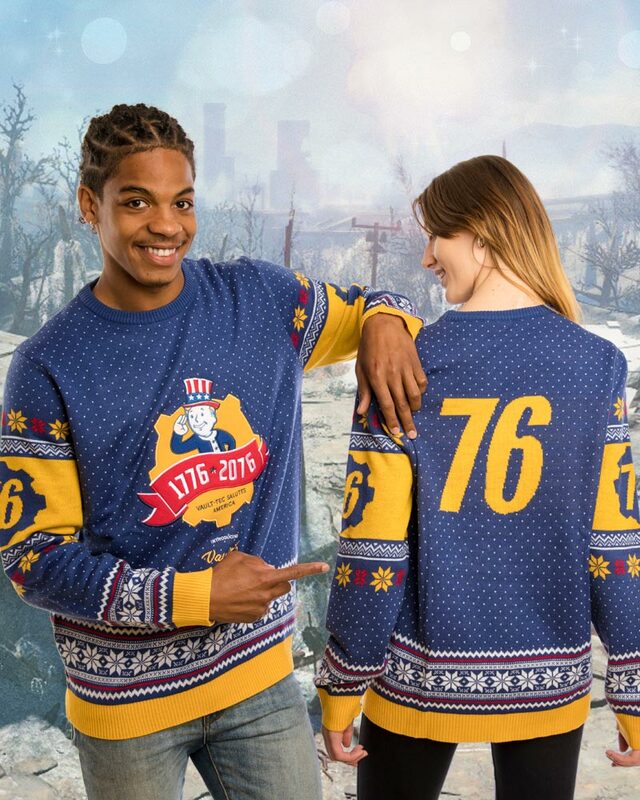 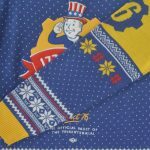 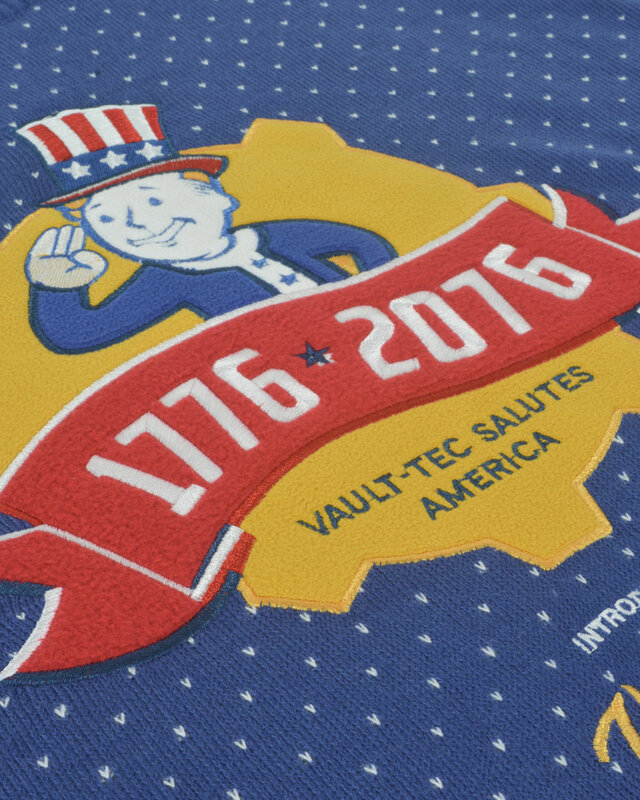 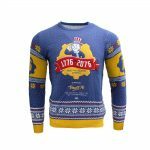 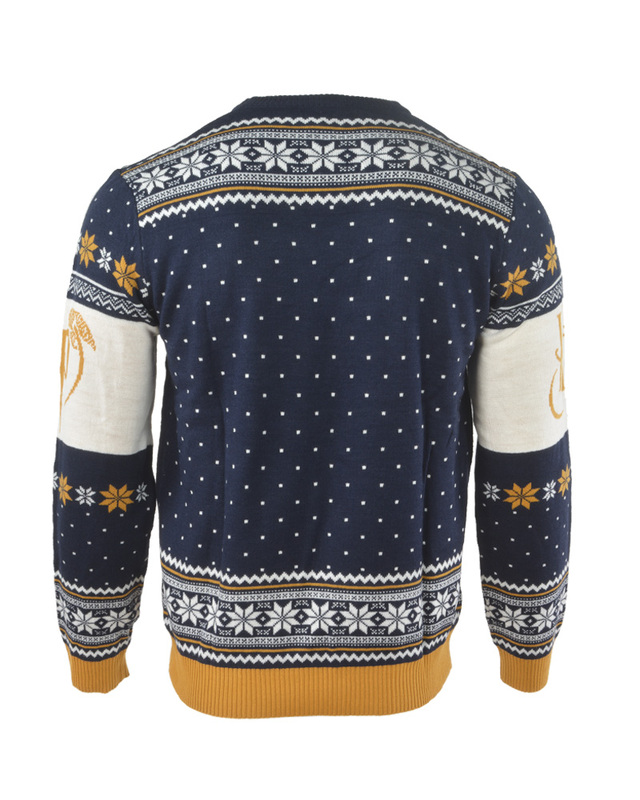 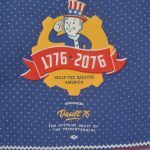 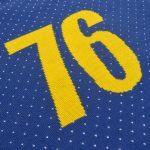 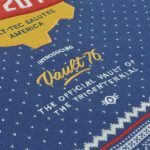 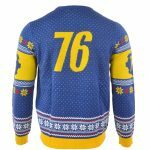 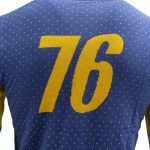 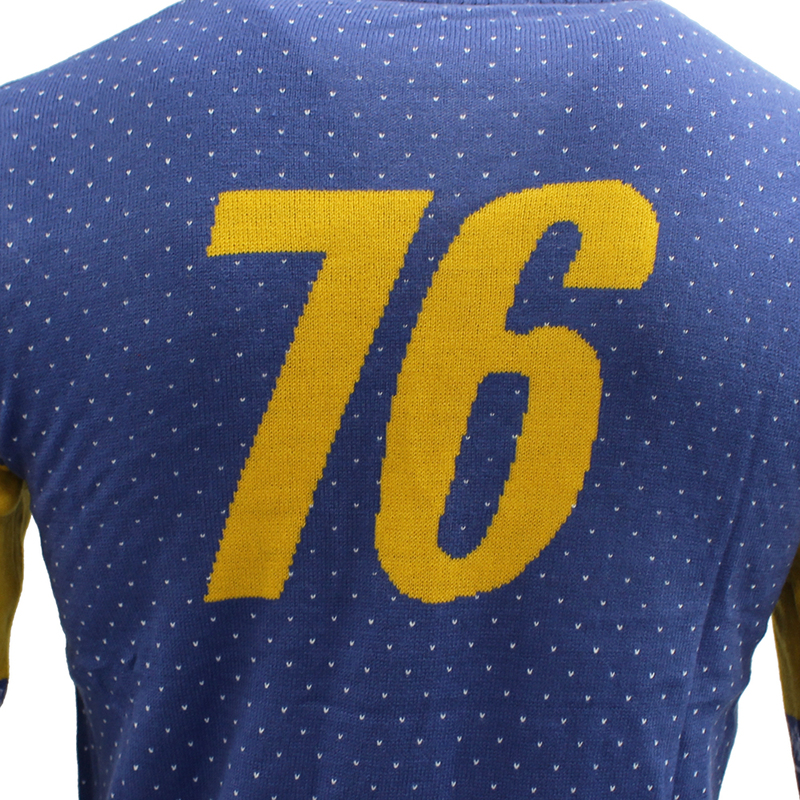 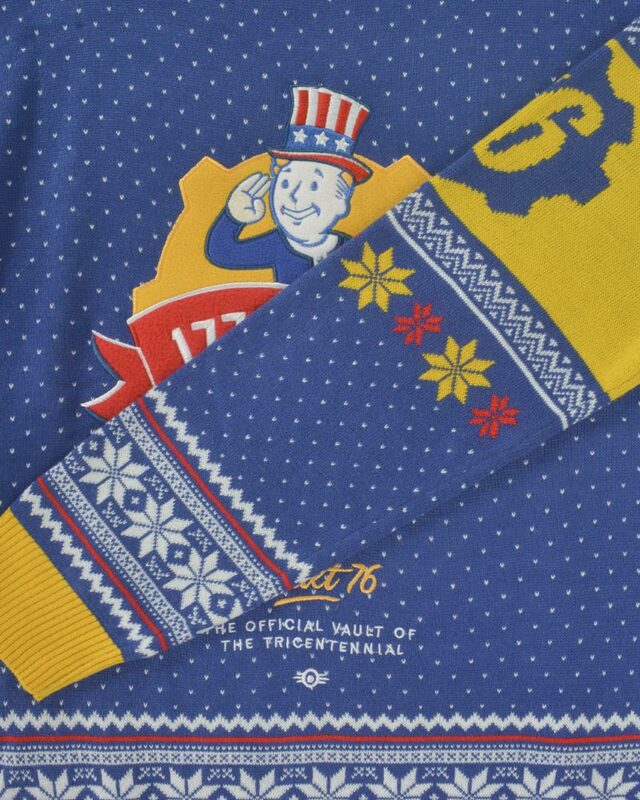 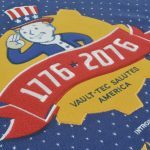 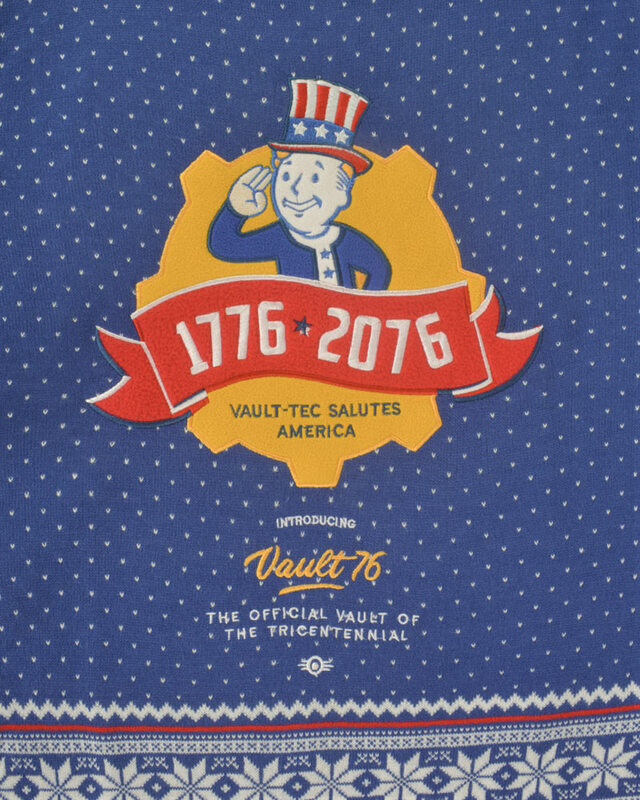 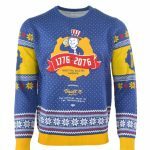 Amazon/other: This officially licensed Fallout 76 Christmas jumper is a great way to celebrate both the release of the new Bethesda game and the holiday season! 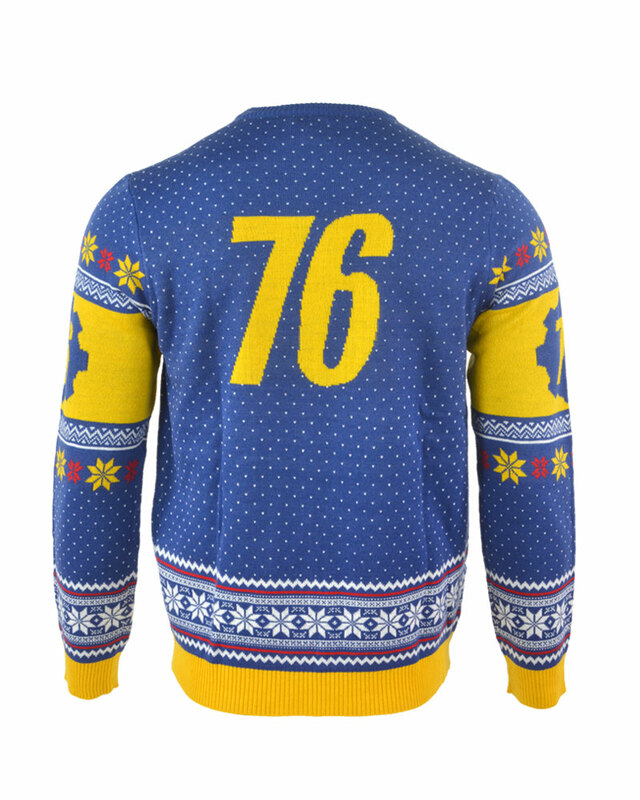 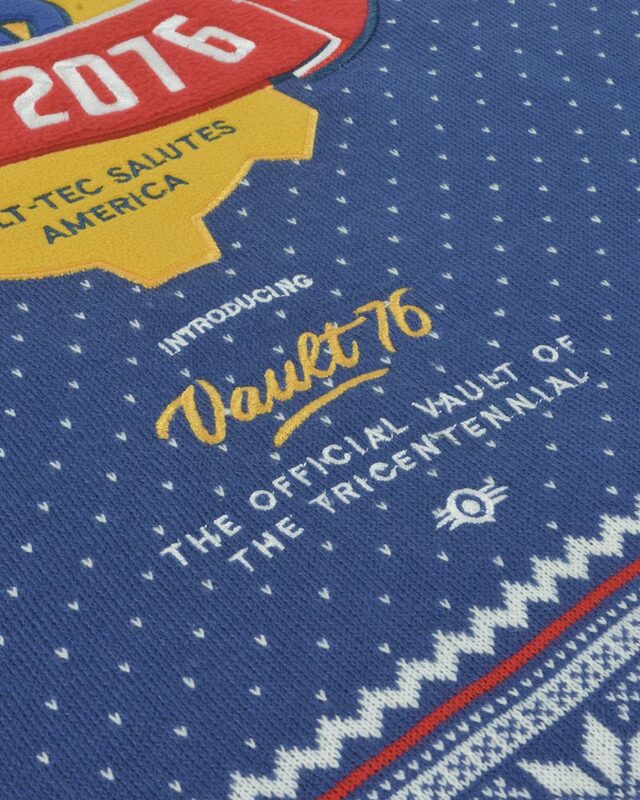 A fully knitted Xmas sweater with Vault 76 & Vault Boy embroidered designs on the front, back and sleeves, there’s no better way to celebrate the holidays. 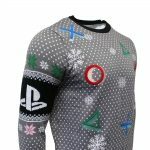 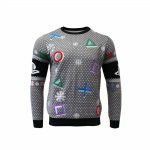 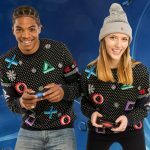 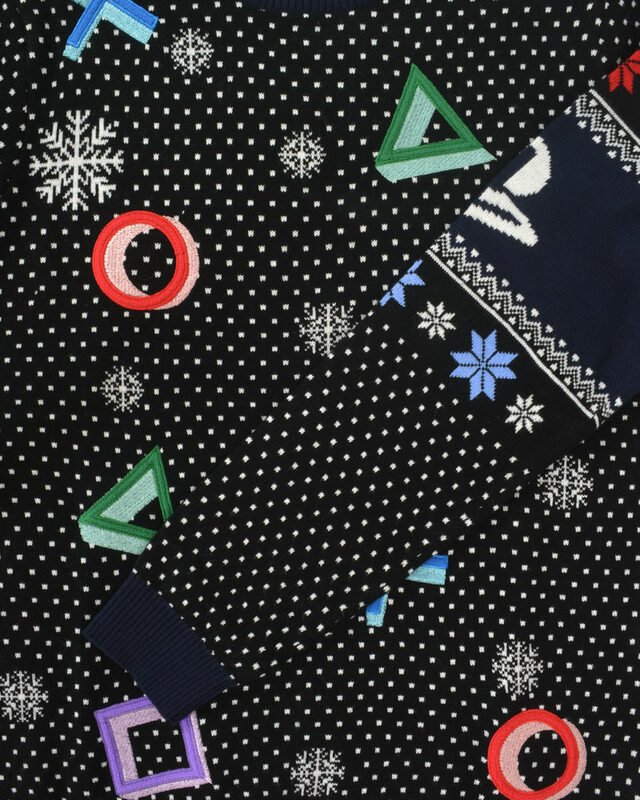 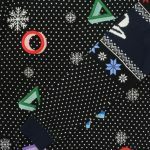 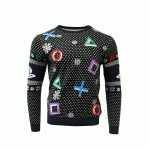 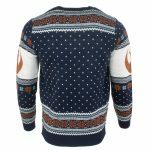 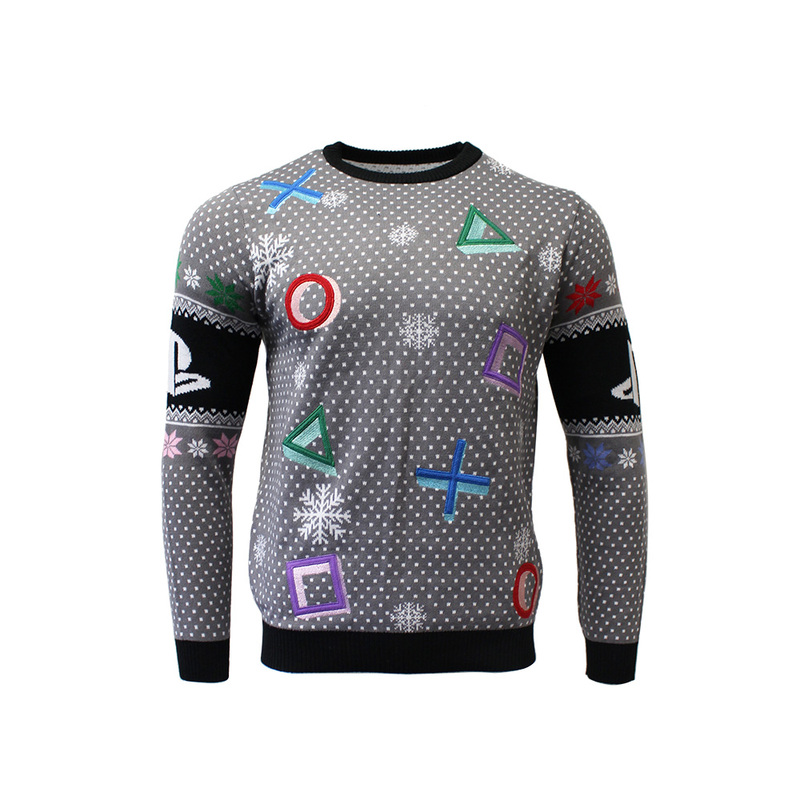 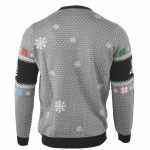 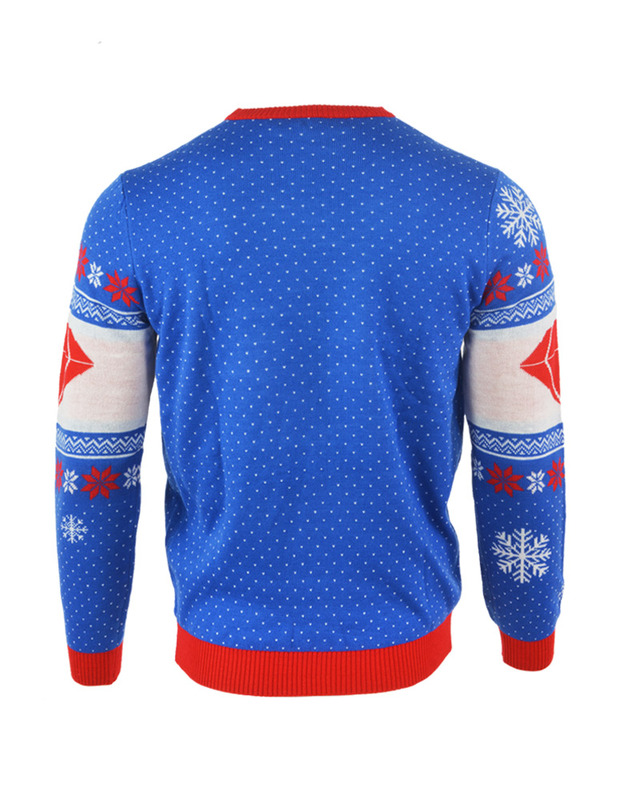 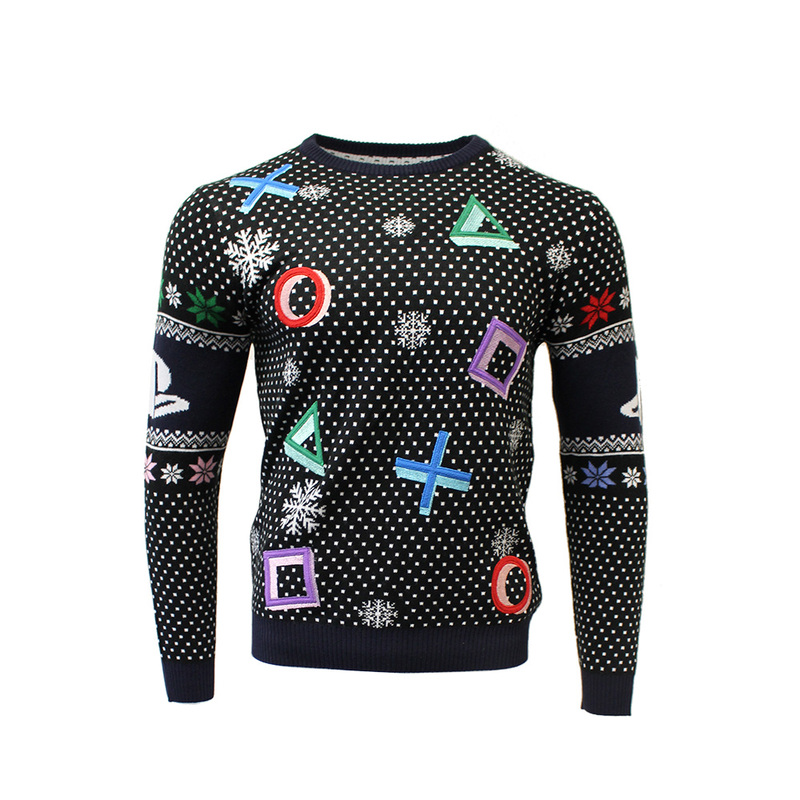 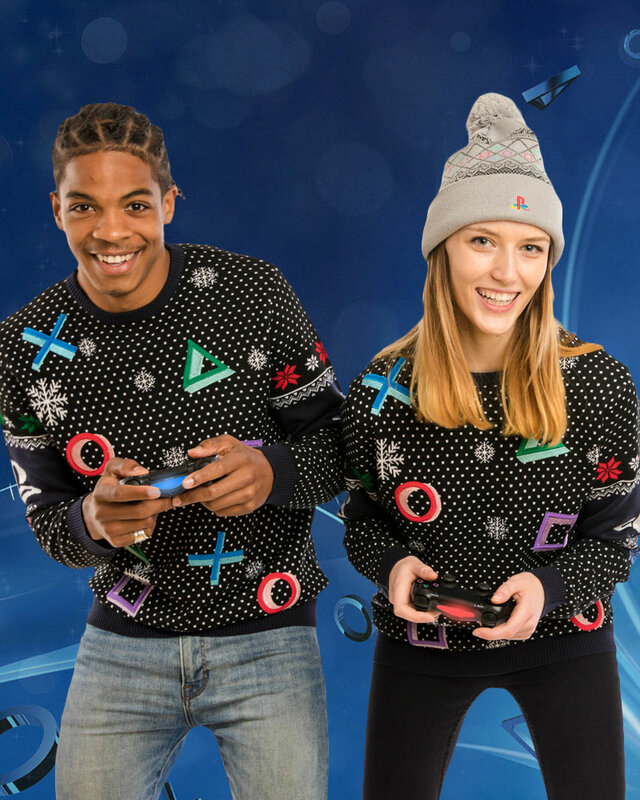 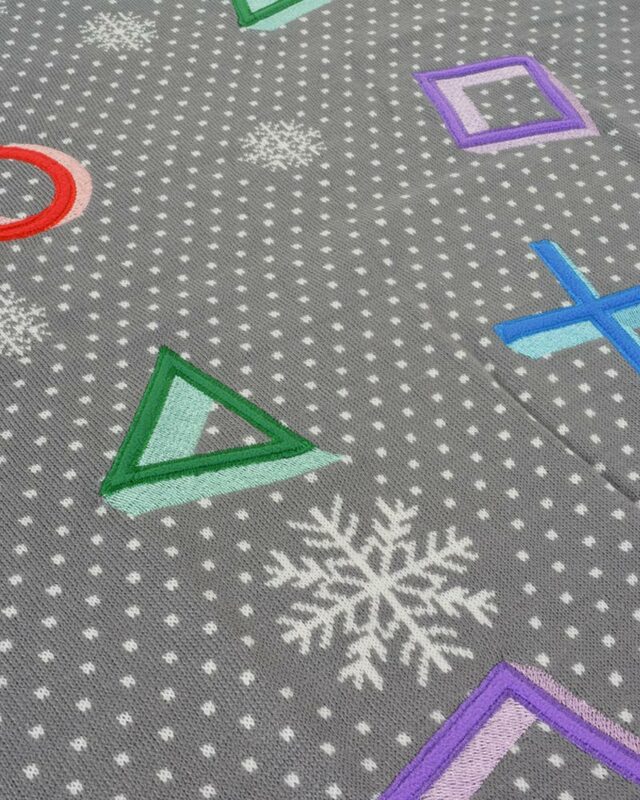 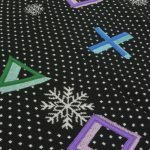 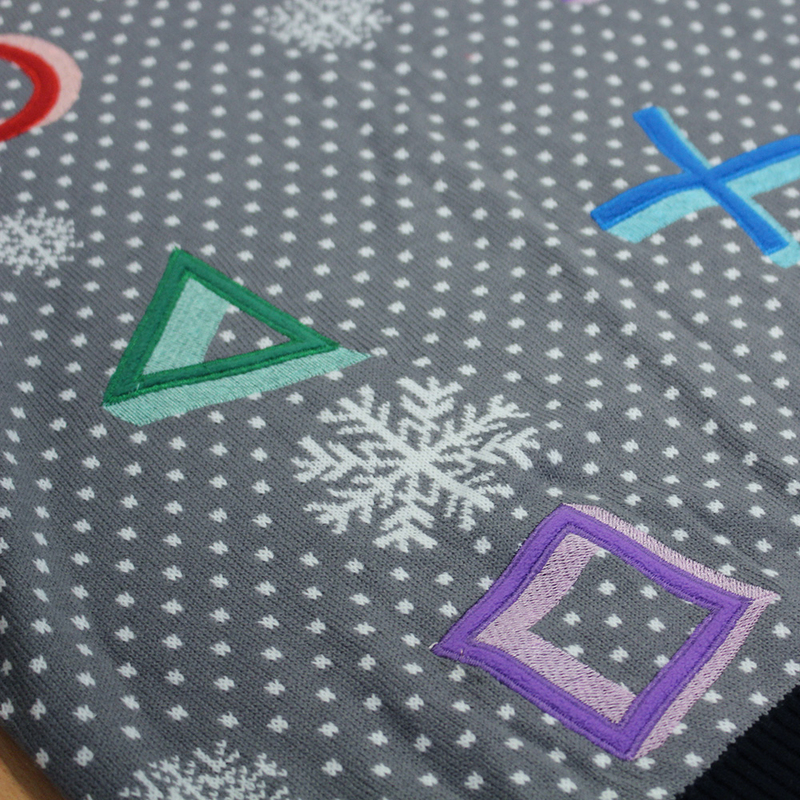 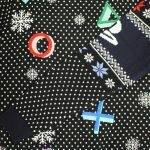 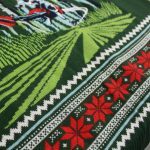 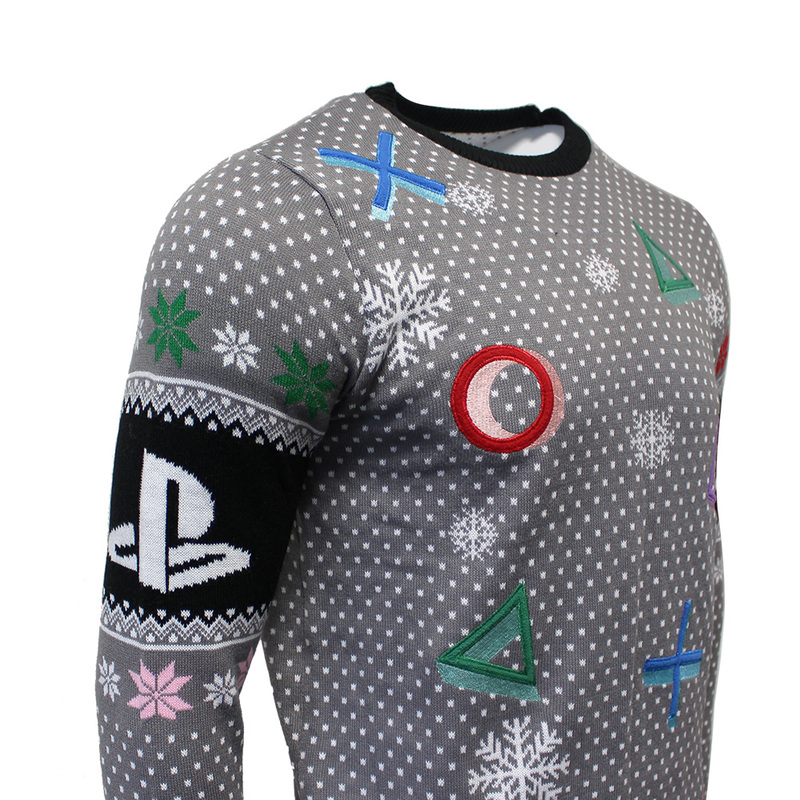 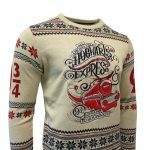 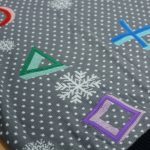 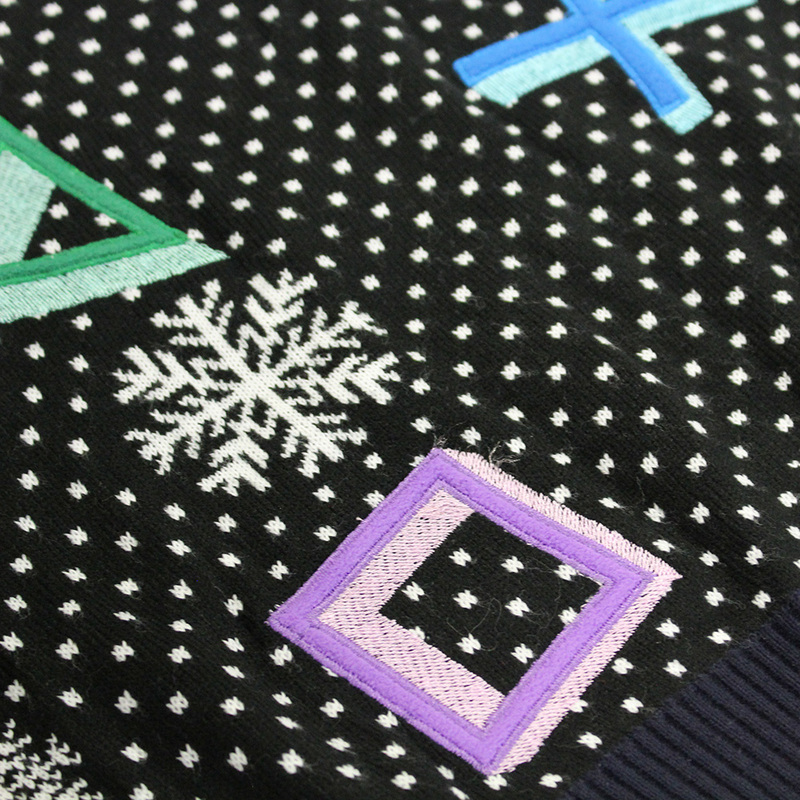 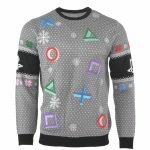 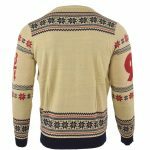 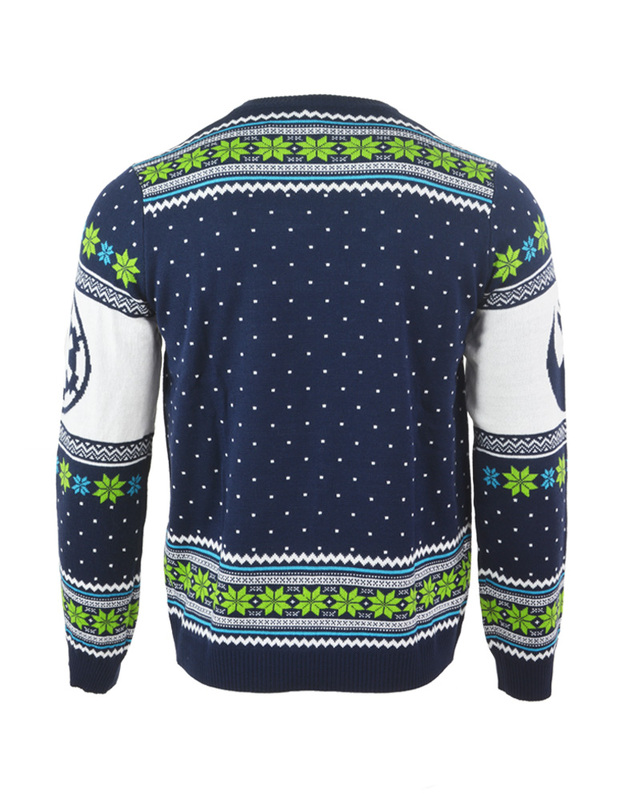 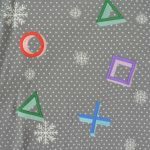 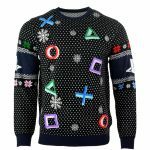 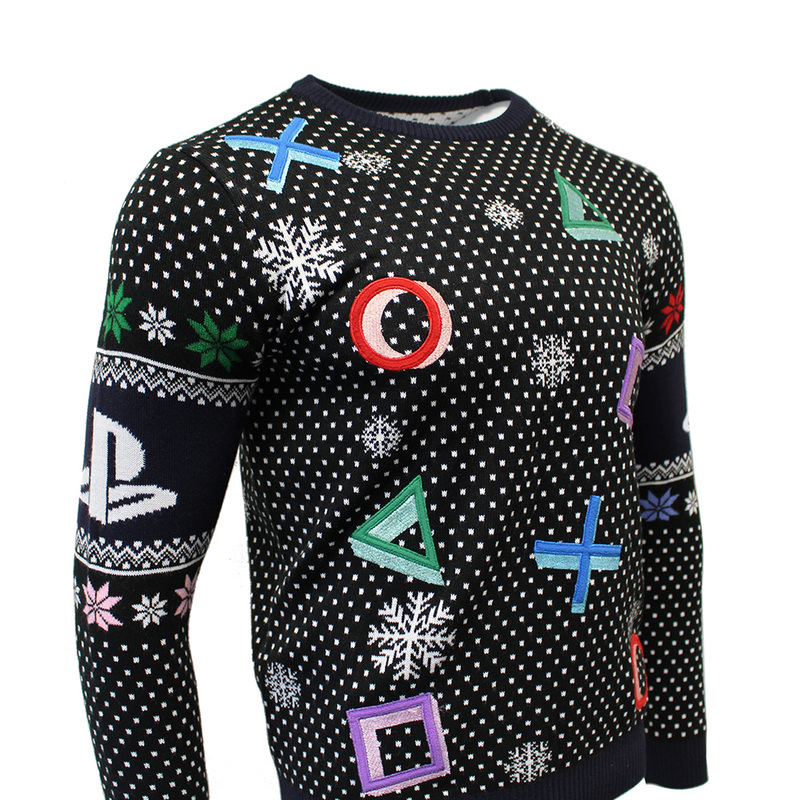 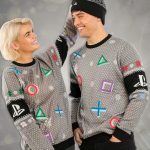 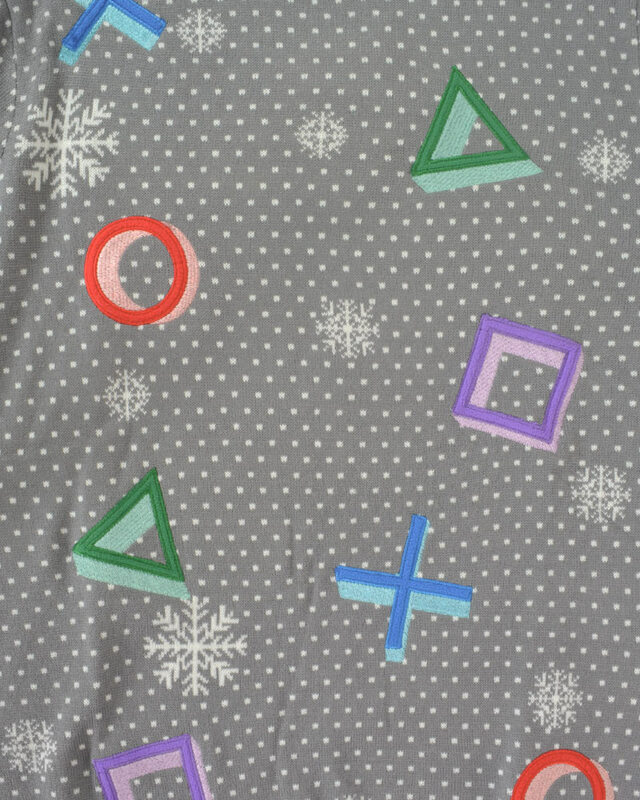 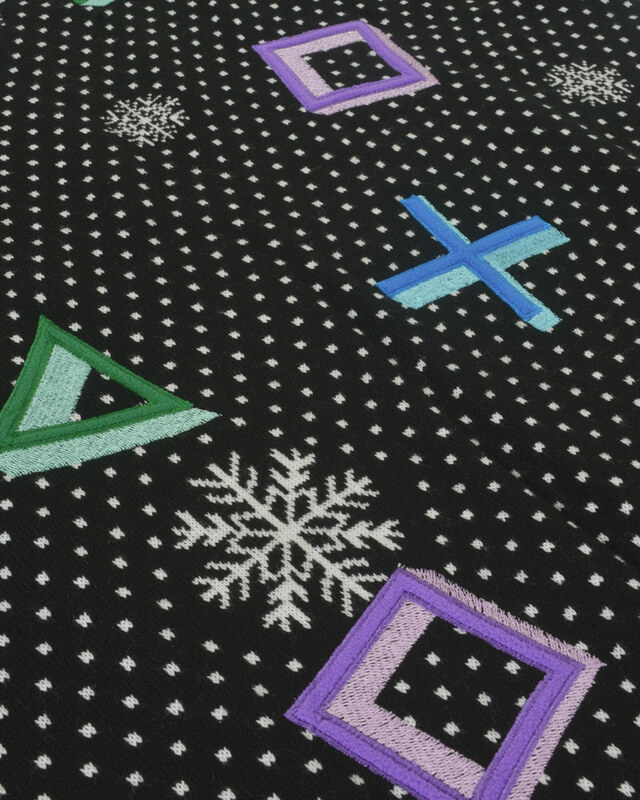 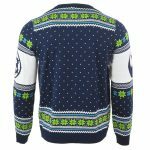 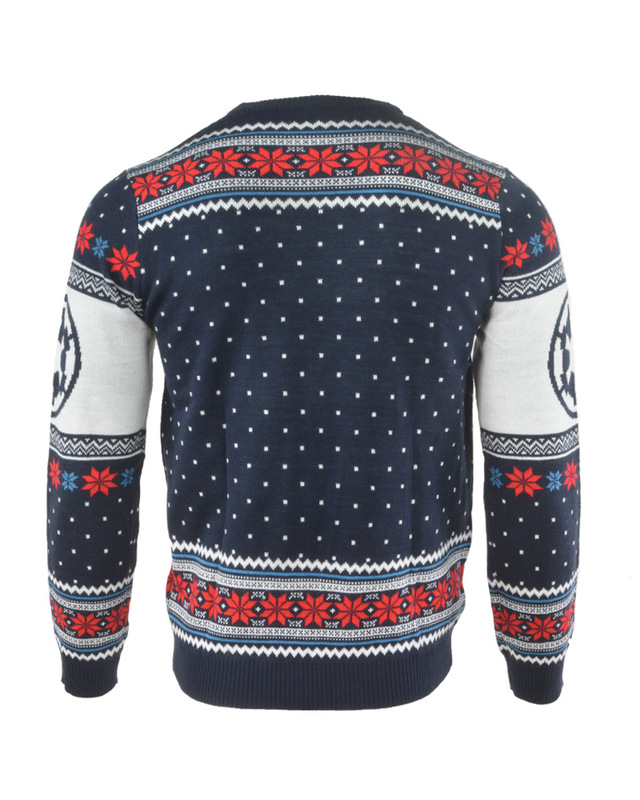 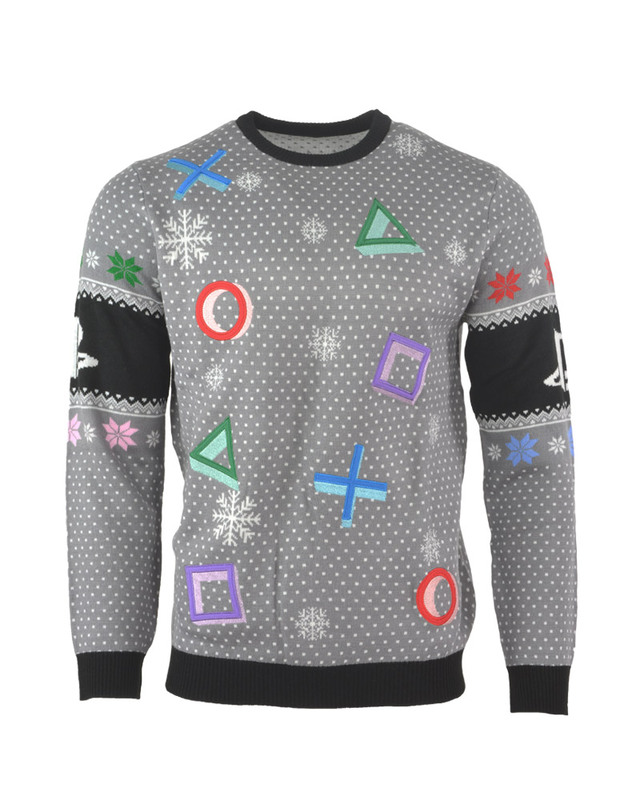 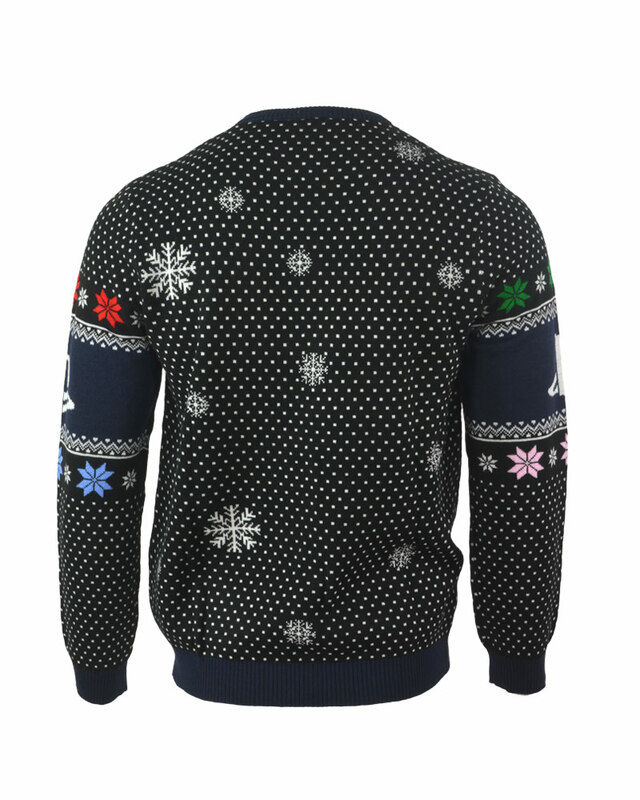 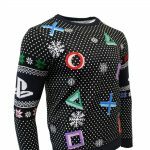 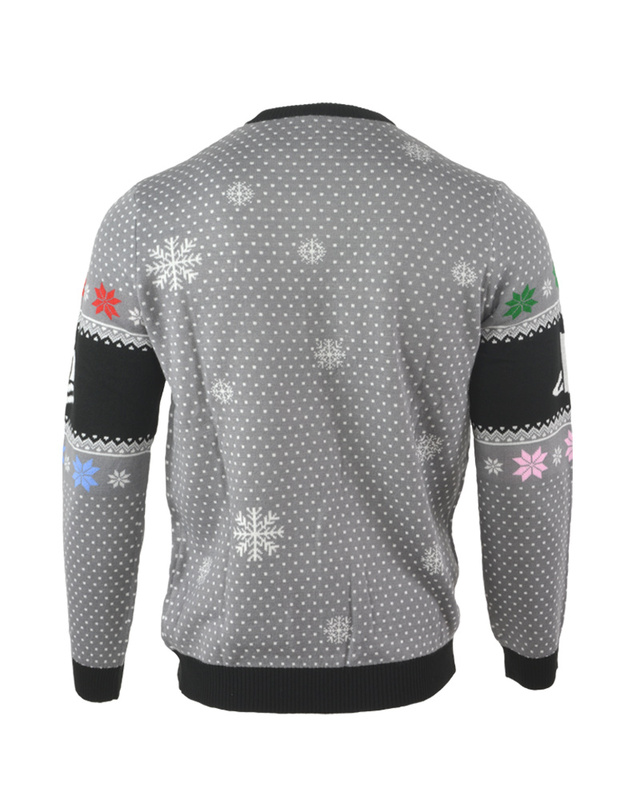 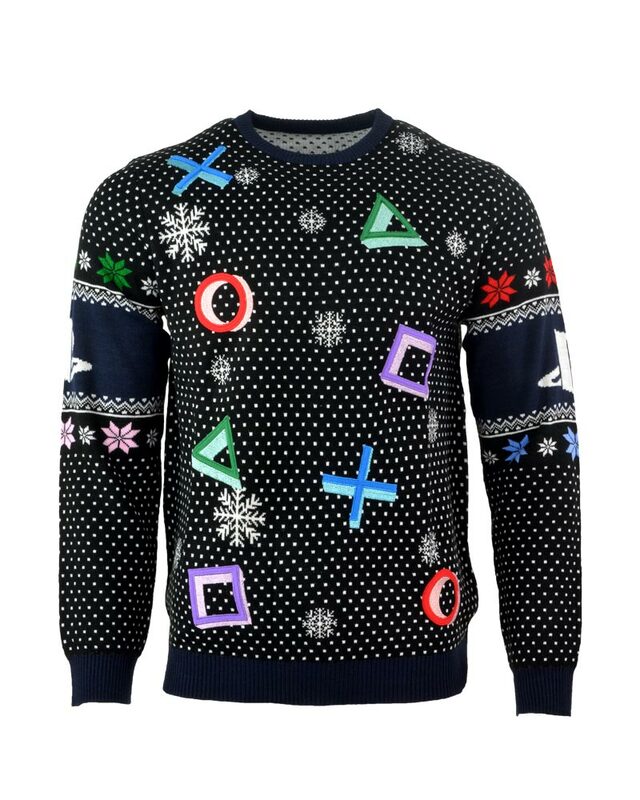 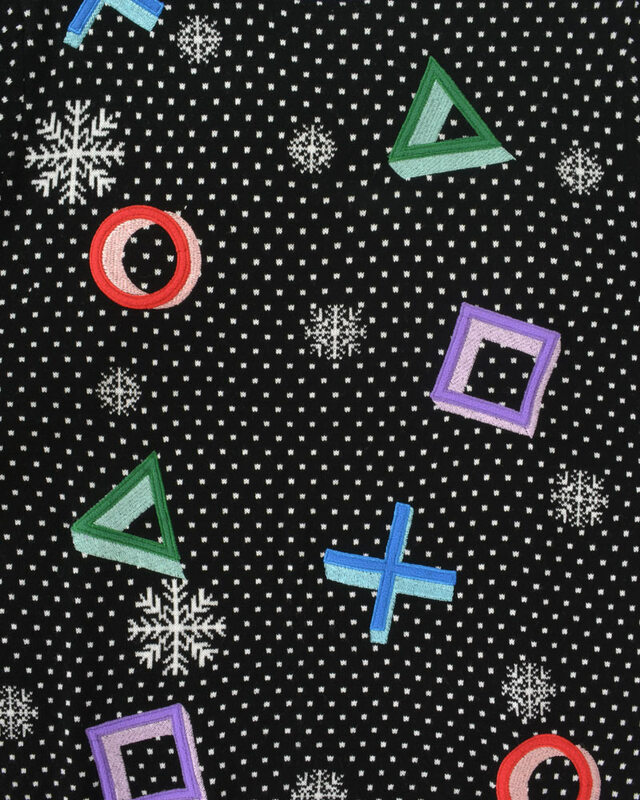 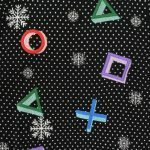 Amazon/other: This officially licensed PlayStation Christmas jumper is the ultimate ugly sweater for jumpers this holiday season! 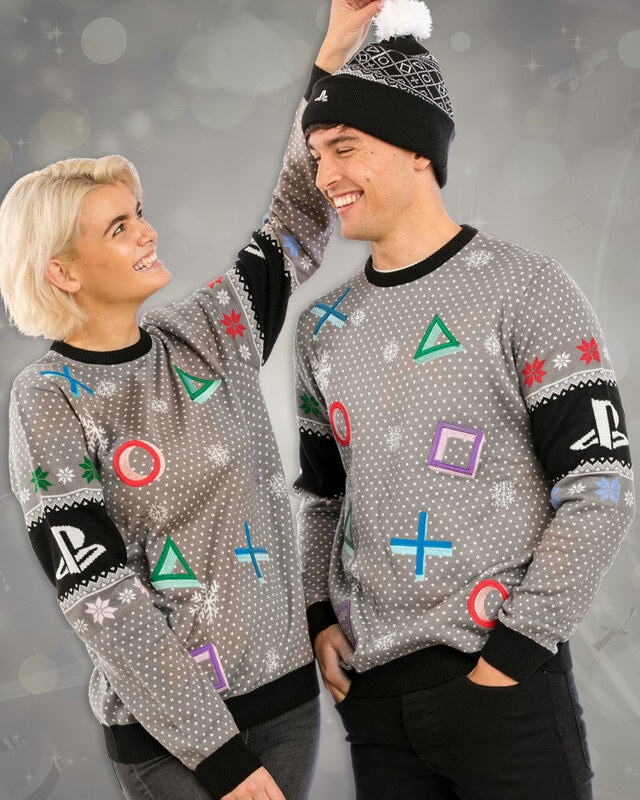 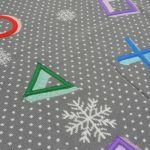 Featuring iconic Sony designs, such as the controller buttons on the front and ‘PS’ logo on the sleeves, this high quality knitted jumper is the ultimate way for gamers to celebrate the festive season. 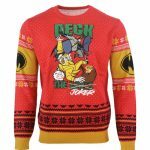 Amazon/other This officially licensed Batman Christmas jumper is fully knitted with a patch embroidery design featuring Batman and The Joker in their original animated designs from the classic 90s TV show. 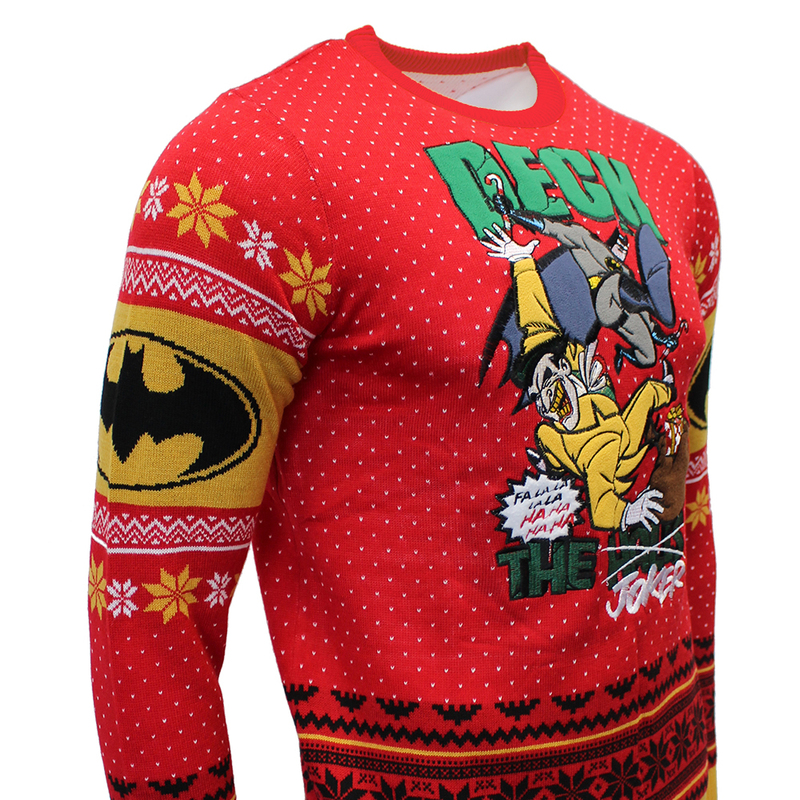 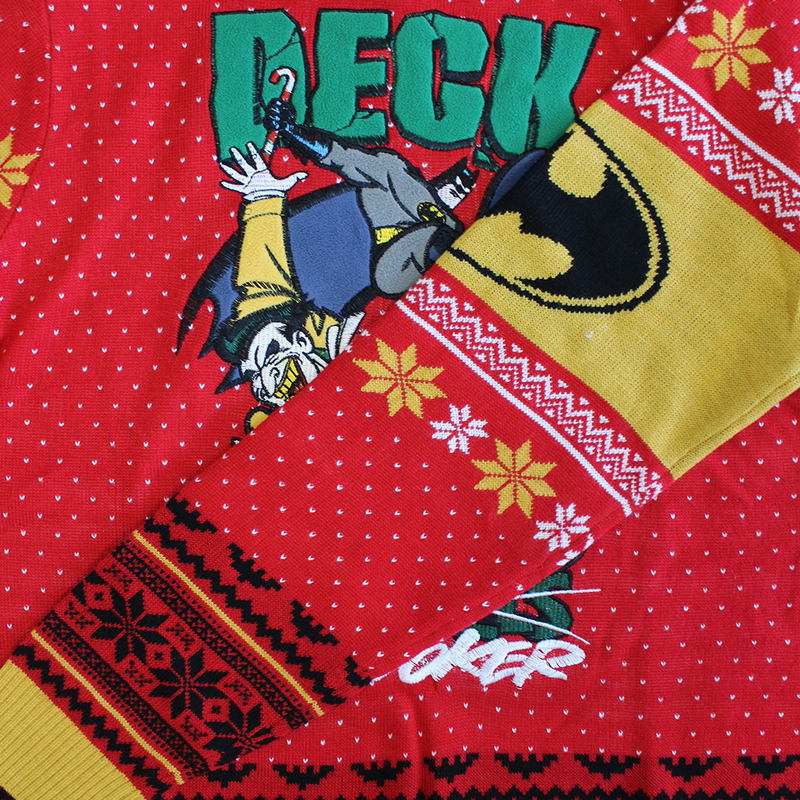 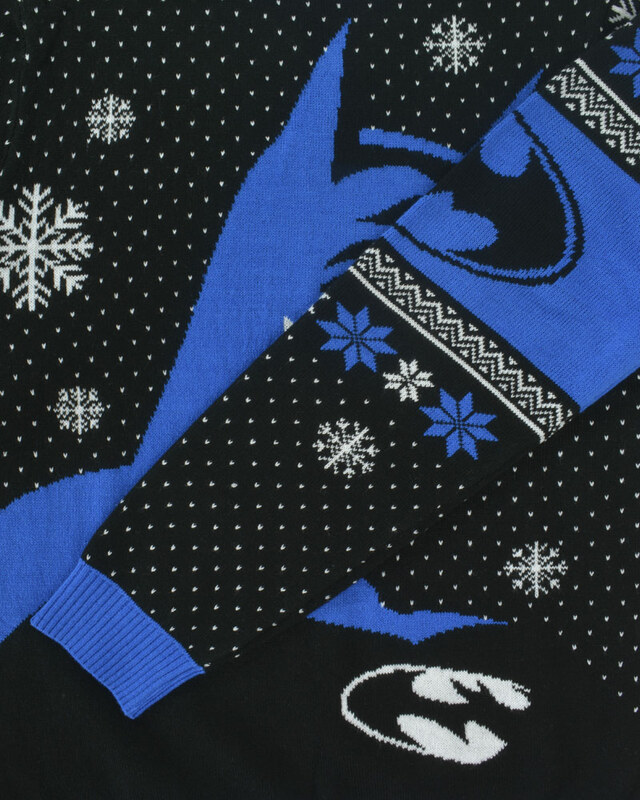 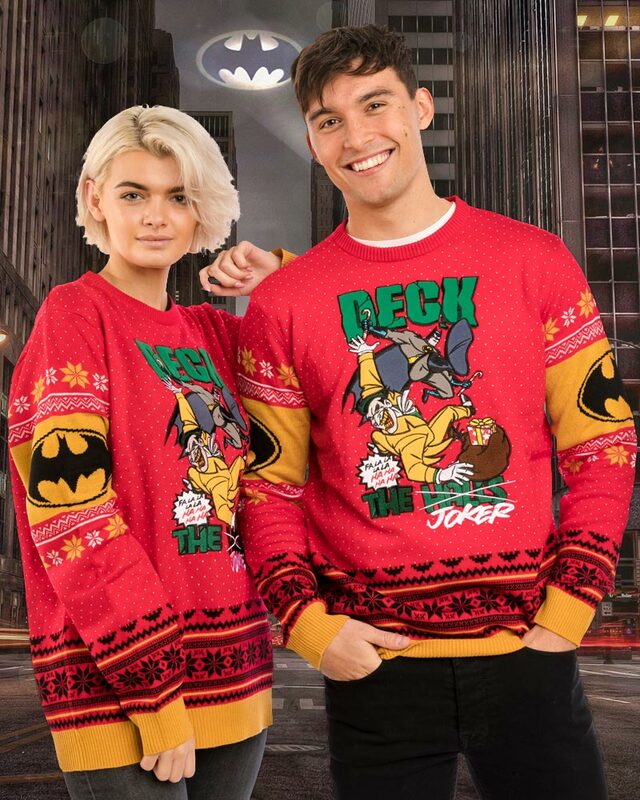 Featuring the iconic nemesis’ decking it out, this Xmas geeky sweater has Christmassy details and Batman logos throughout for that authentic geeky festive vibe! 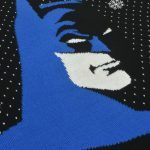 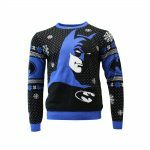 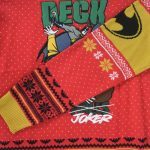 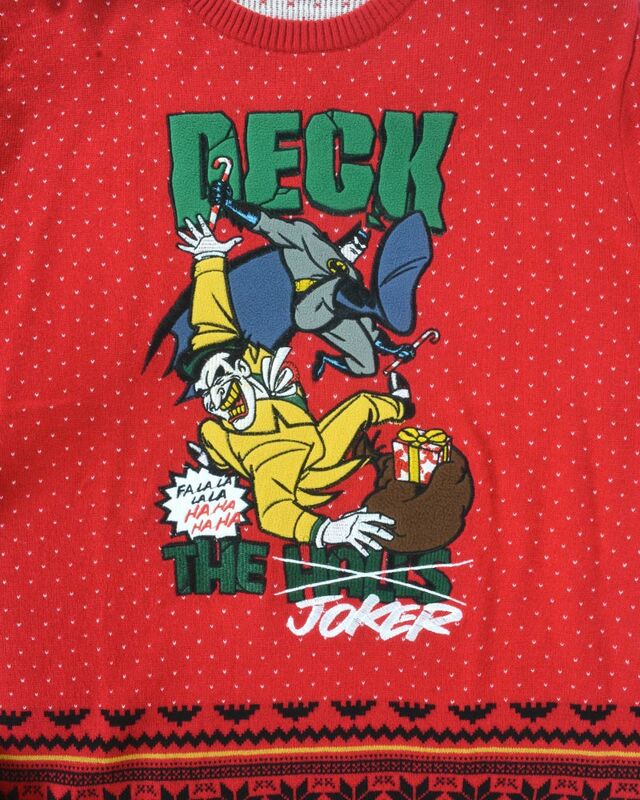 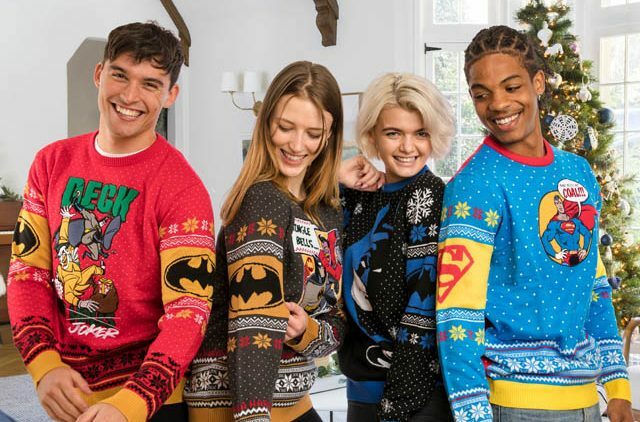 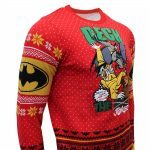 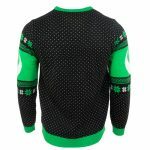 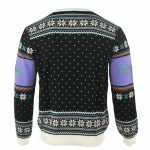 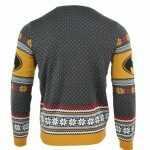 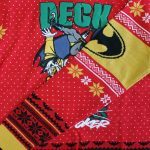 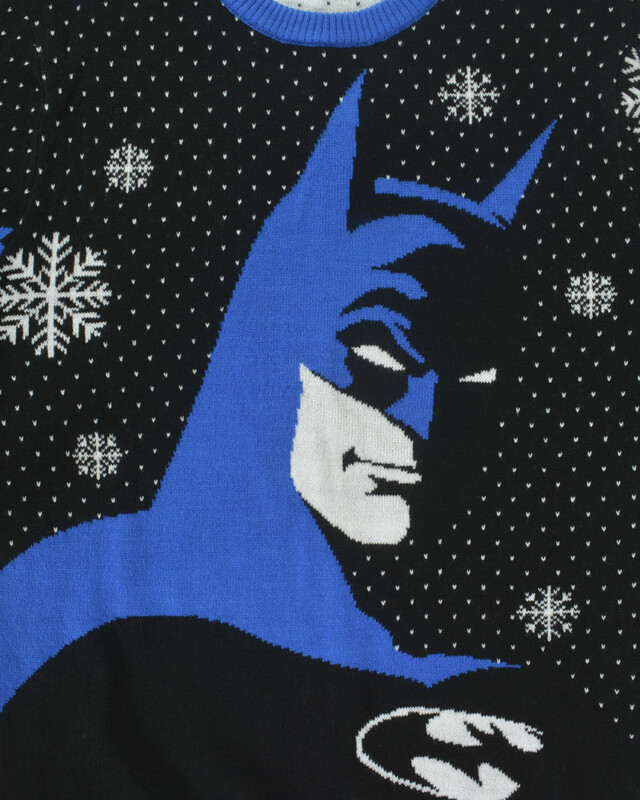 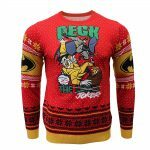 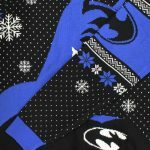 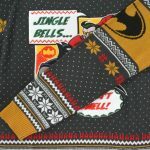 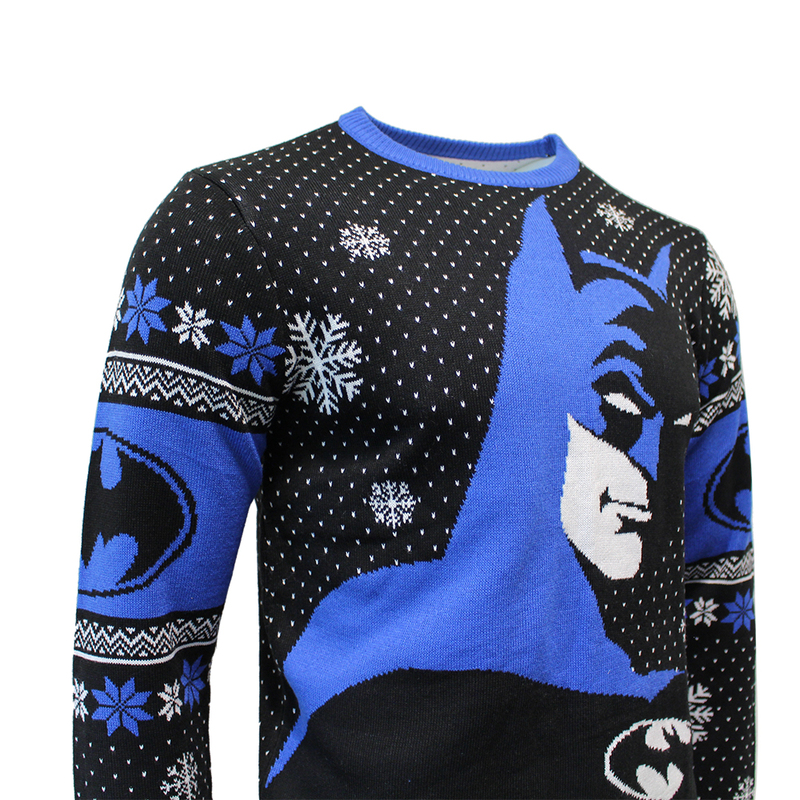 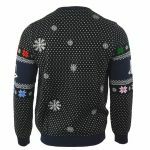 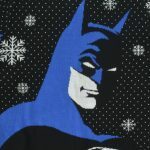 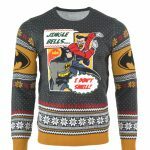 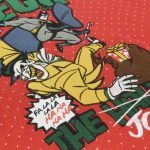 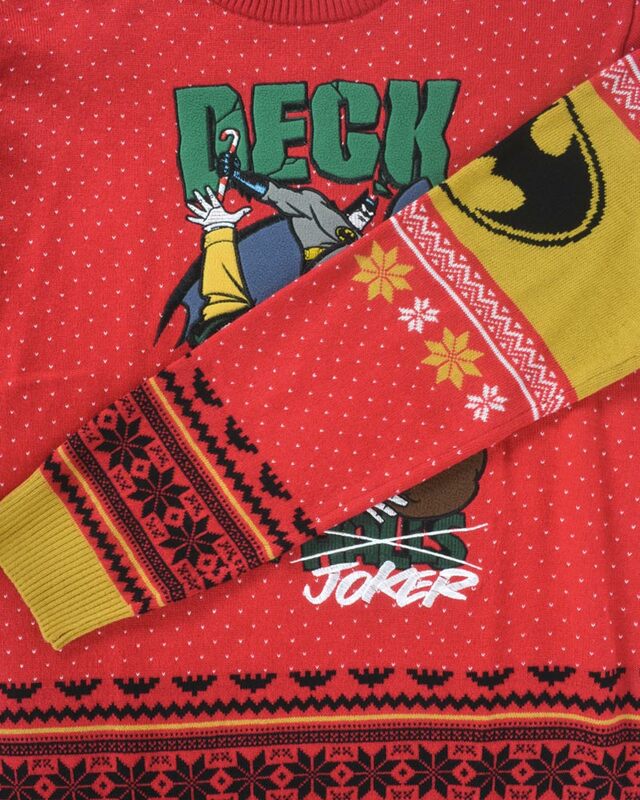 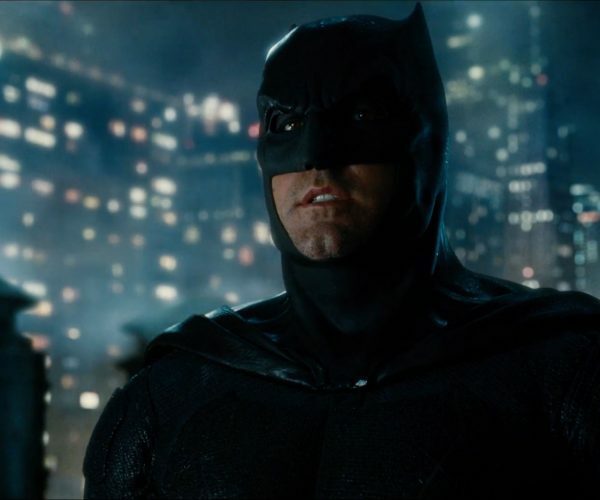 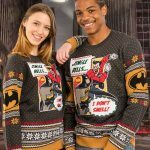 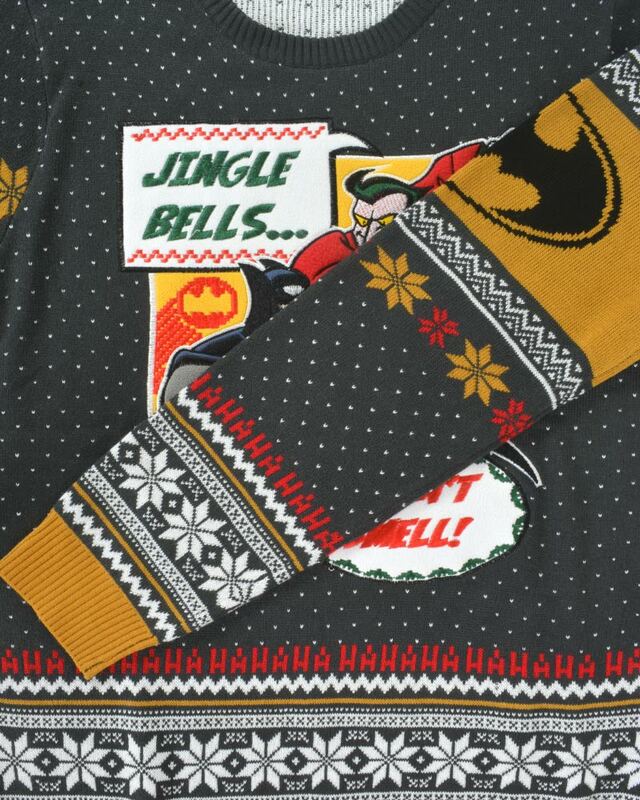 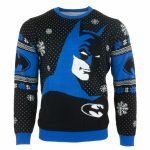 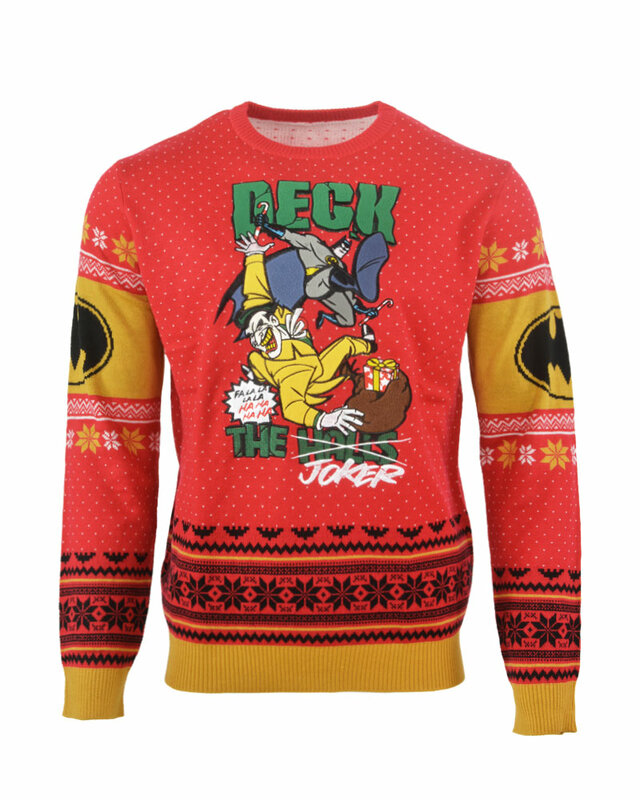 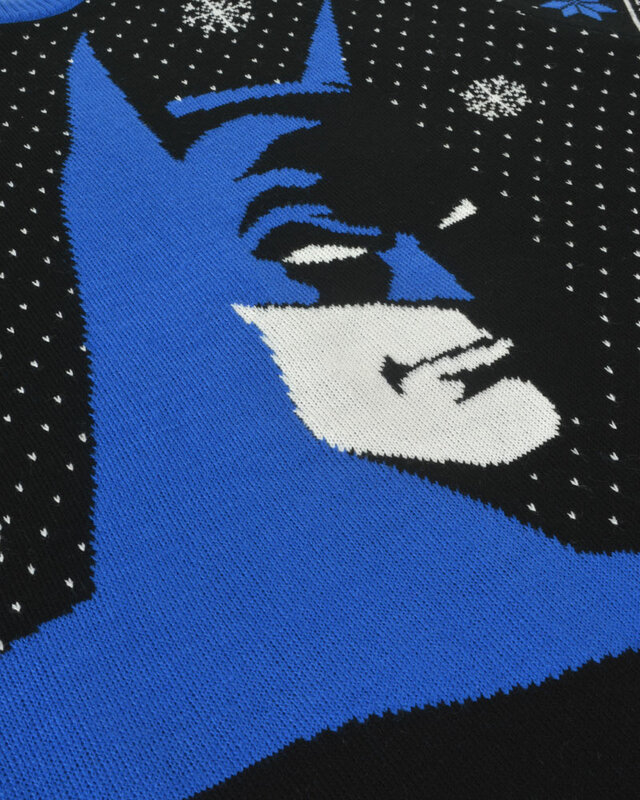 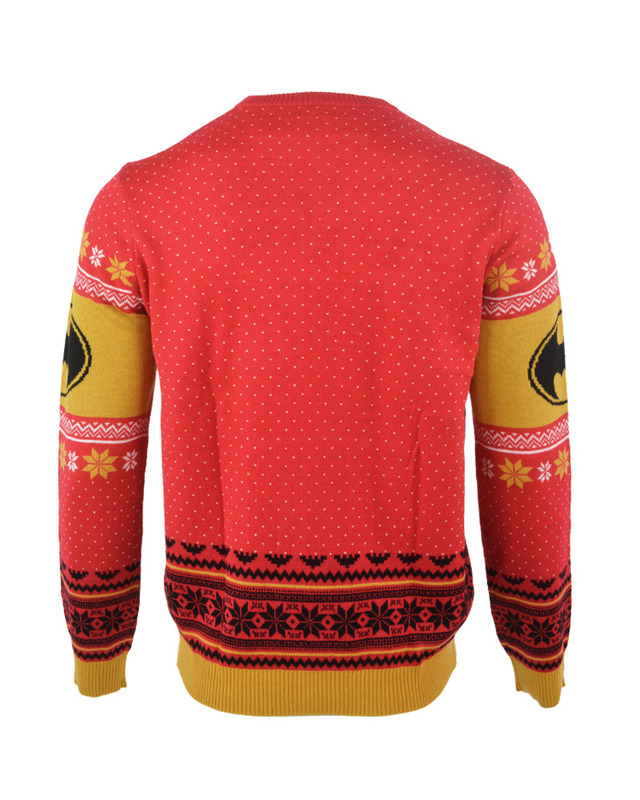 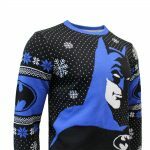 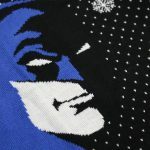 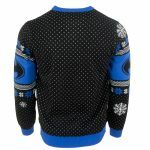 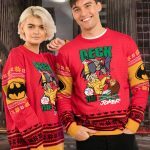 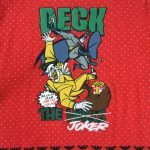 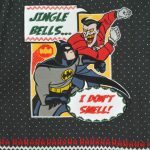 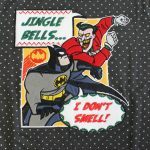 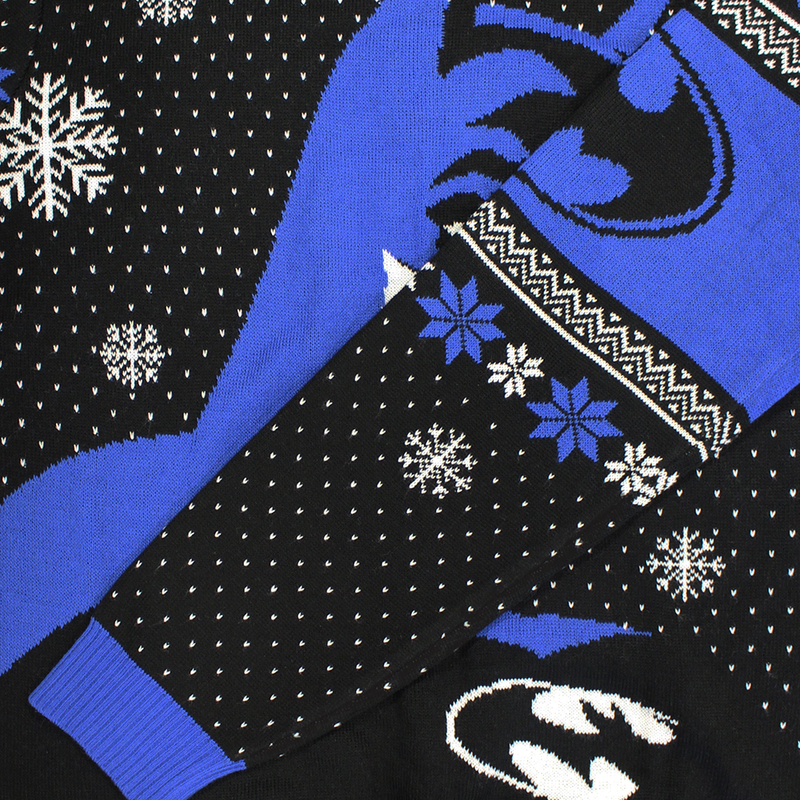 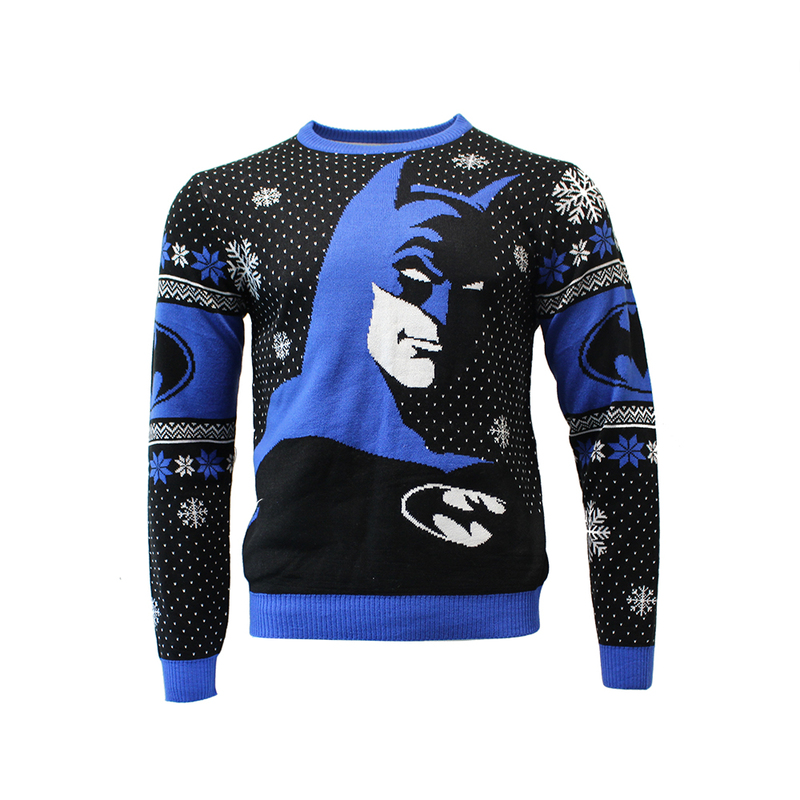 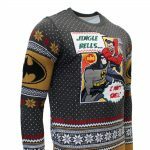 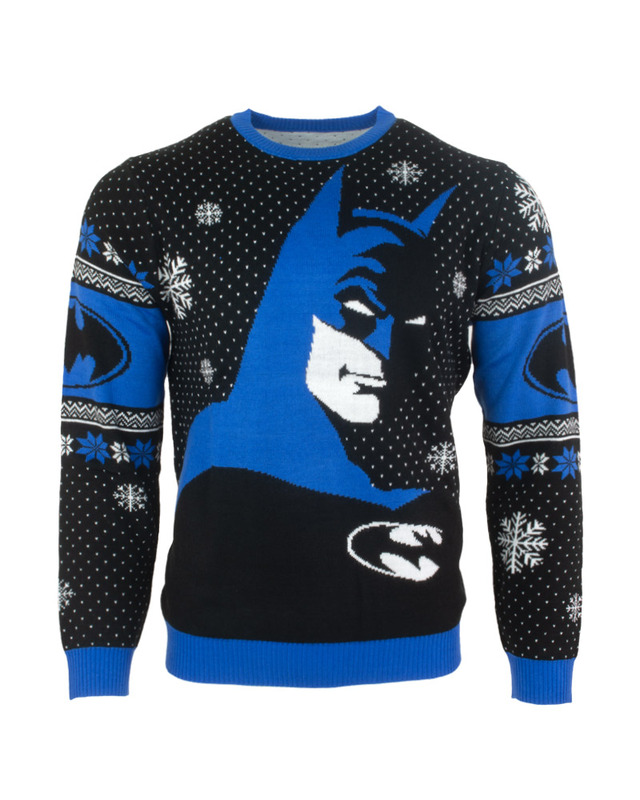 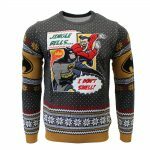 Amazon/other: This officially licensed Batman Christmas jumper is fully knitted with a patch embroidery design featuring Batman and The Joker in their original animated designs from the classic 90s TV show. 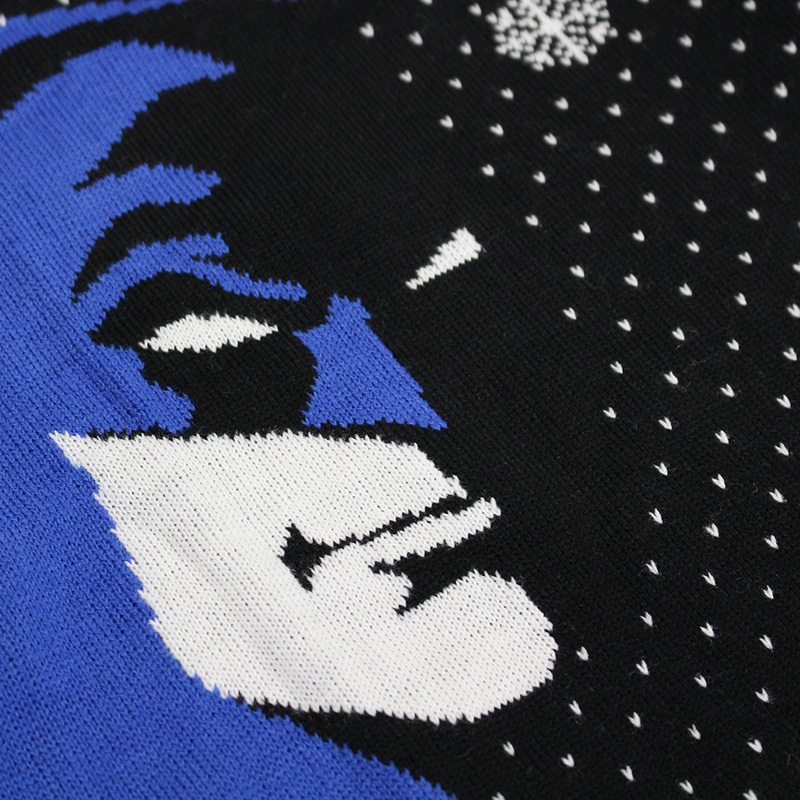 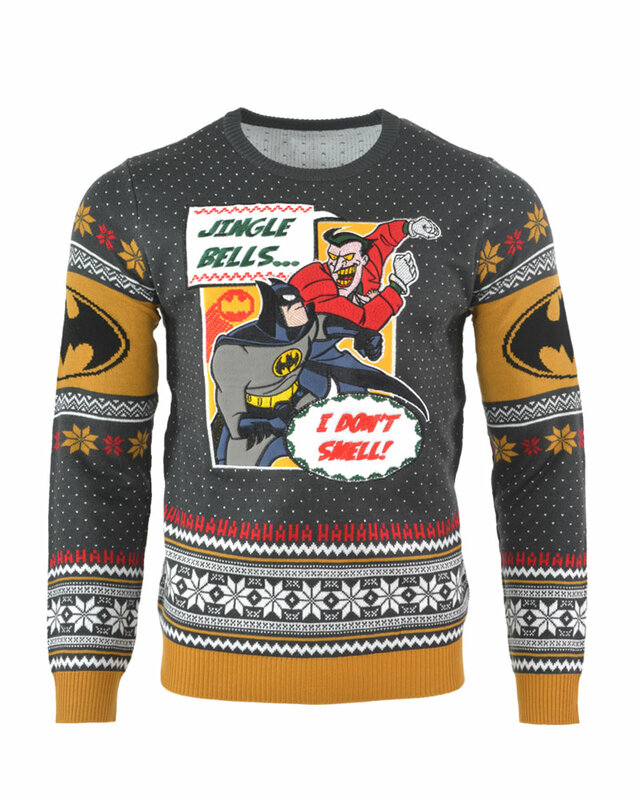 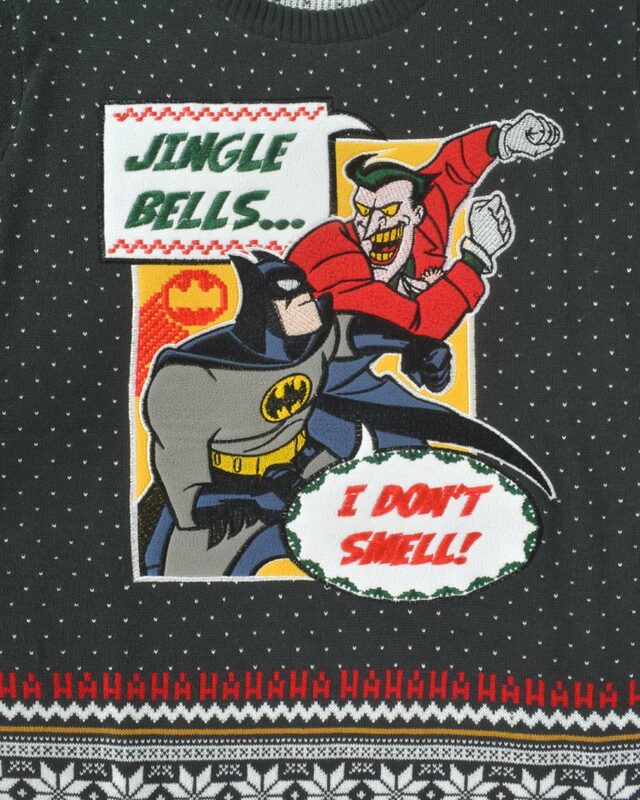 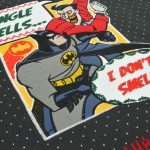 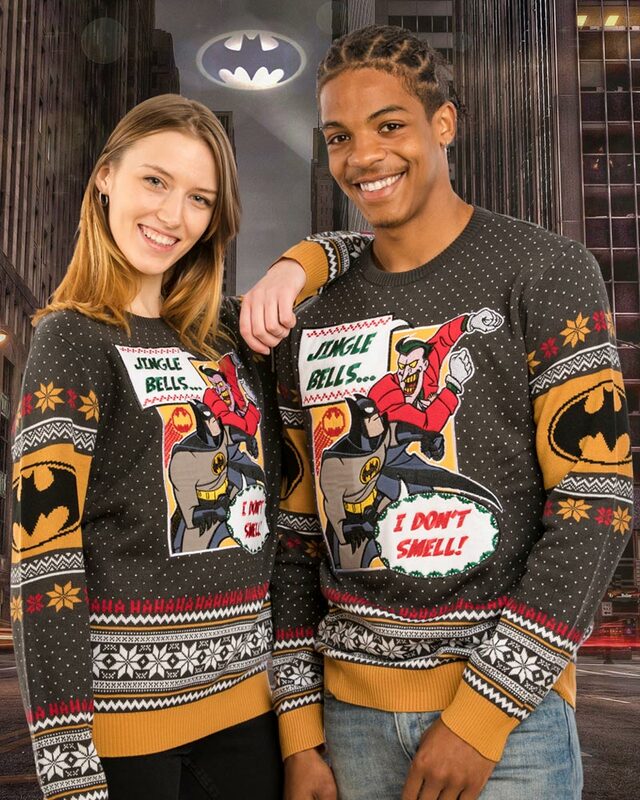 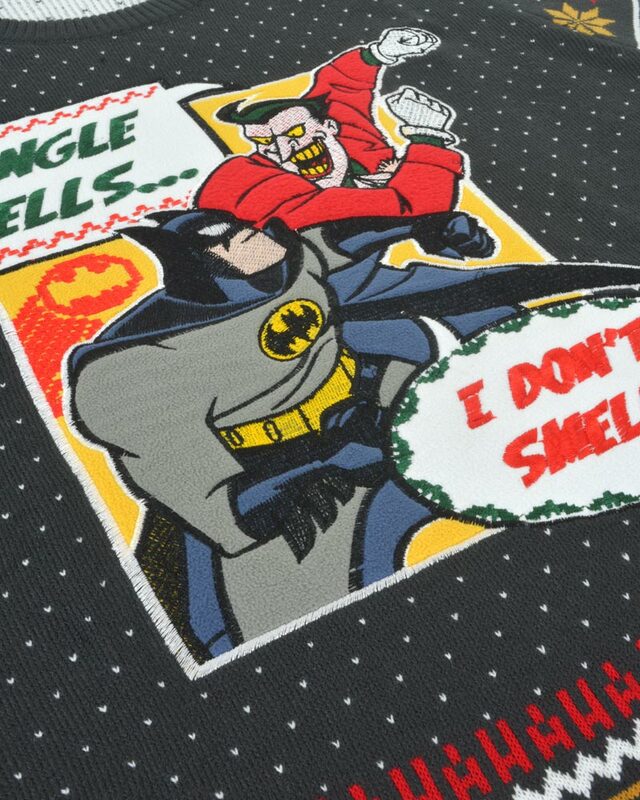 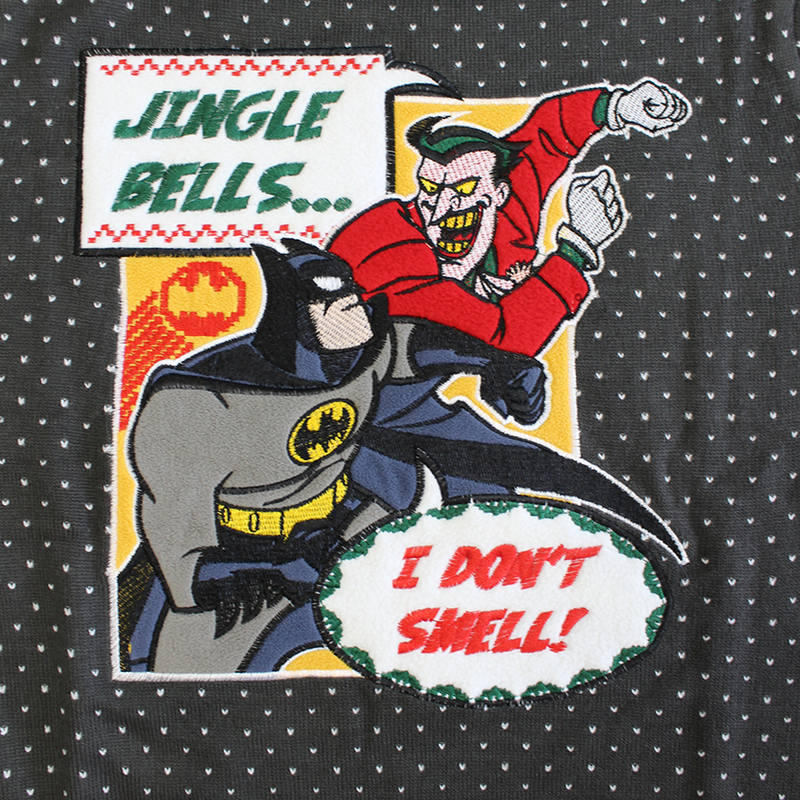 Featuring a gag based on the ‘Jingle Bells, Batman smells’ rhyme, this Xmas geeky sweater has Christmassy details and Batman logos throughout for that authentic geeky festive vibe! 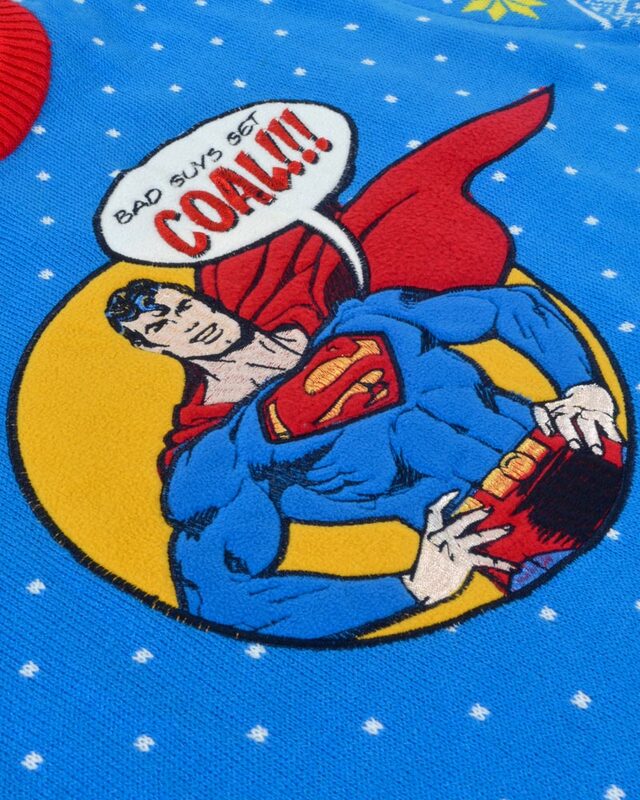 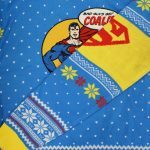 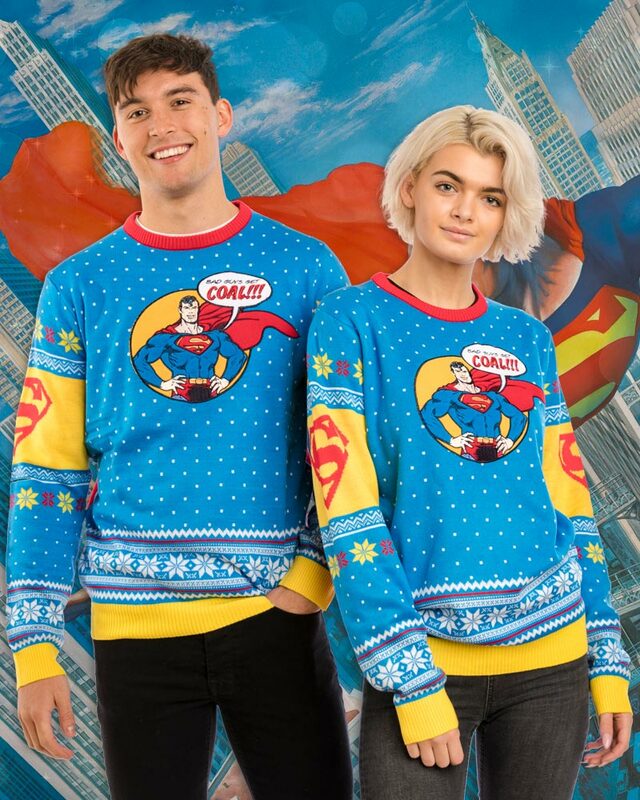 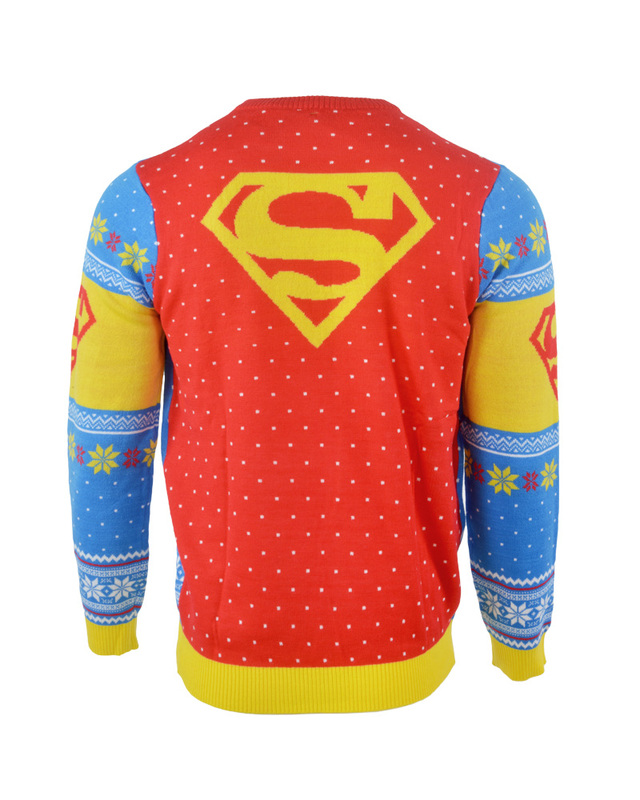 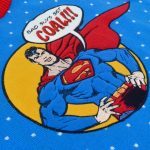 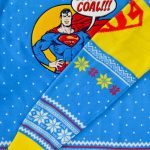 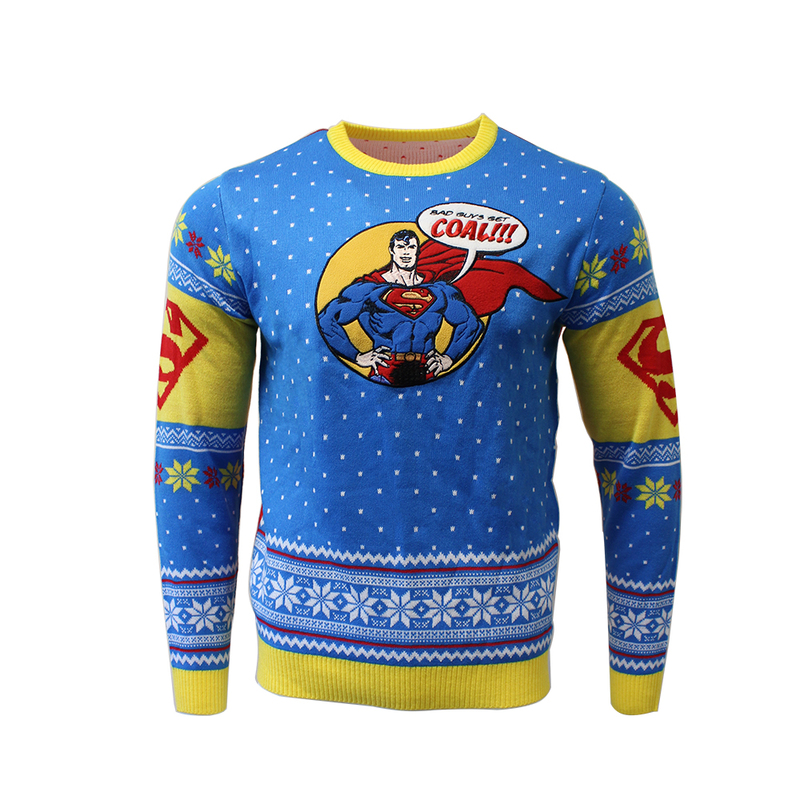 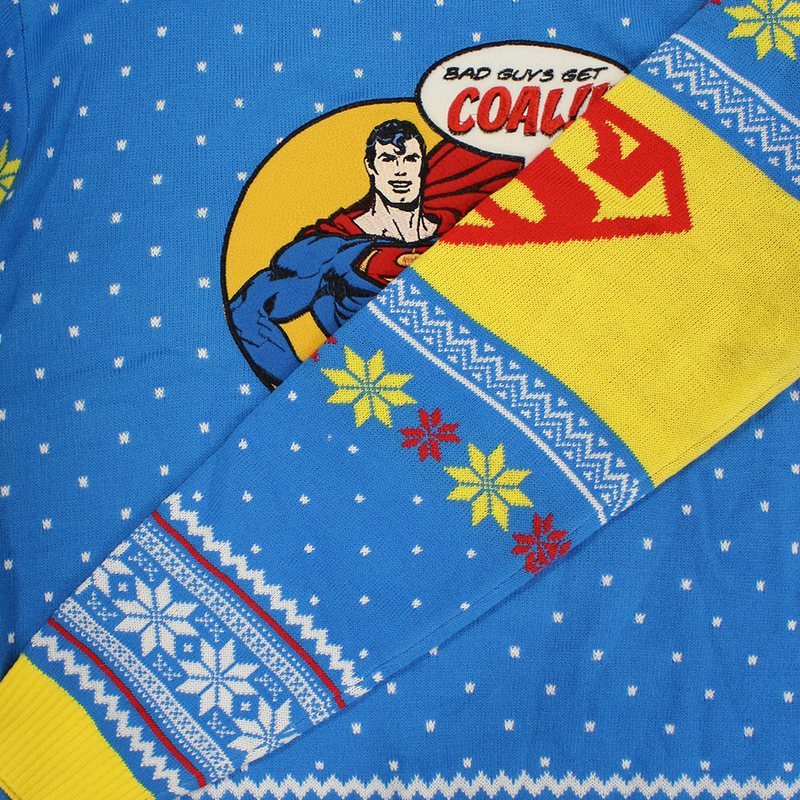 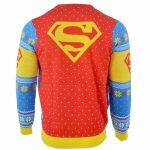 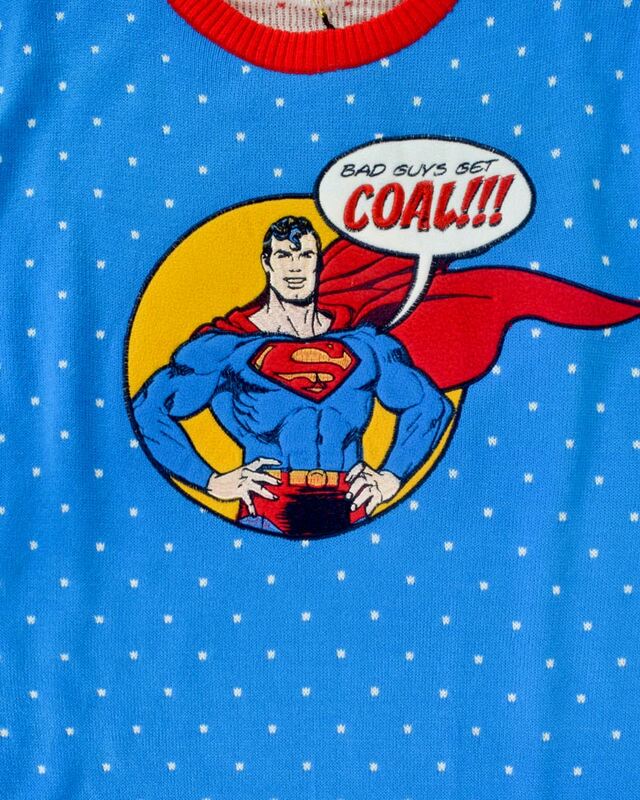 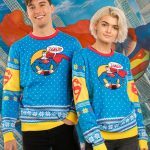 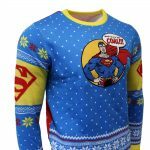 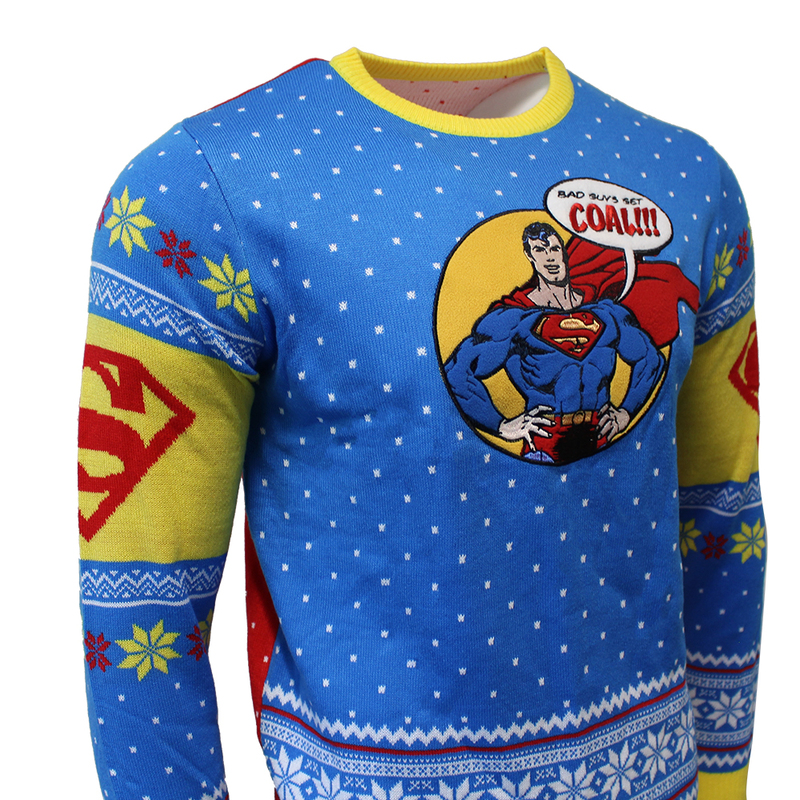 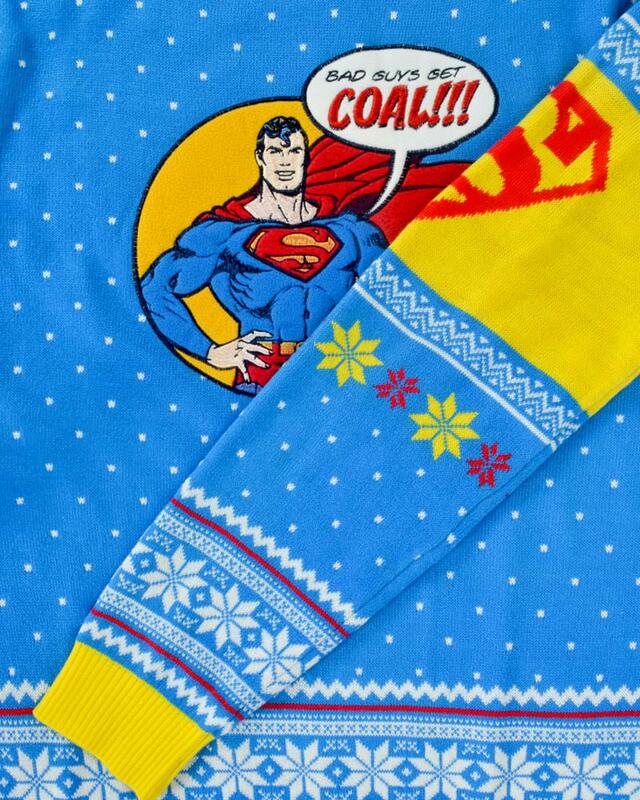 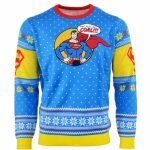 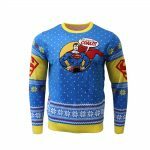 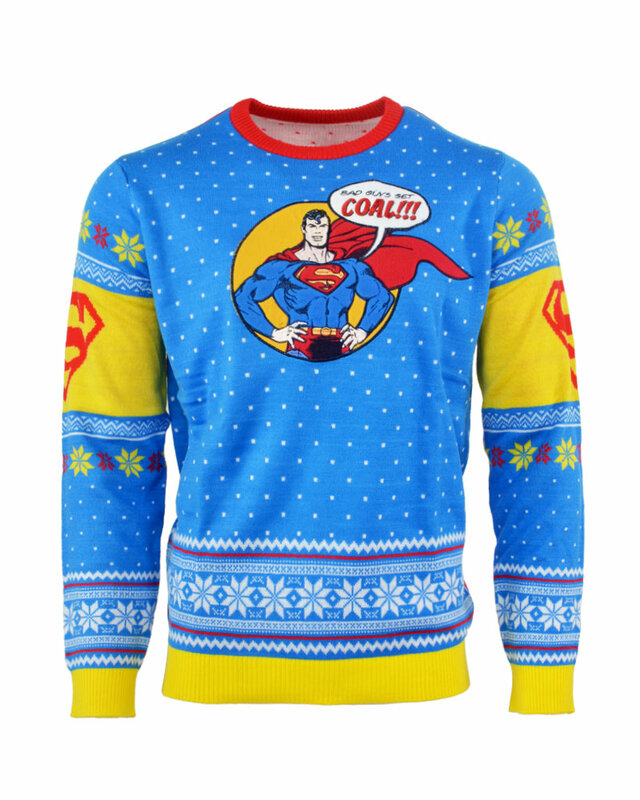 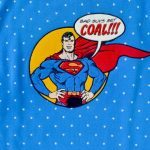 Amazon/other: This officially licensed Superman Christmas jumper features the world’s best superhero himself giving a bold Xmas warning to anybody not on Santa’s nice list. 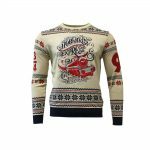 Fully knitted with a patch embroidery design, and features an iconic ‘S’ on the back, this is an Xmas jumper for all true holiday heroes! 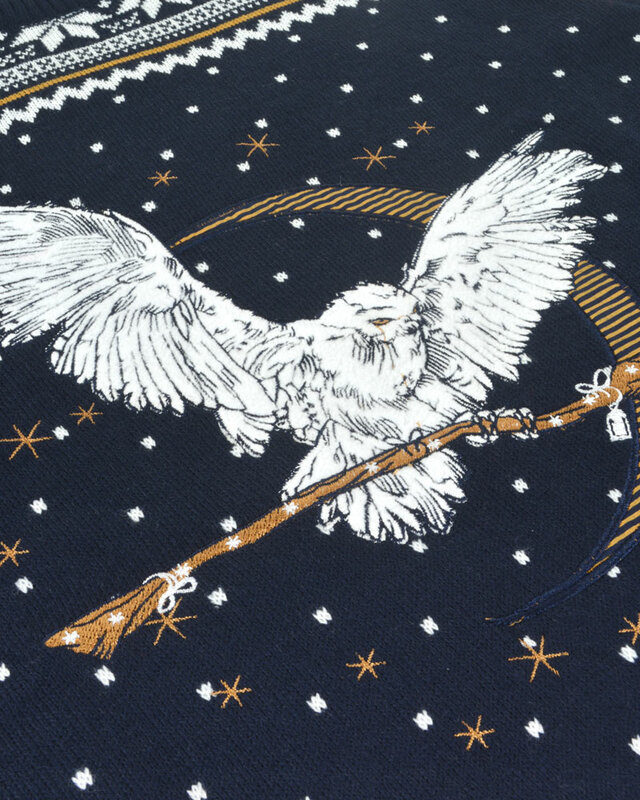 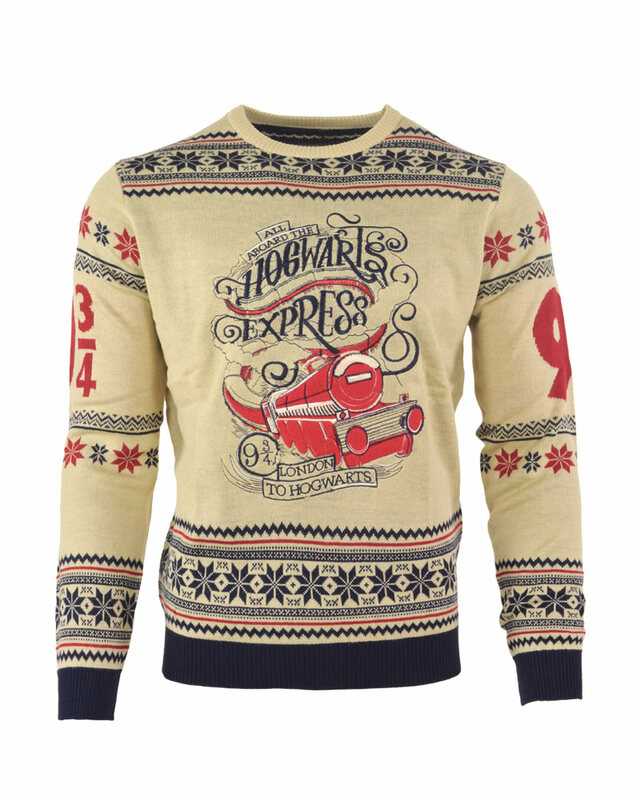 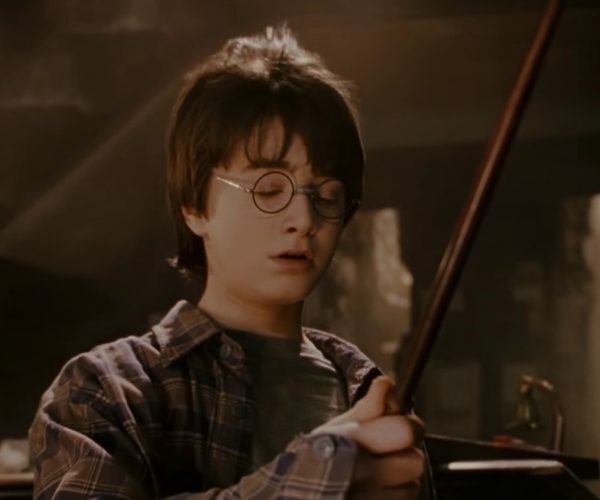 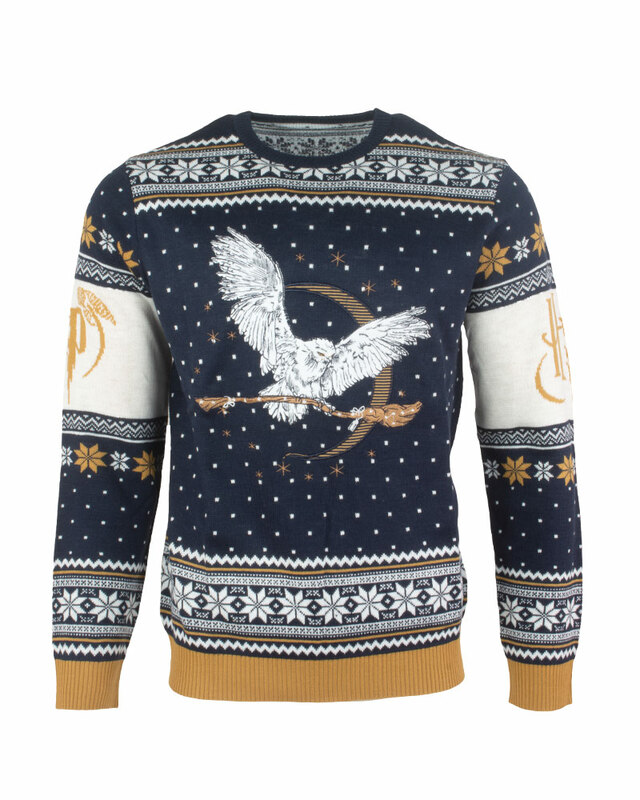 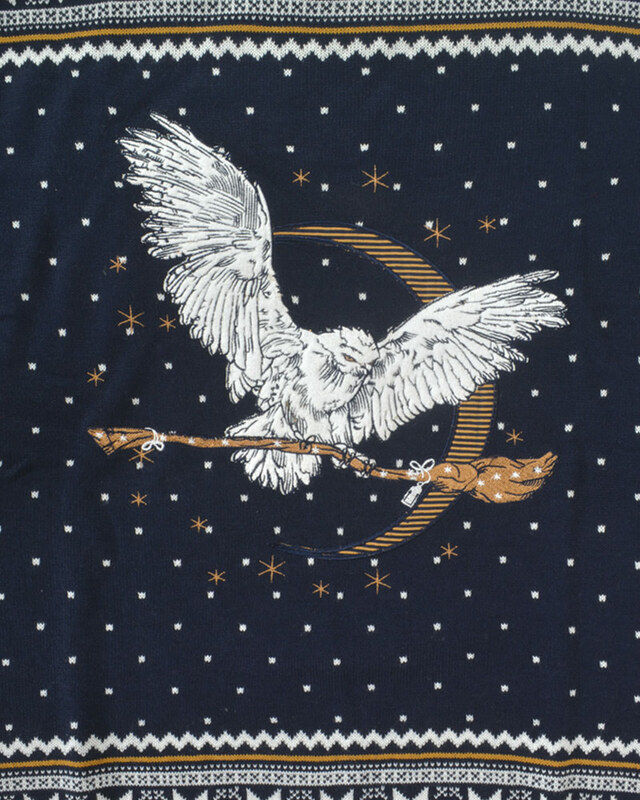 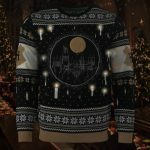 Amazon/other: This officially licensed Harry Potter Christmas jumper is the ideal holiday-wear for all Harry Potter super fans. 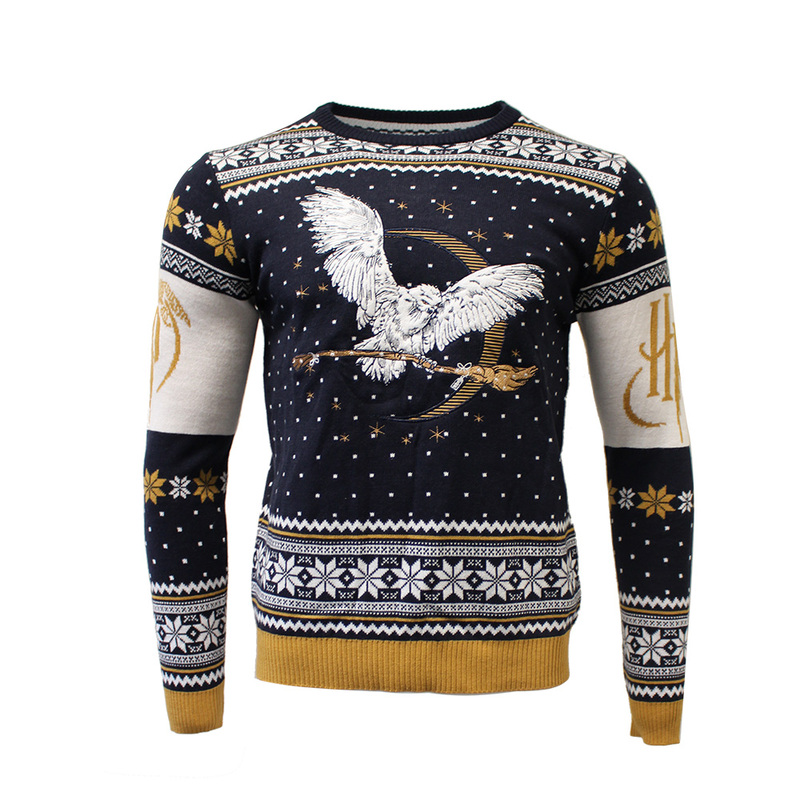 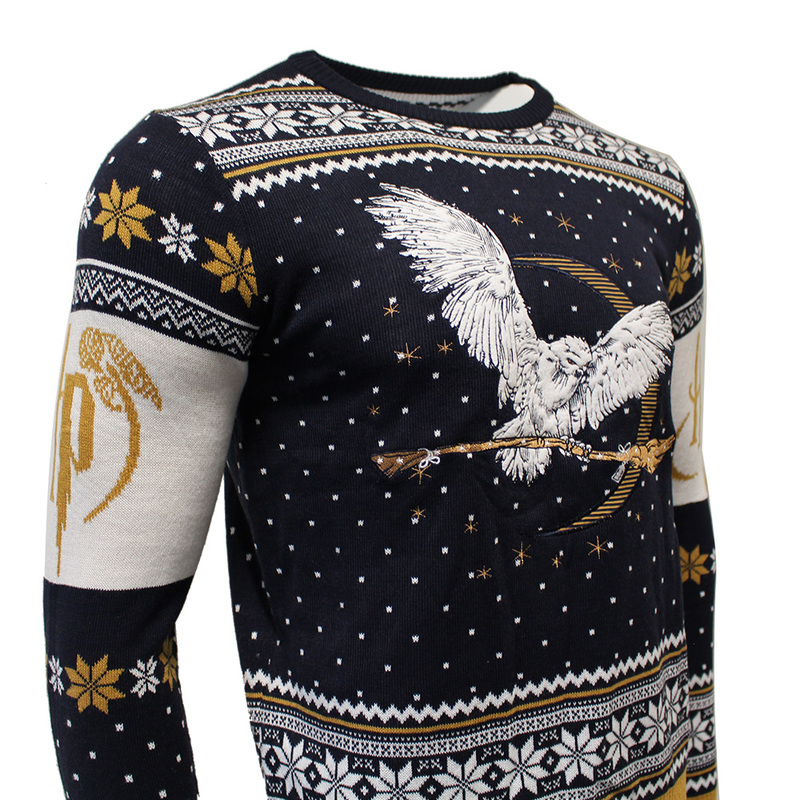 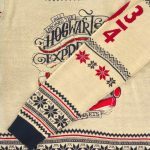 Fully knitted with a patch embroidery design based on Hedwig the owl, this ugly sweater is a real treat that lets fans celebrate Xmas exactly how they want – with a bit of magic! 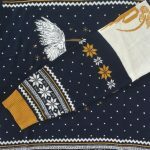 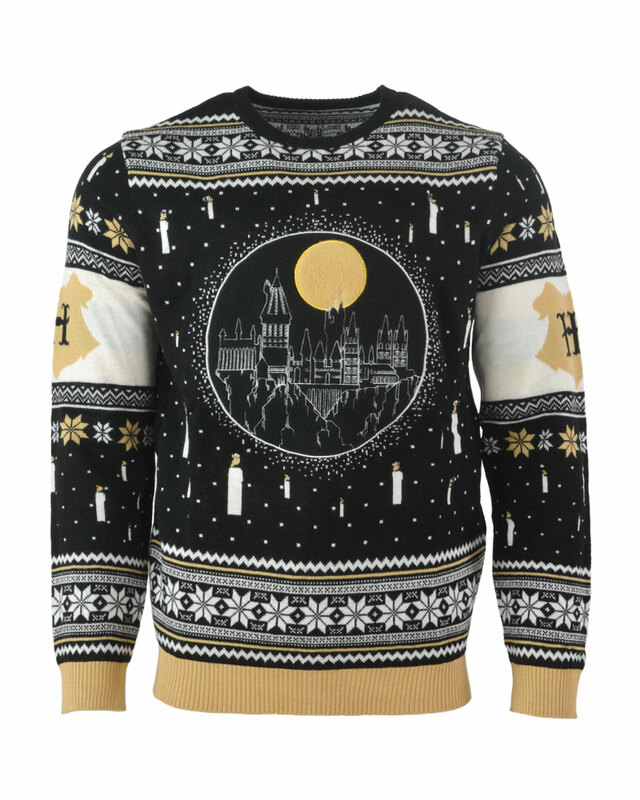 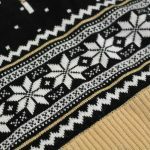 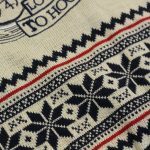 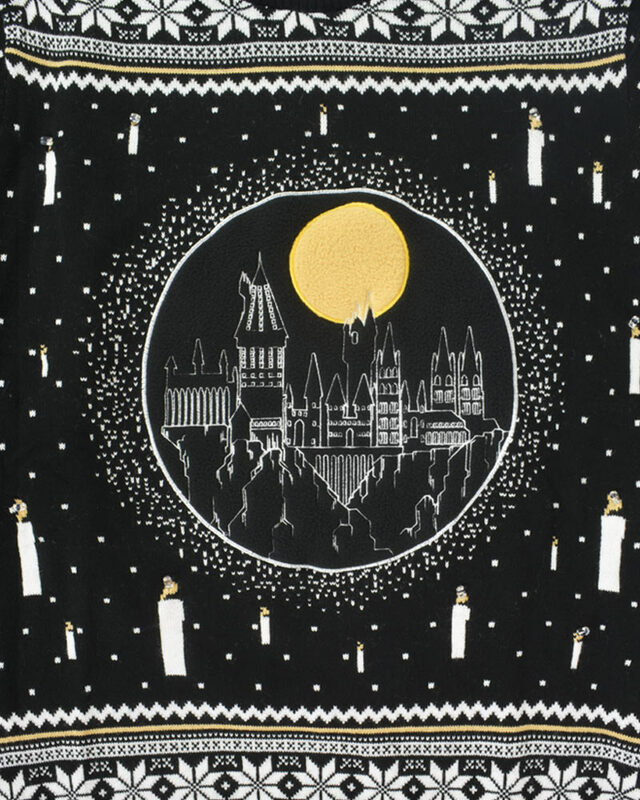 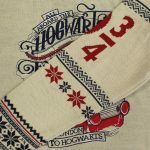 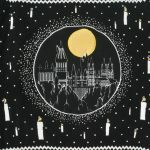 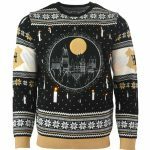 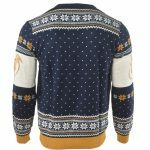 Amazon/other: This officially licensed Harry Potter Christmas jumper is fully knitted with a patch embroidery design based on Hogwarts Castle. 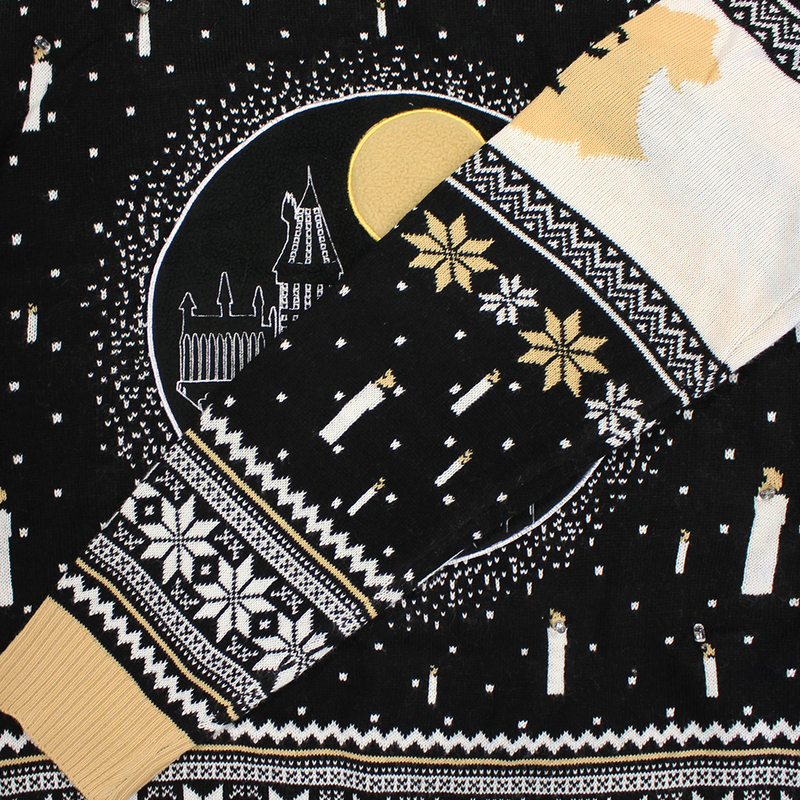 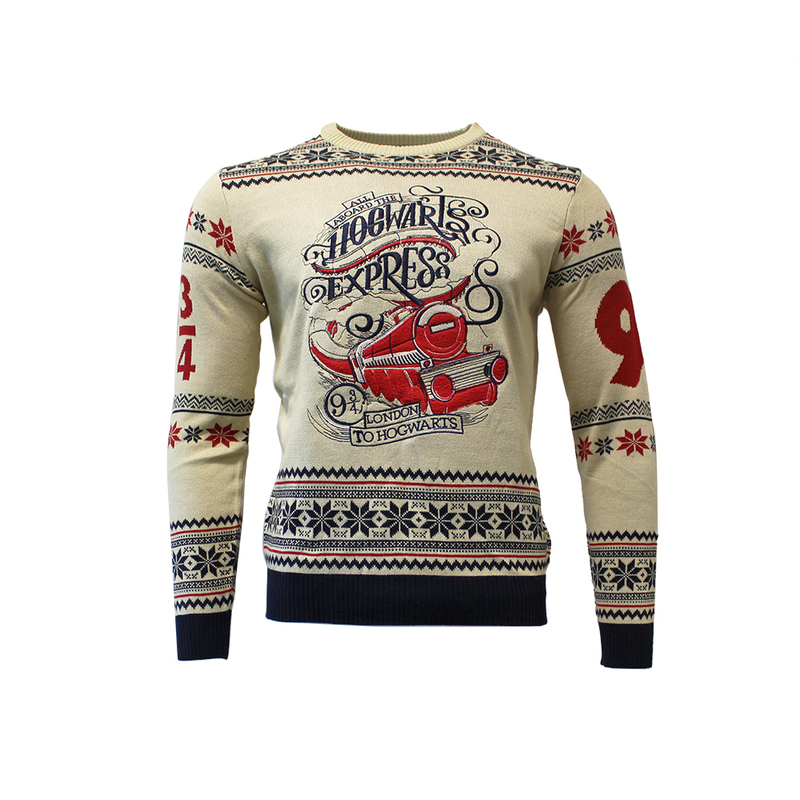 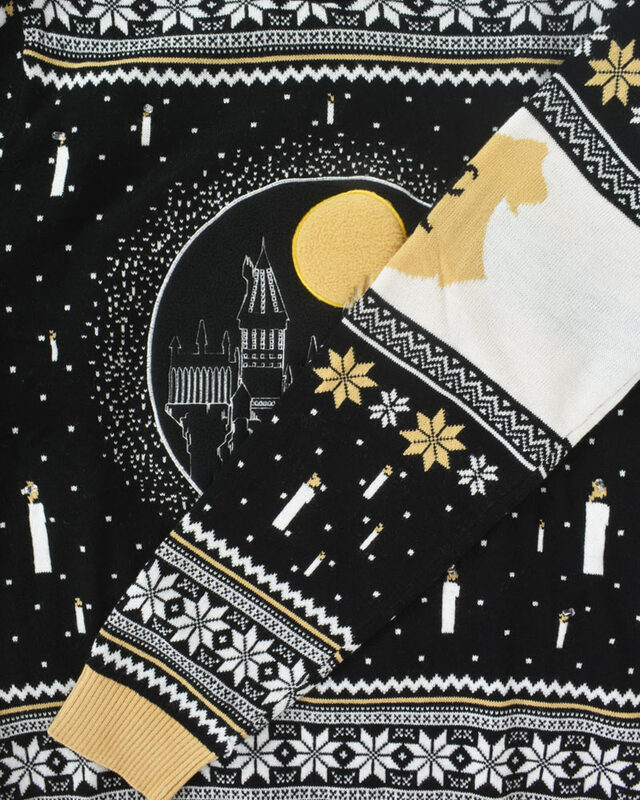 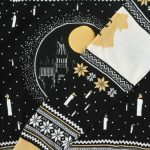 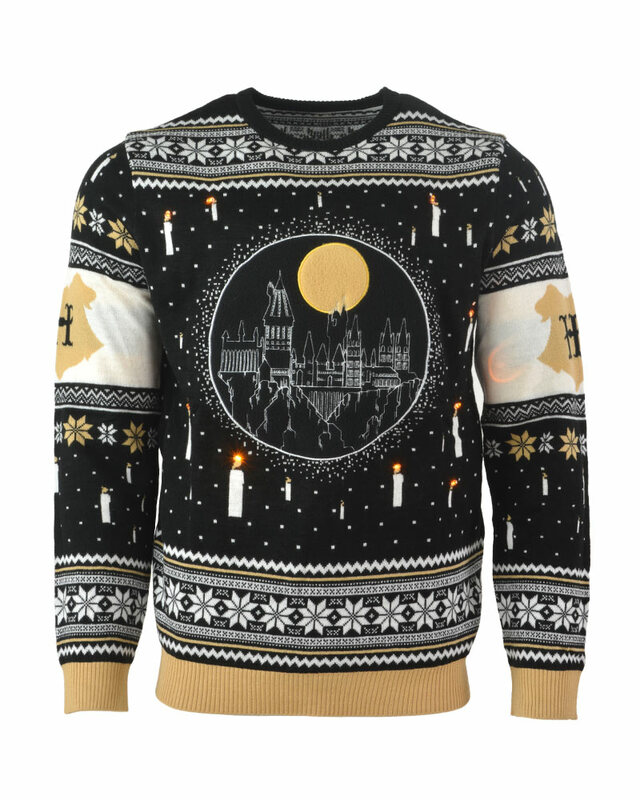 Featuring plenty of Christmassy and Harry Potter themed details throughout, the best thing about this geeky Xmas sweater is that it’s covered in LED candles that light up and flicker for that ultimate Christmas/Hogwarts Castle effect! 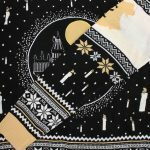 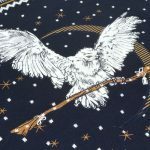 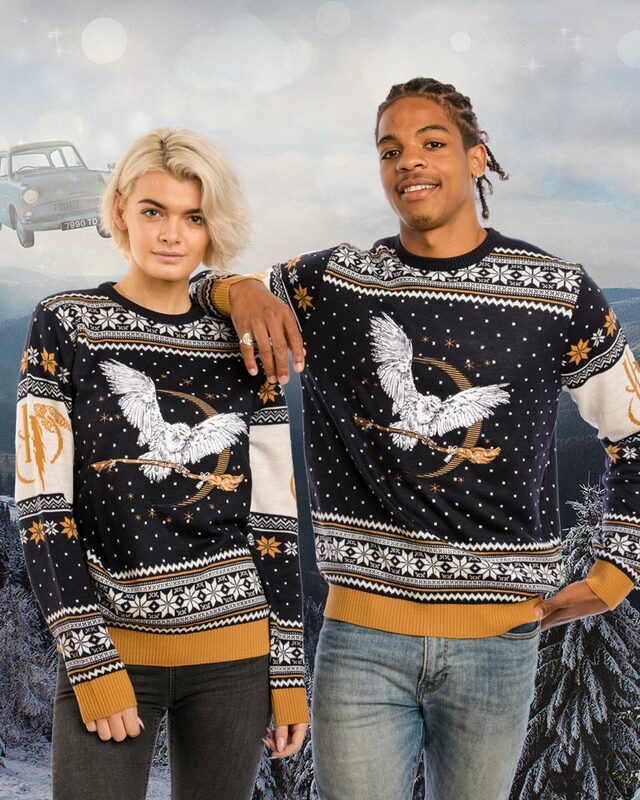 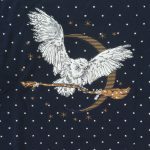 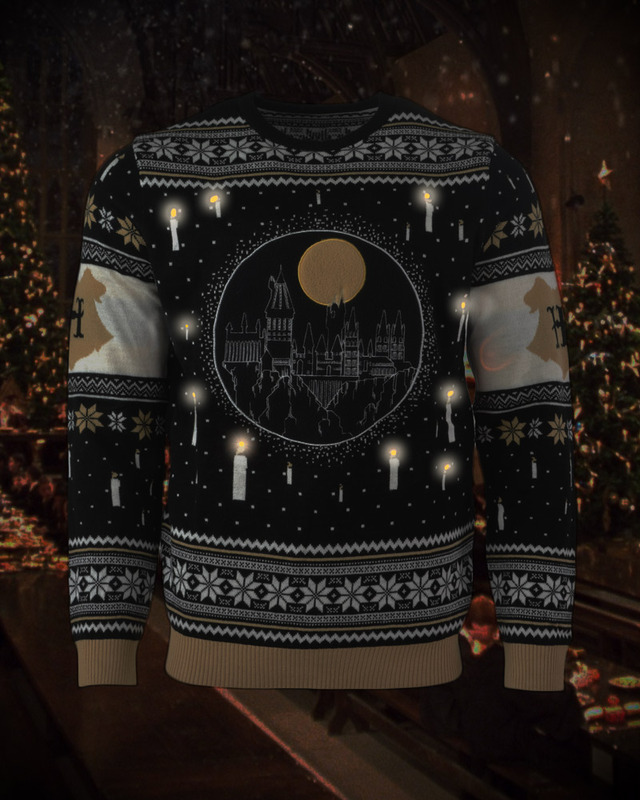 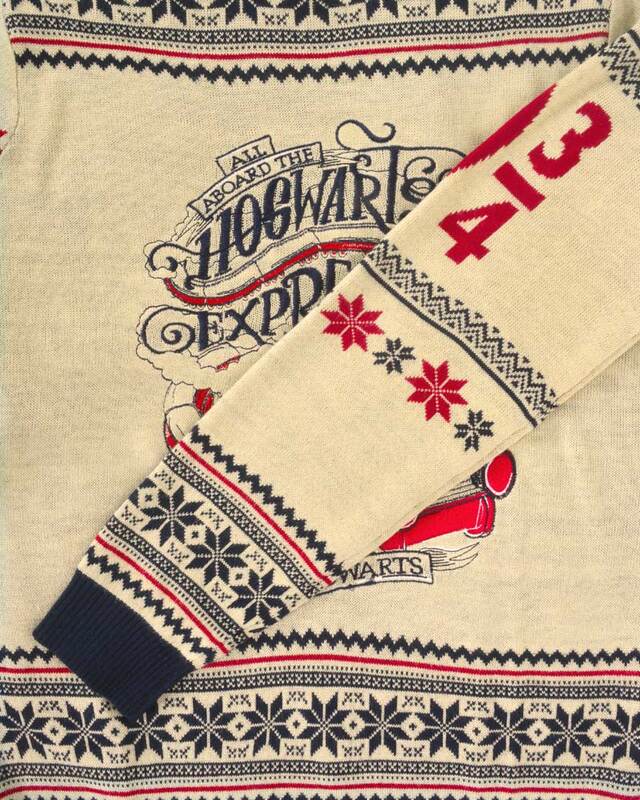 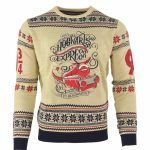 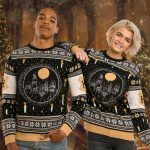 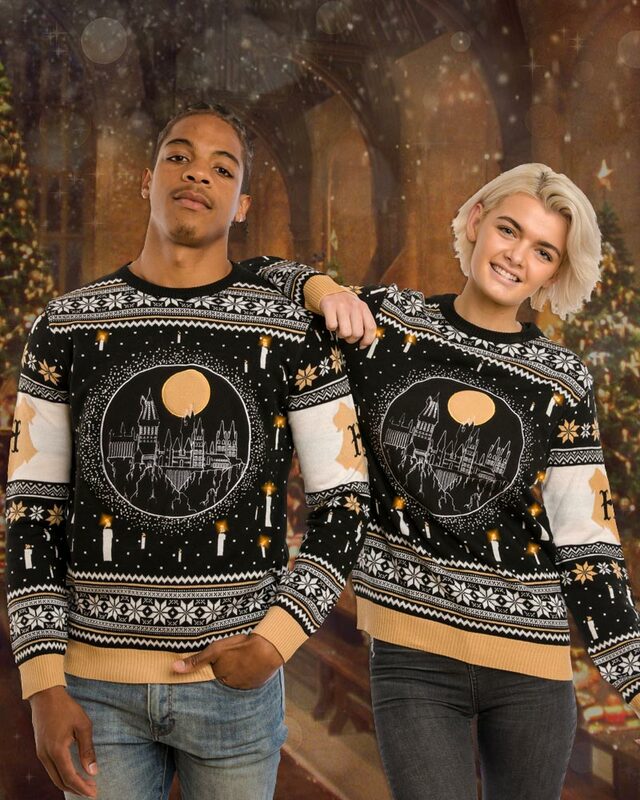 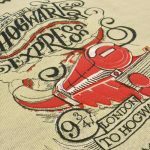 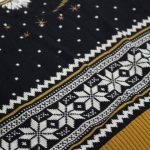 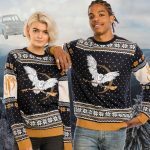 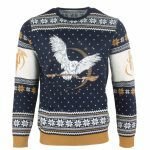 Amazon/other: This officially licensed Harry Potter Christmas jumper is the perfect way for fans to stay warm and display their love for their favourite magical series – all on a very festive themed ‘ugly’ Xmas sweater! 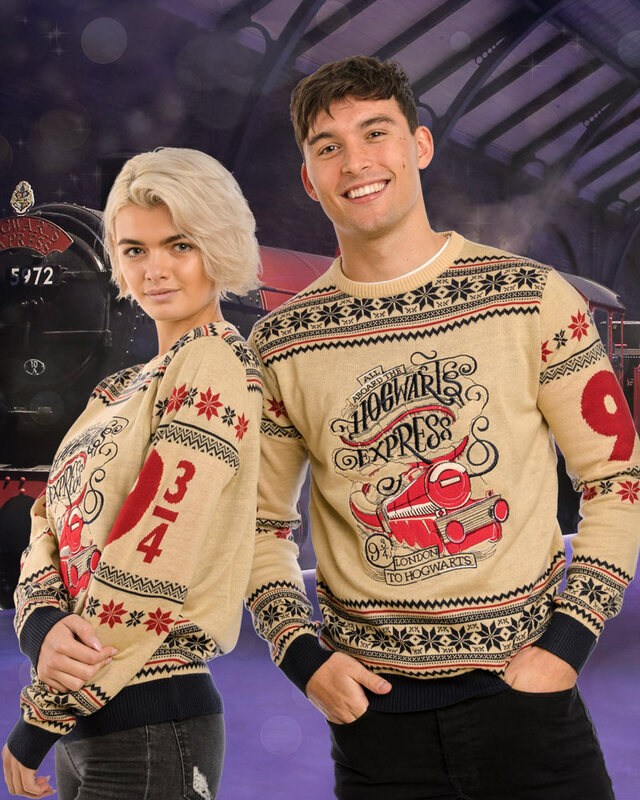 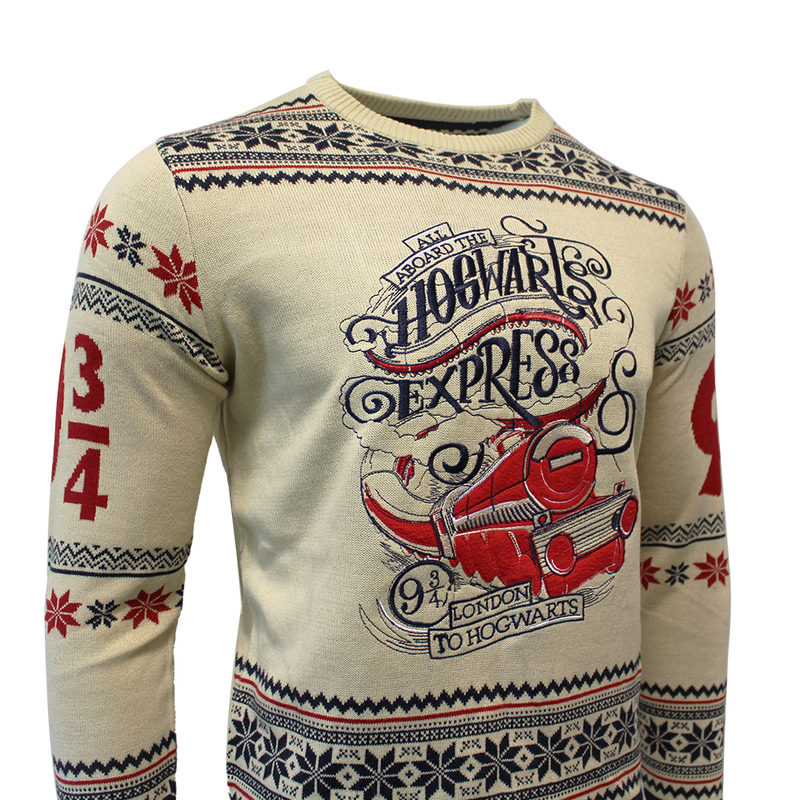 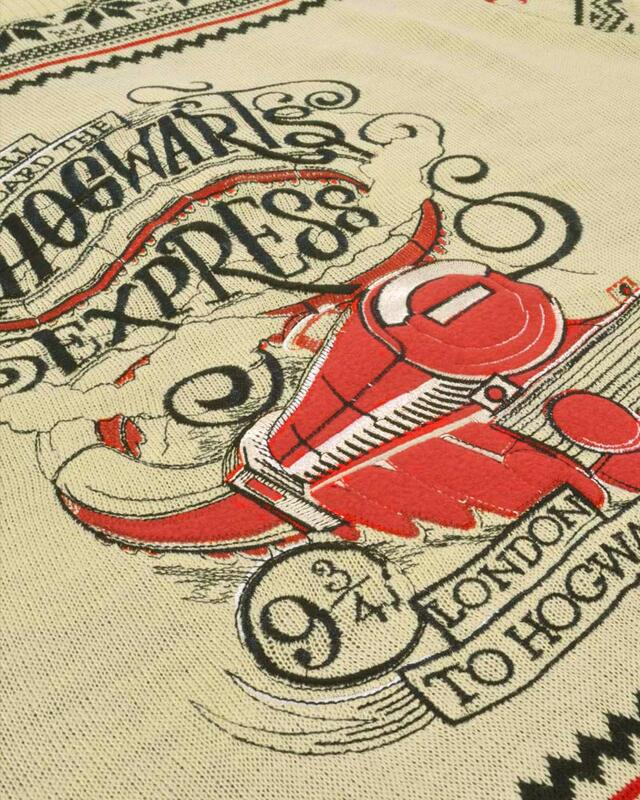 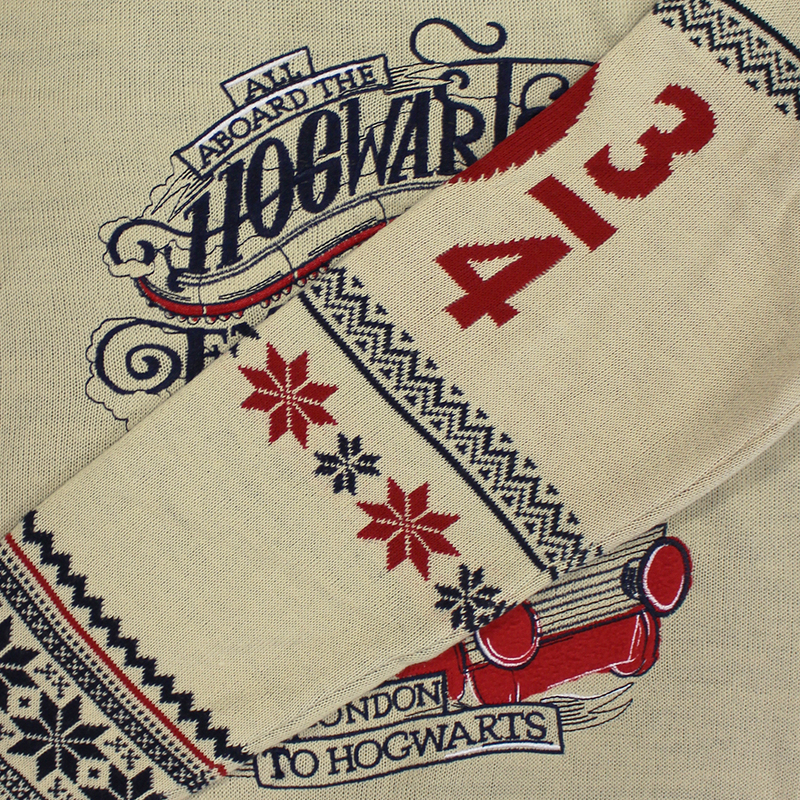 Featuring a design based on the Hogwarts Express, with Platform 9 ¾ details throughout, this knitted jumper is great for every fan! 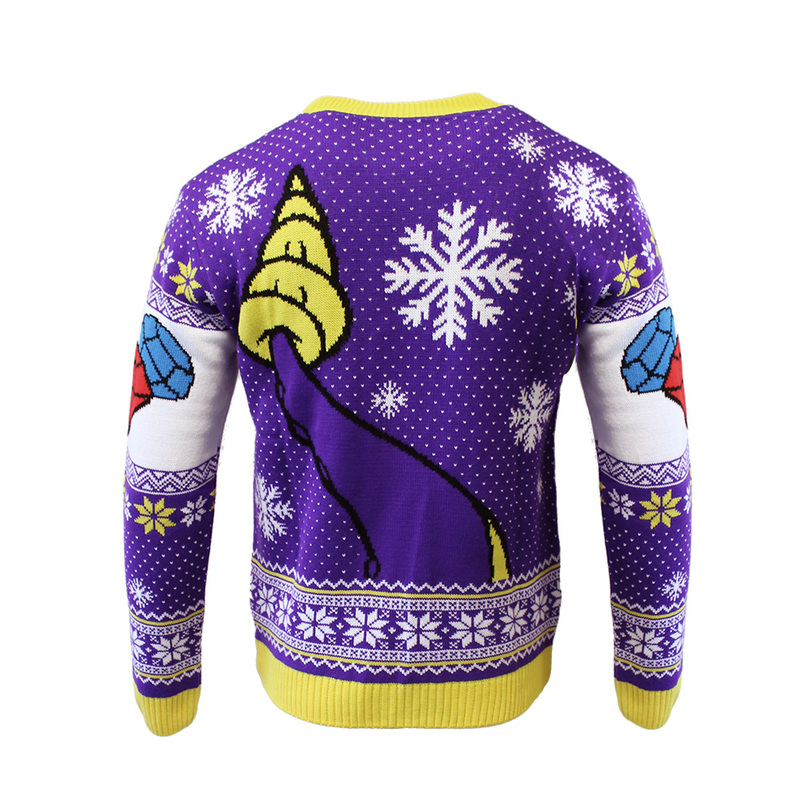 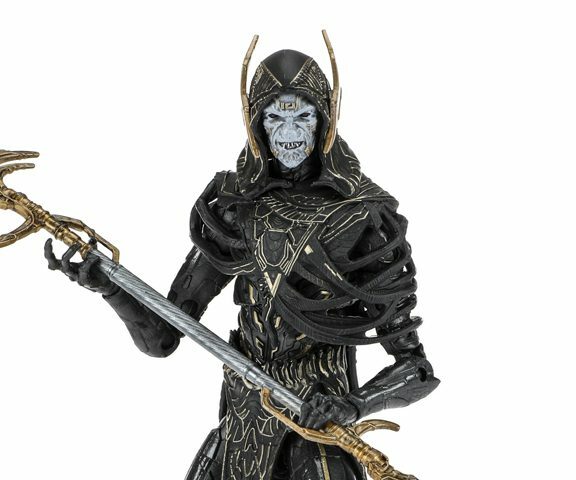 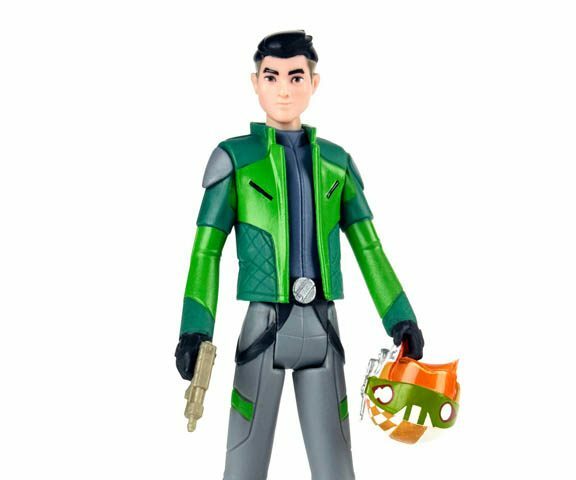 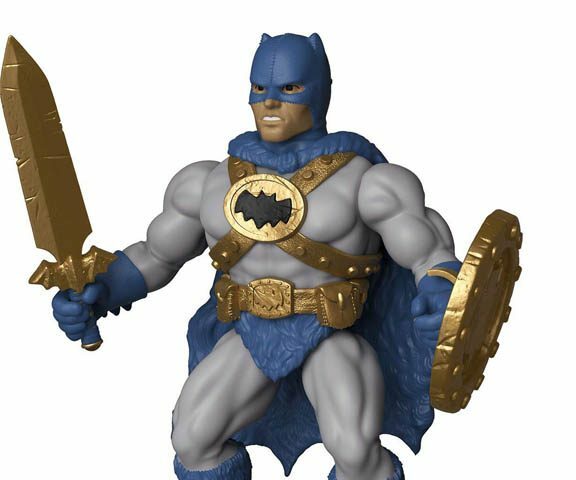 Comes with a free bonus pin! 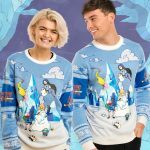 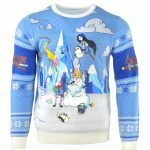 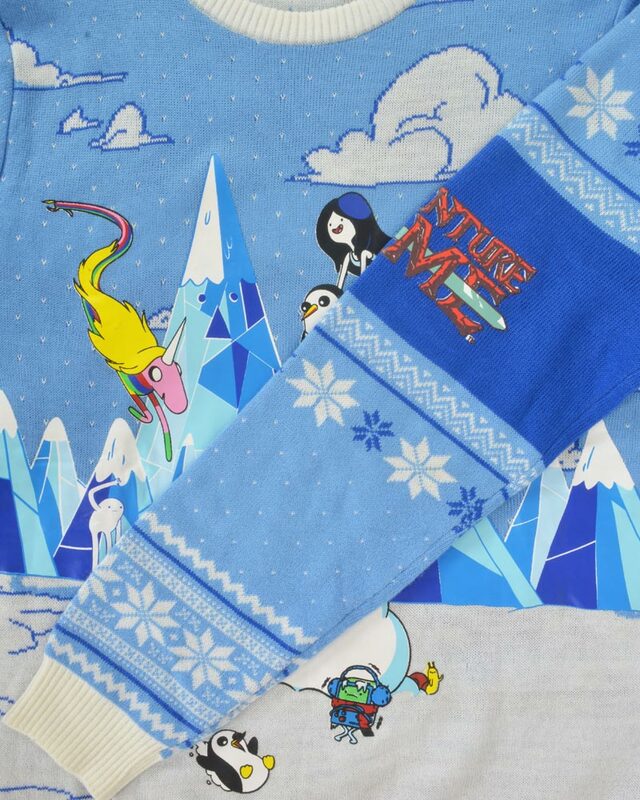 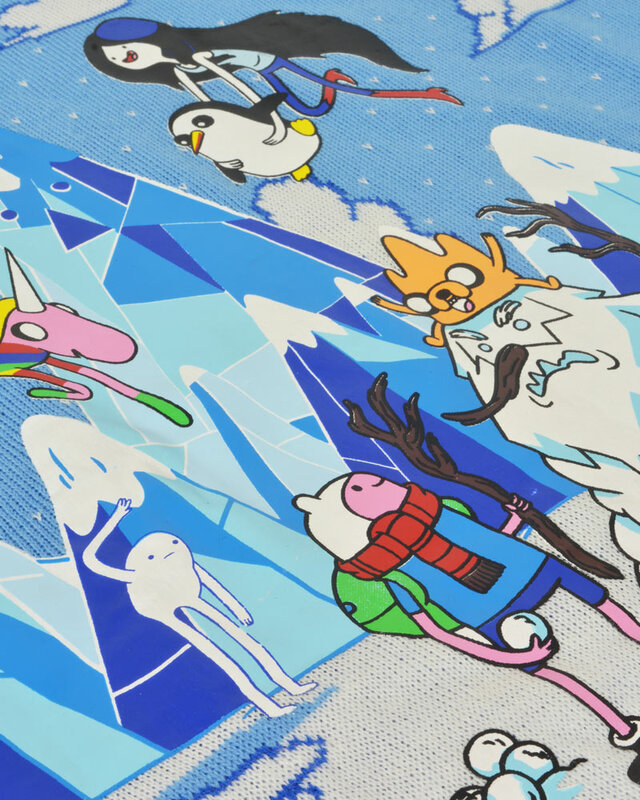 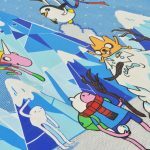 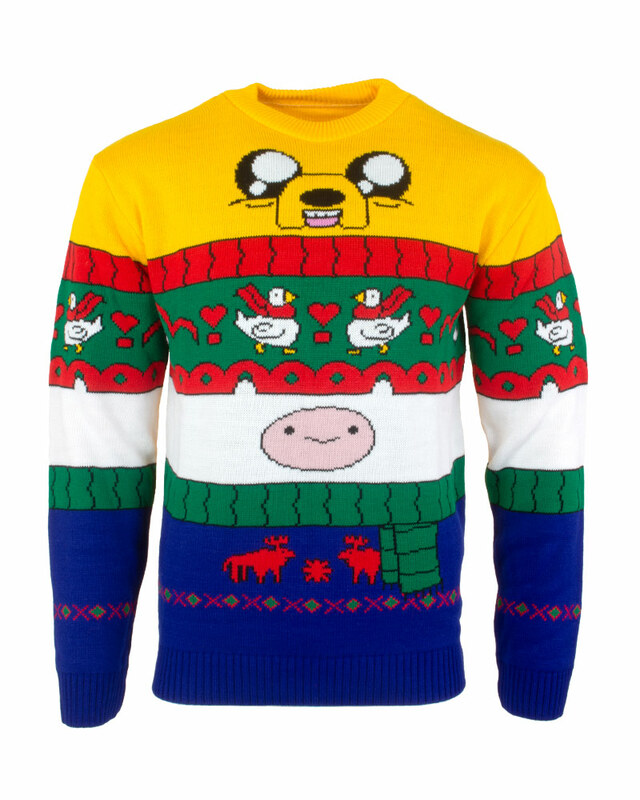 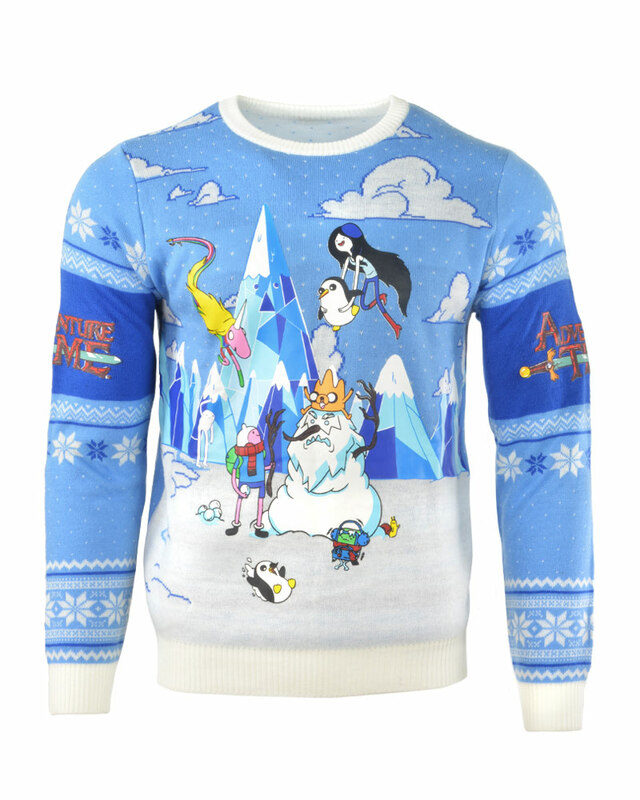 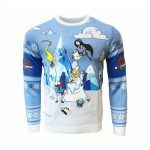 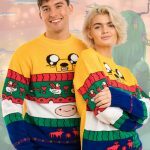 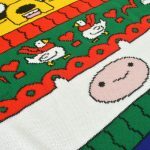 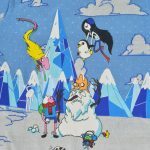 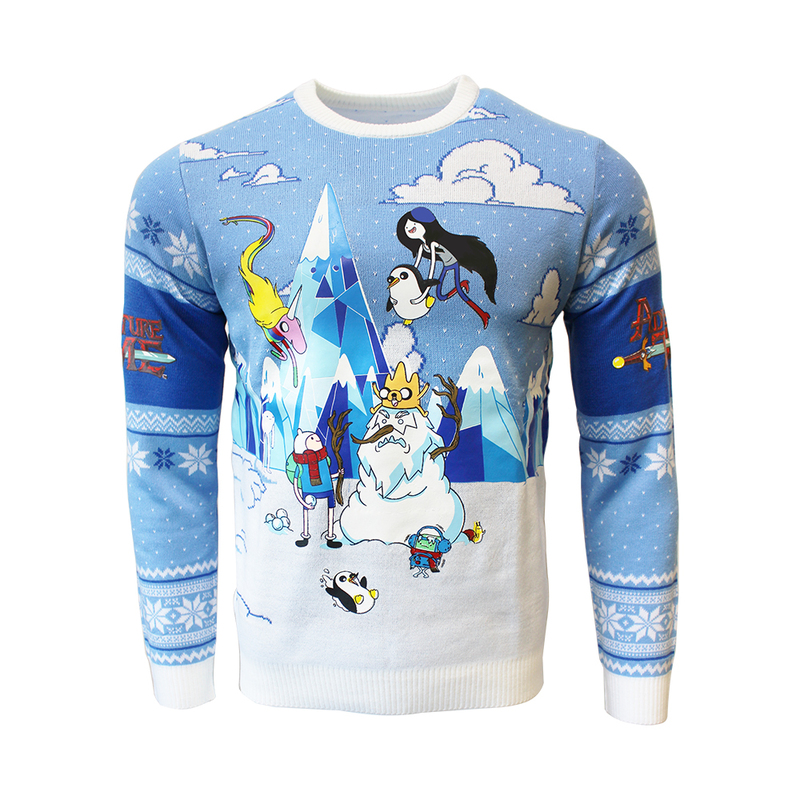 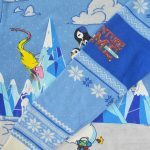 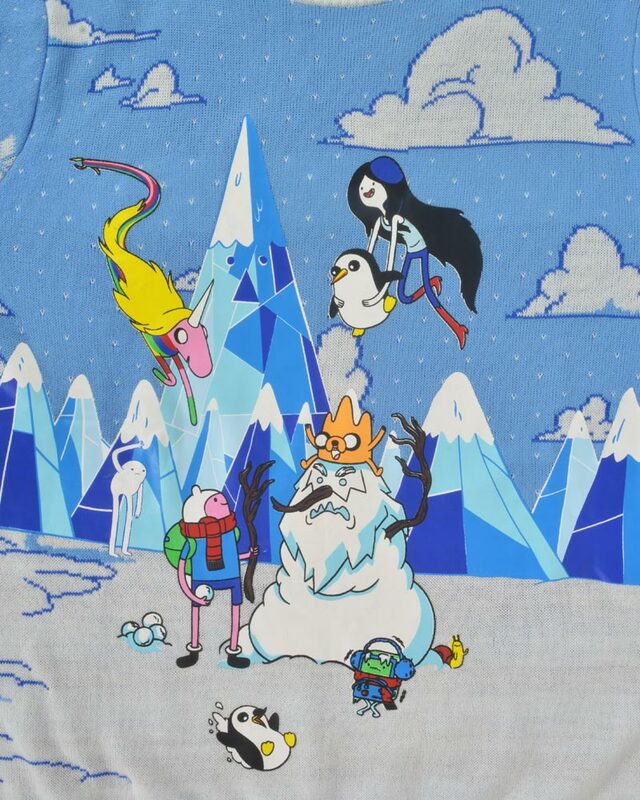 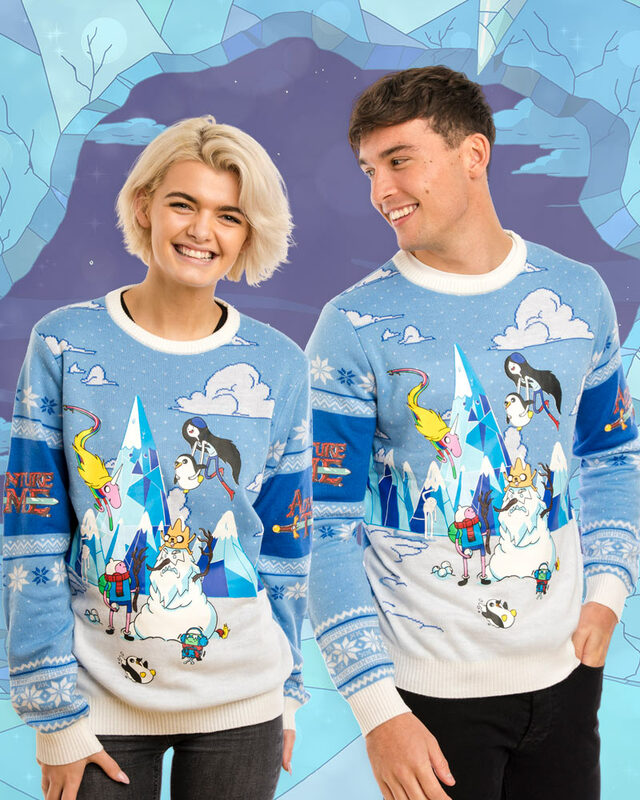 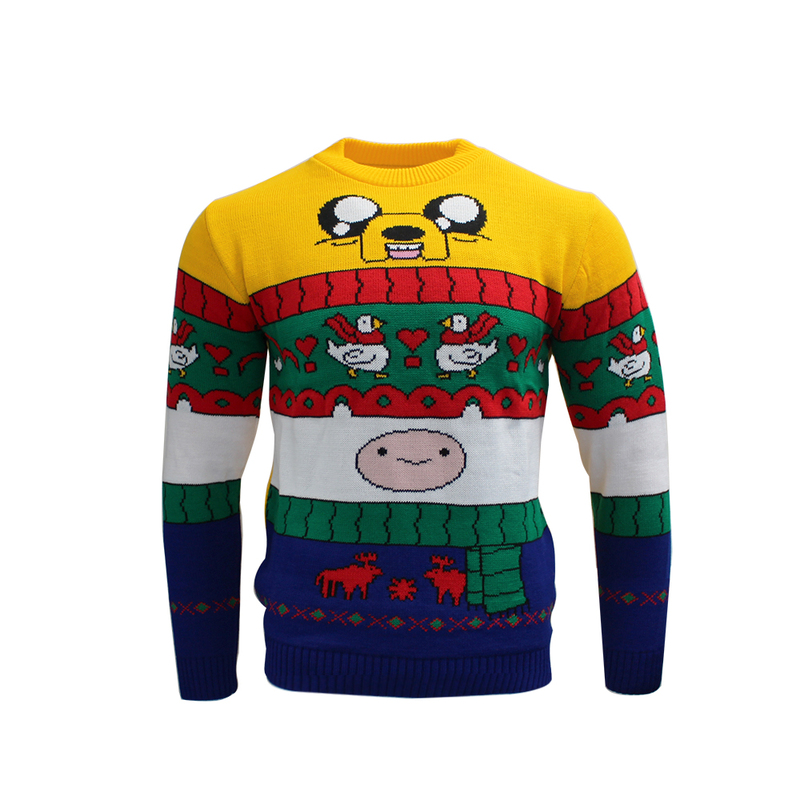 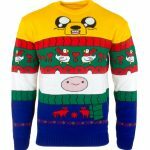 Amazon/other: This officially licensed Adventure Time Xmas jumper, which comes packaged with a free bonus pin, is anything but an ugly Christmas sweater. 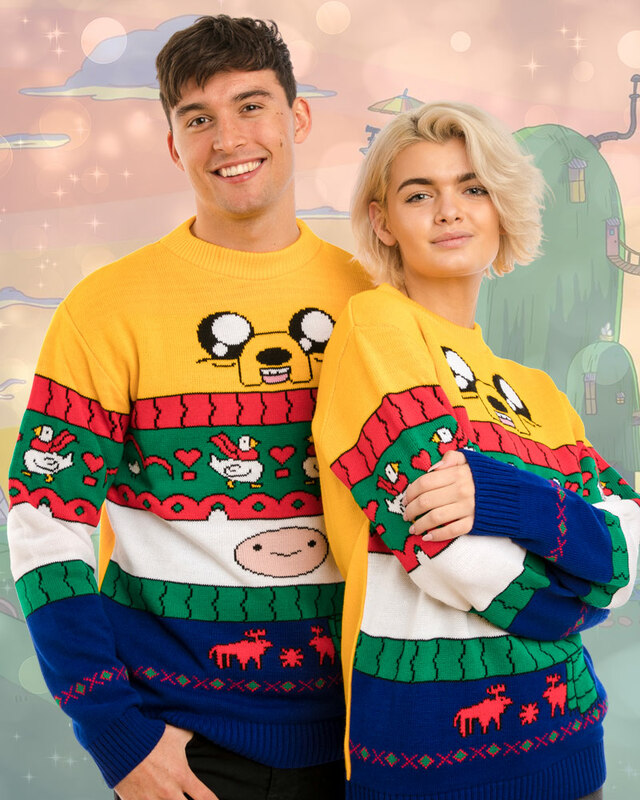 Featuring Finn, Jake, Marceline, and more, this winter-themed knitted jumper is the perfect way to wrap up warm during the festive season! 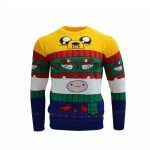 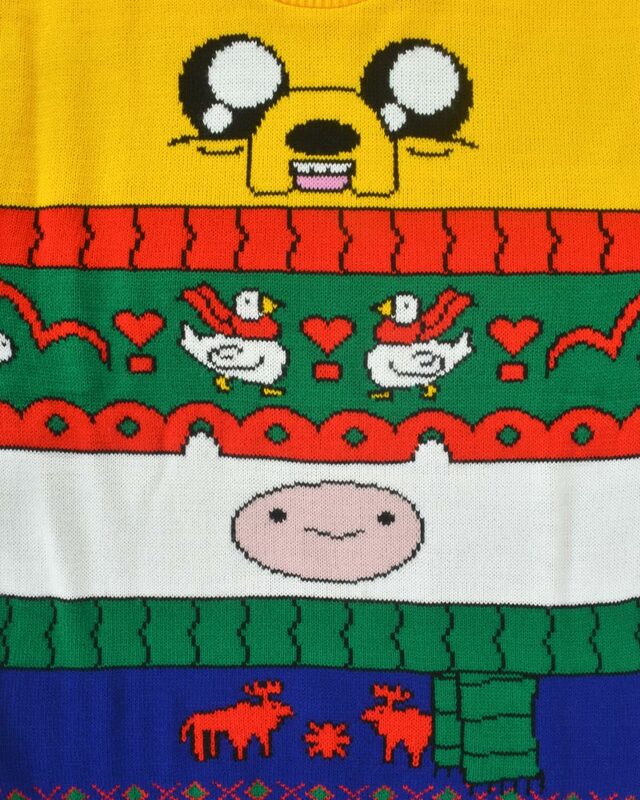 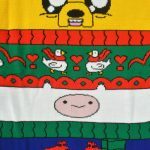 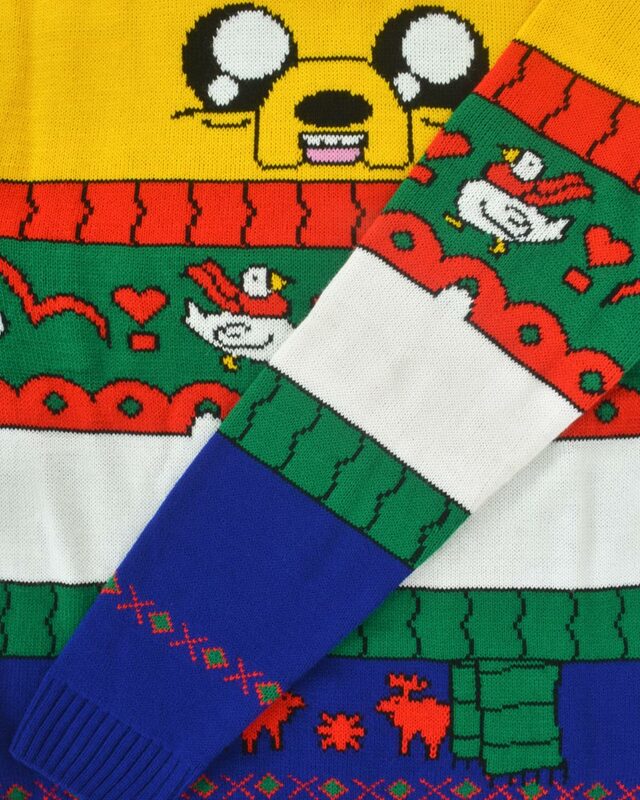 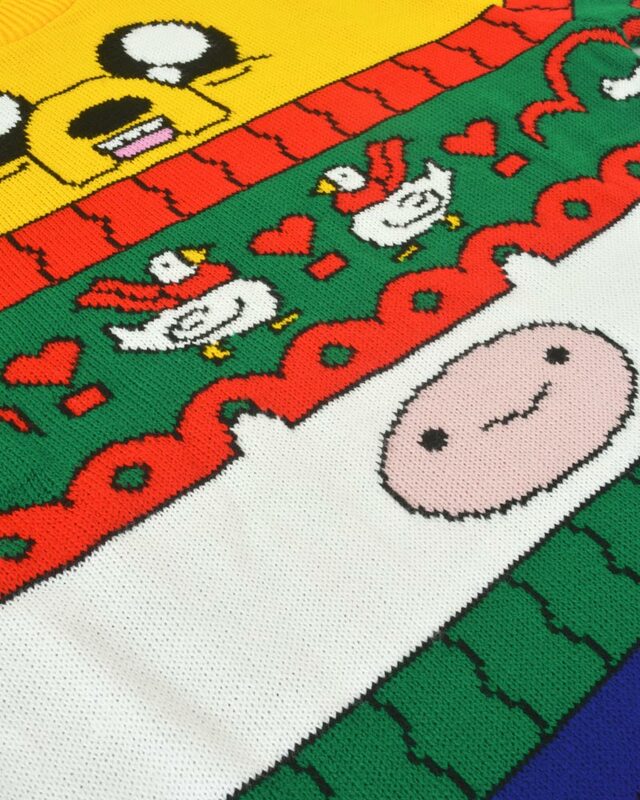 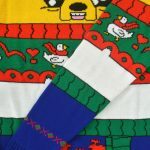 Amazon/other: This officially licensed Adventure Time Christmas jumper features Finn and Jake all stacked up, making it the best knitted Xmas sweater for everybody’s favourite Cartoon Network cartoon! 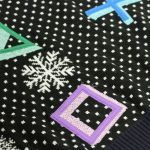 Packaged with a free bonus pin, this ugly sweater is 100% knitted and is the perfect way for fans to keep warm during the winter. 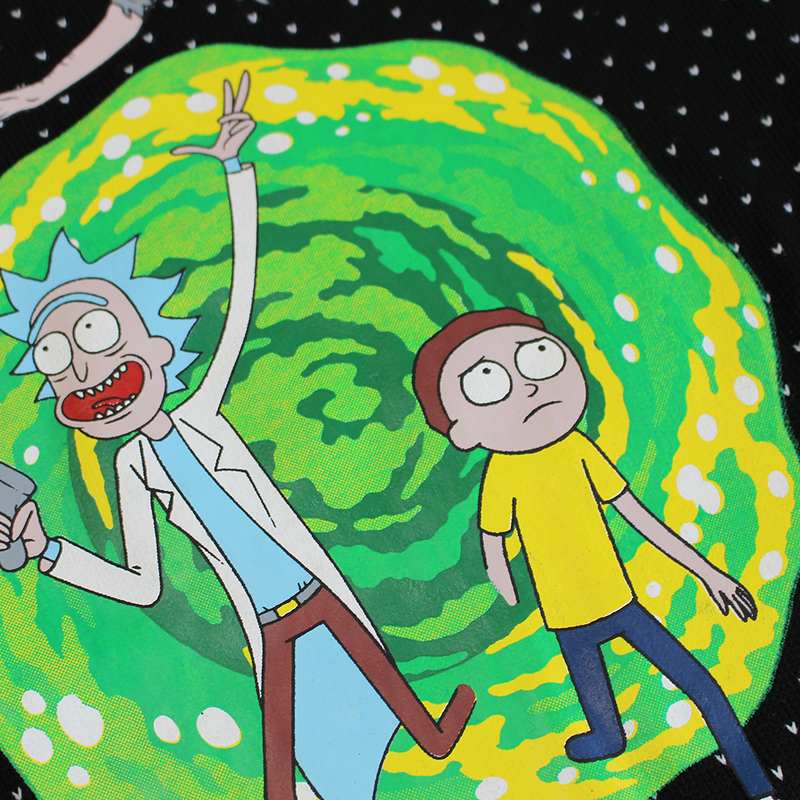 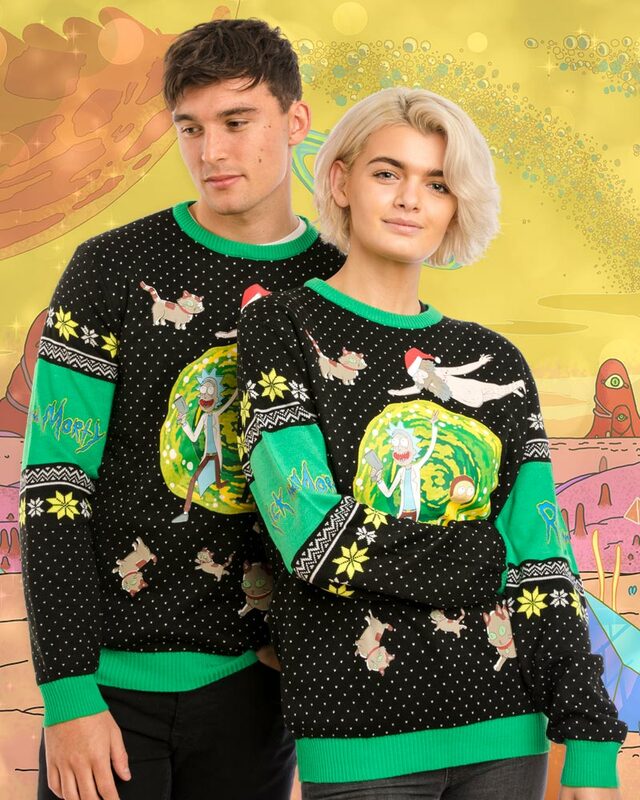 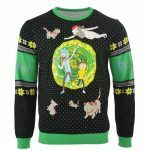 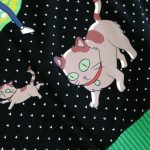 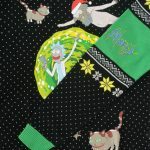 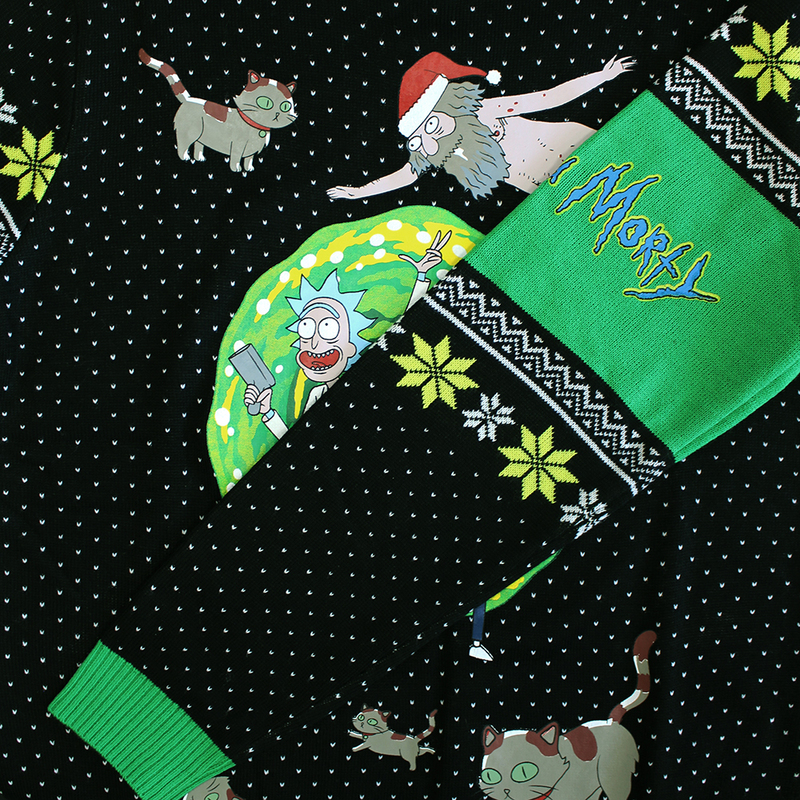 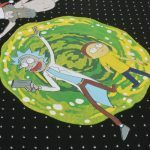 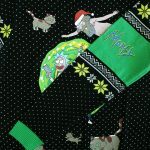 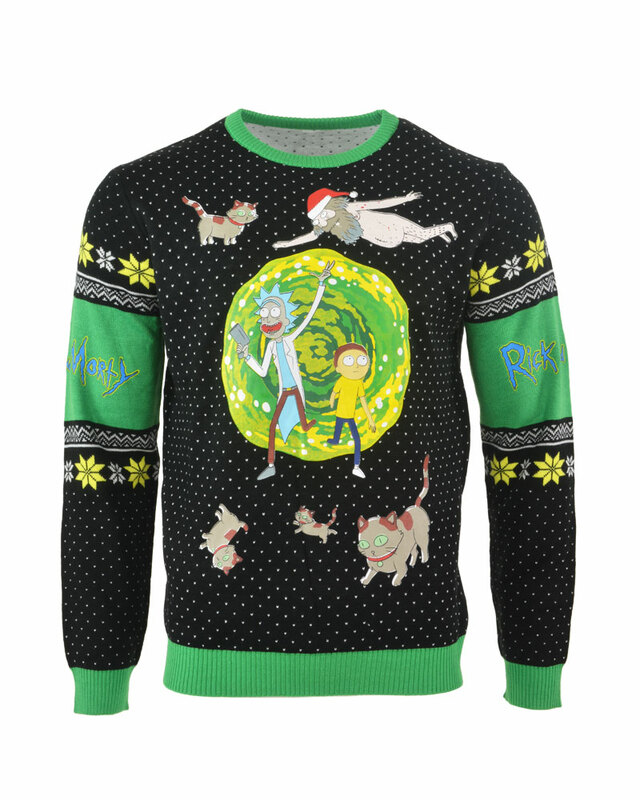 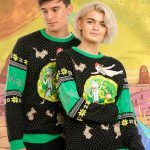 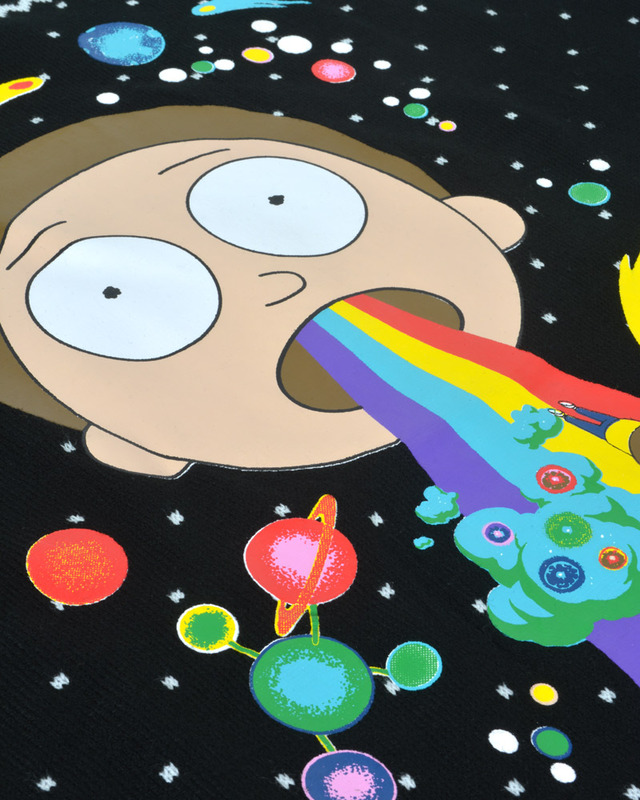 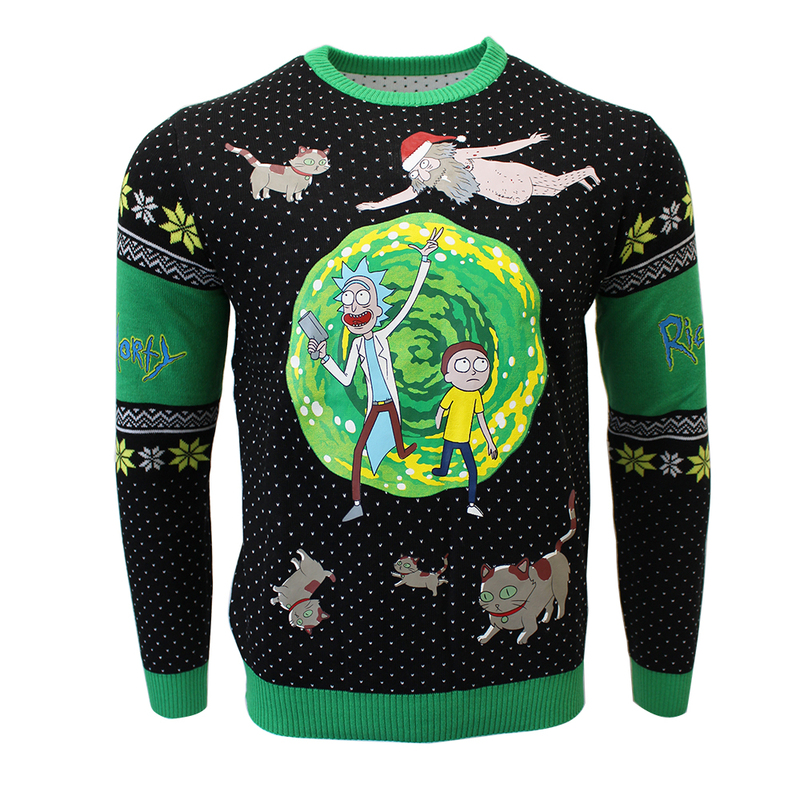 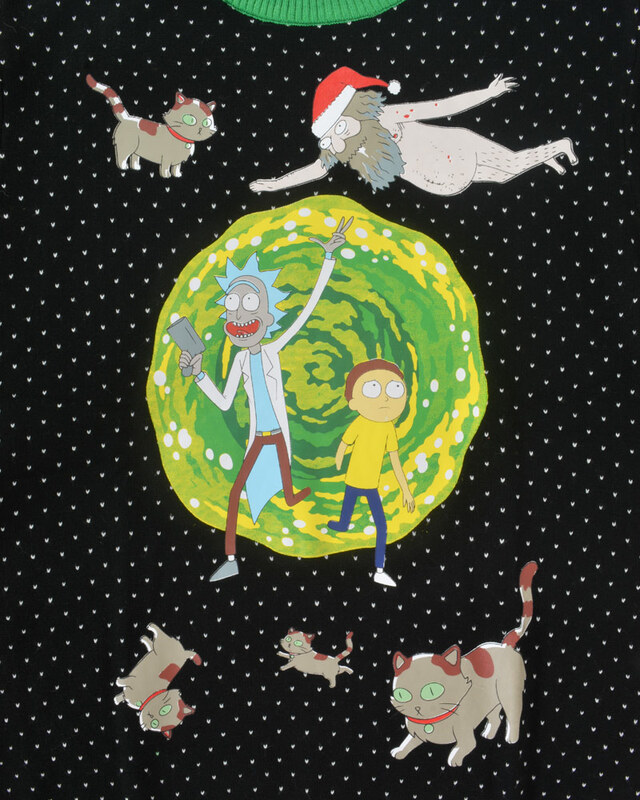 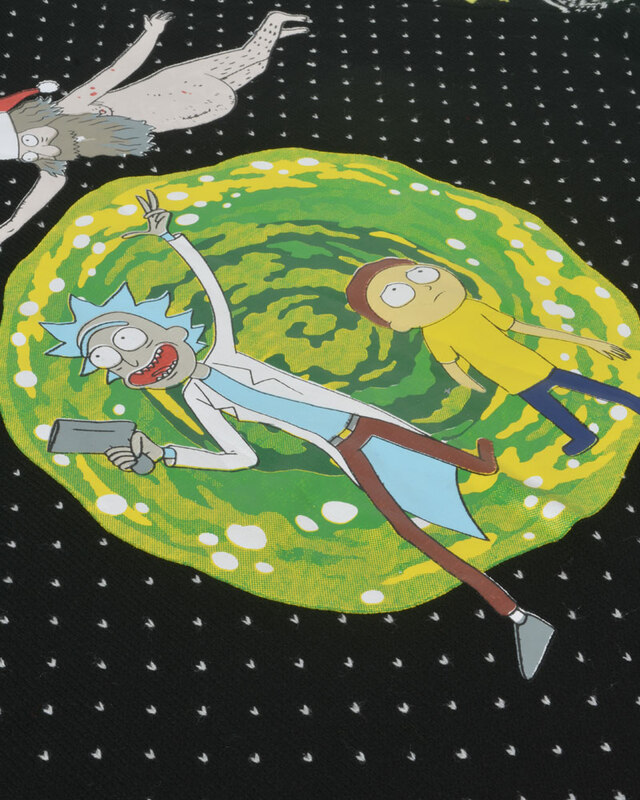 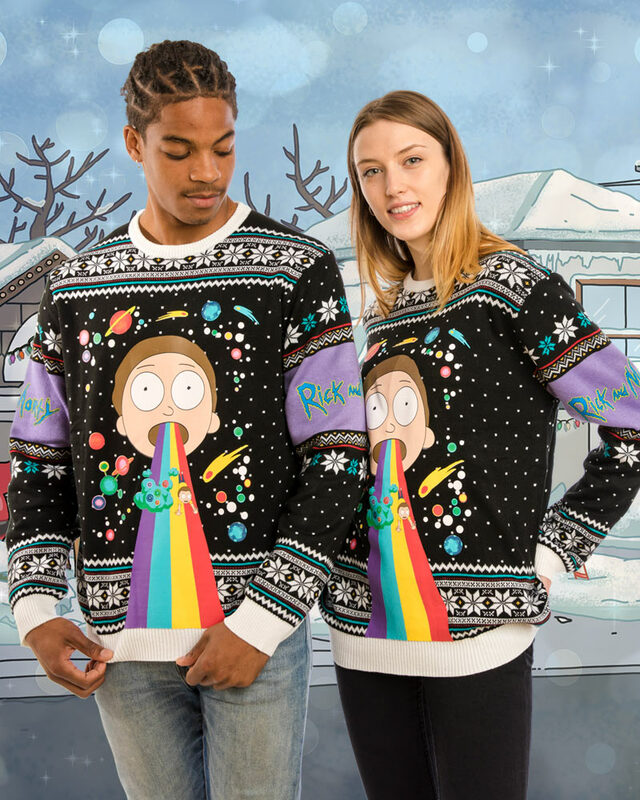 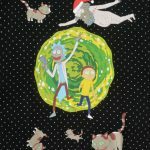 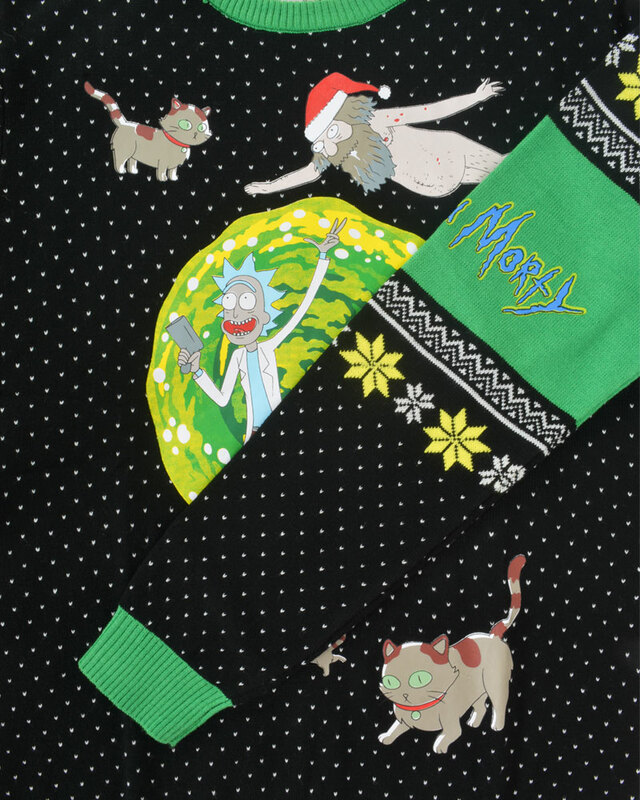 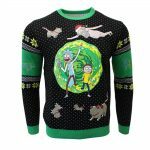 Amazon/other: This officially licensed Rick and Morty Christmas jumper features the iconic duo entering an interdimensional portal, surrounded by floating cats and Christmassy goodness! 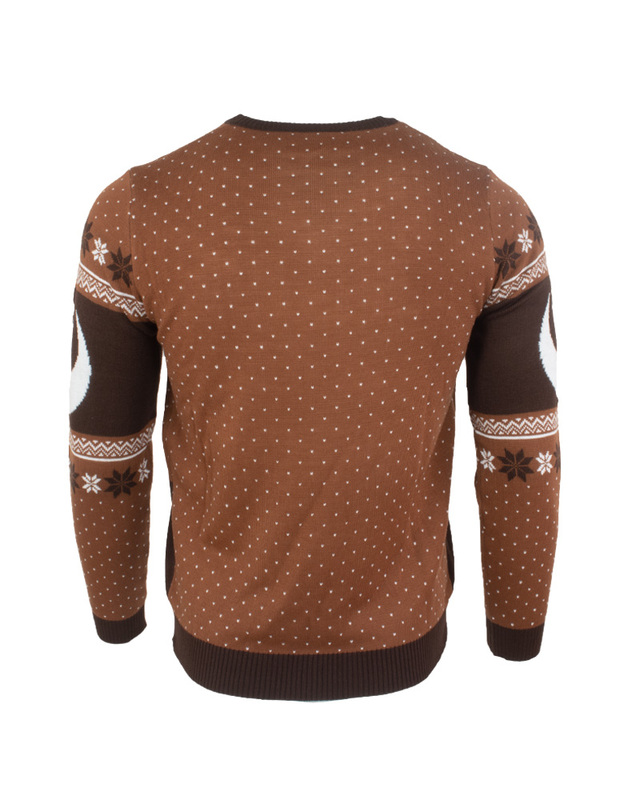 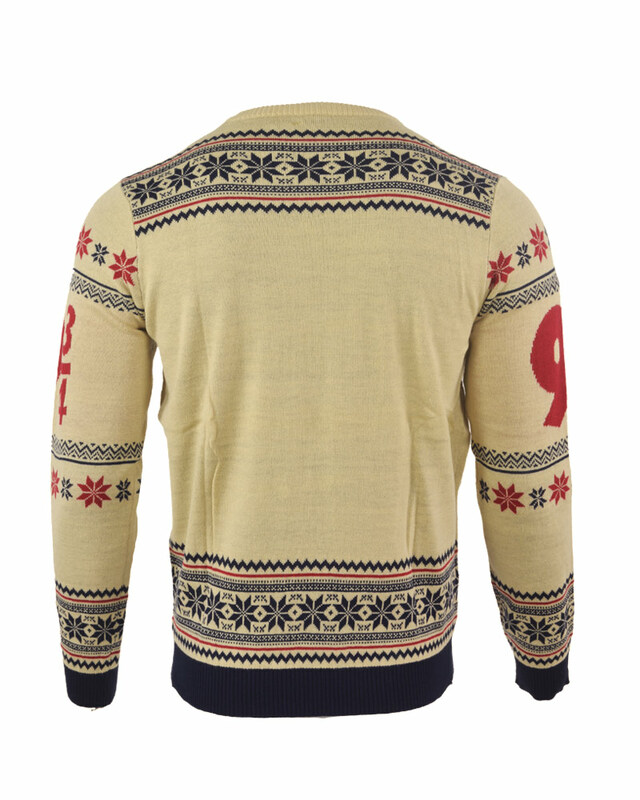 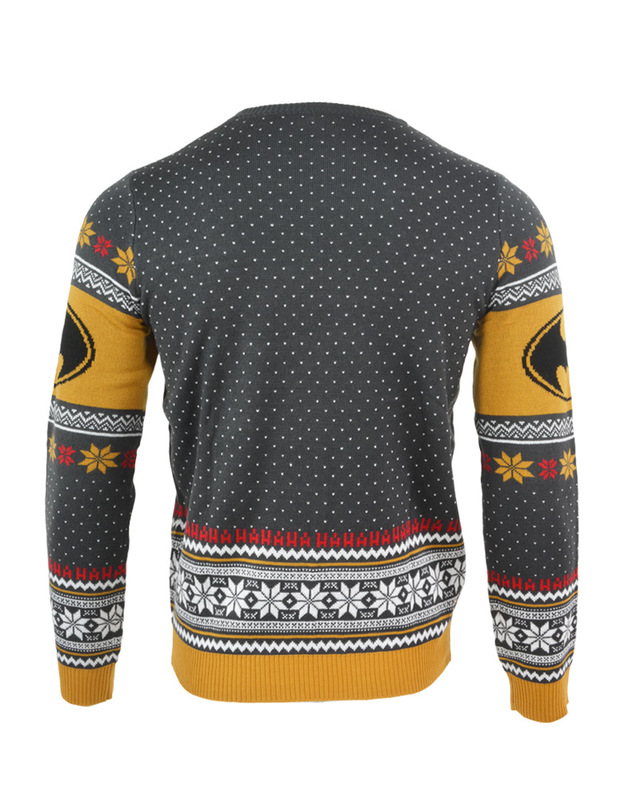 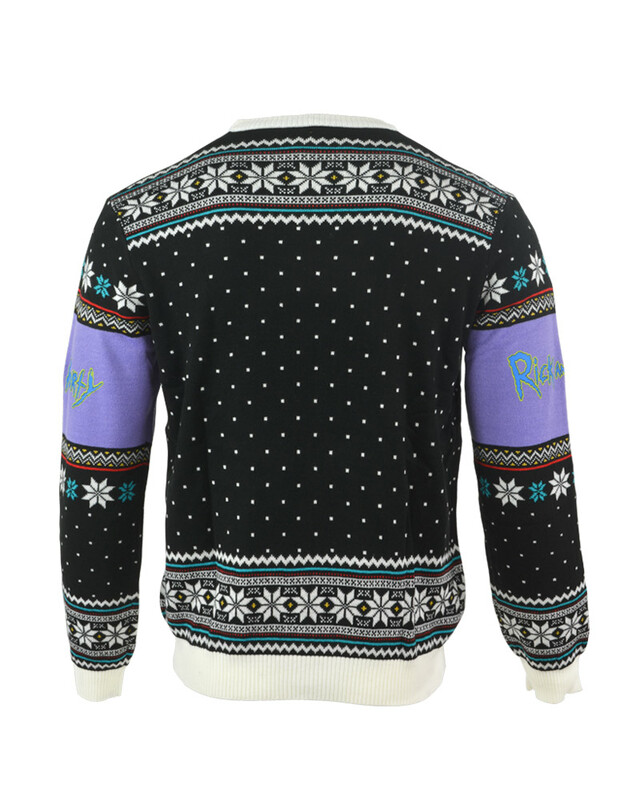 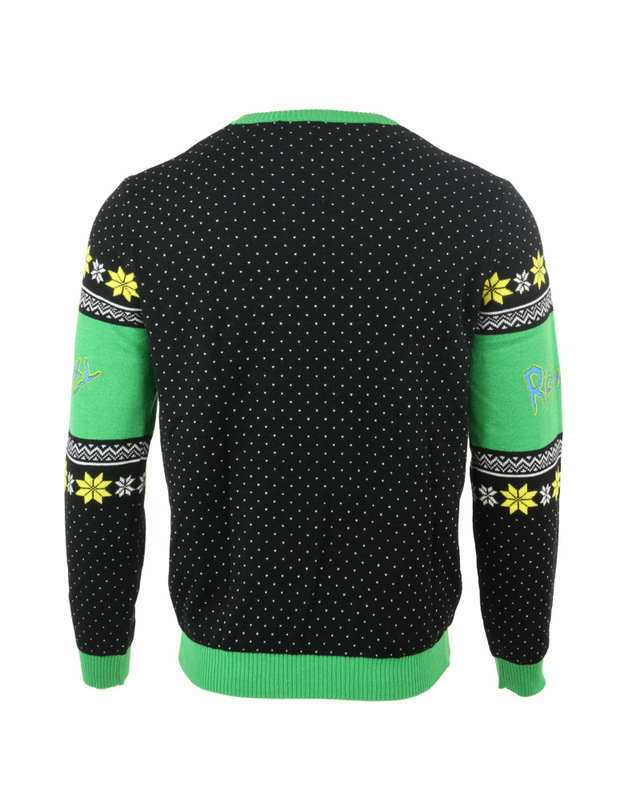 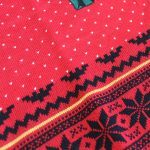 An authentic knitted Xmas jumper with gel print effects, this ugly jumper is actually anything but and makes for a great Christmas Jumper Day choice! 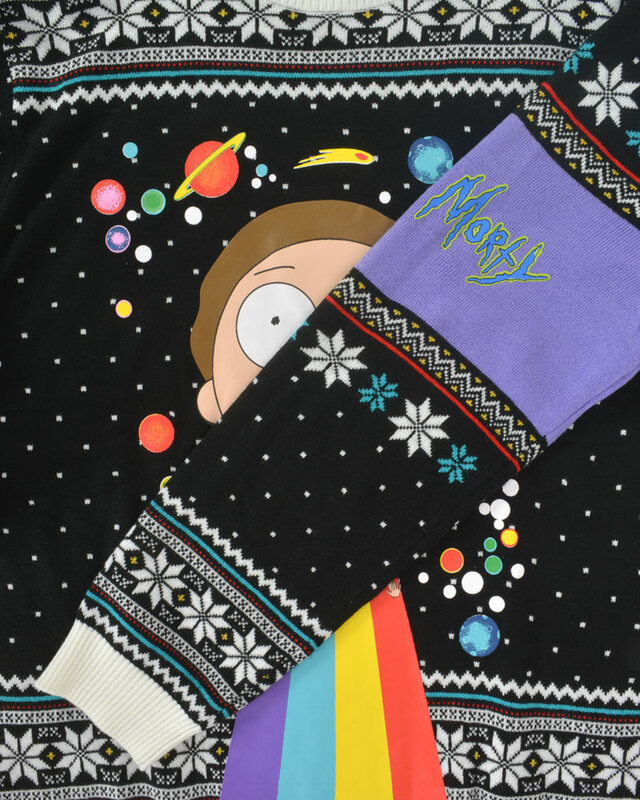 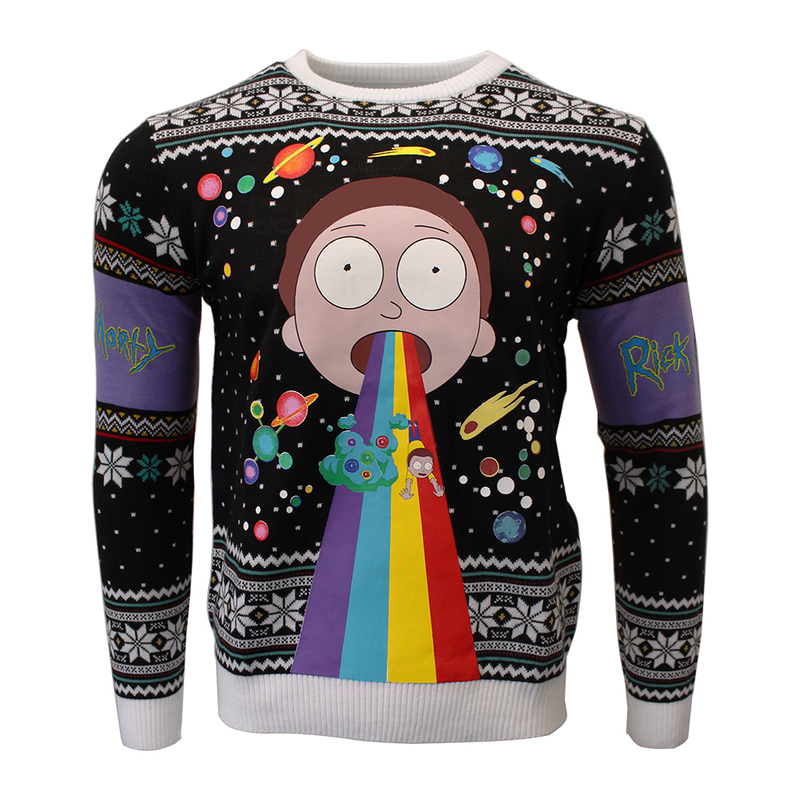 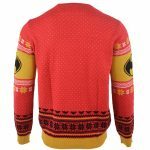 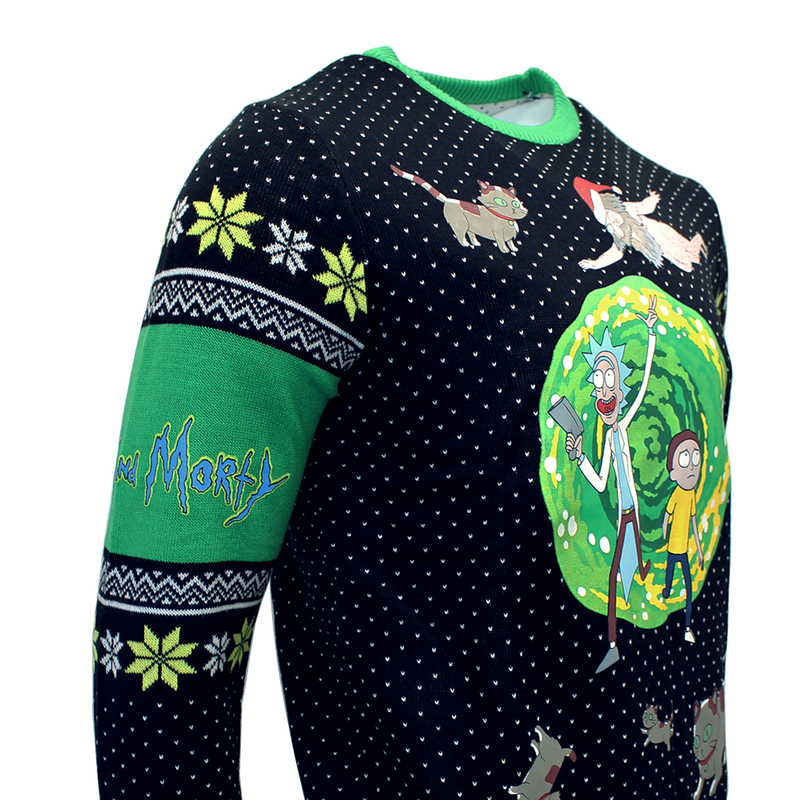 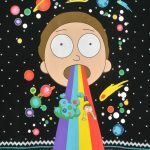 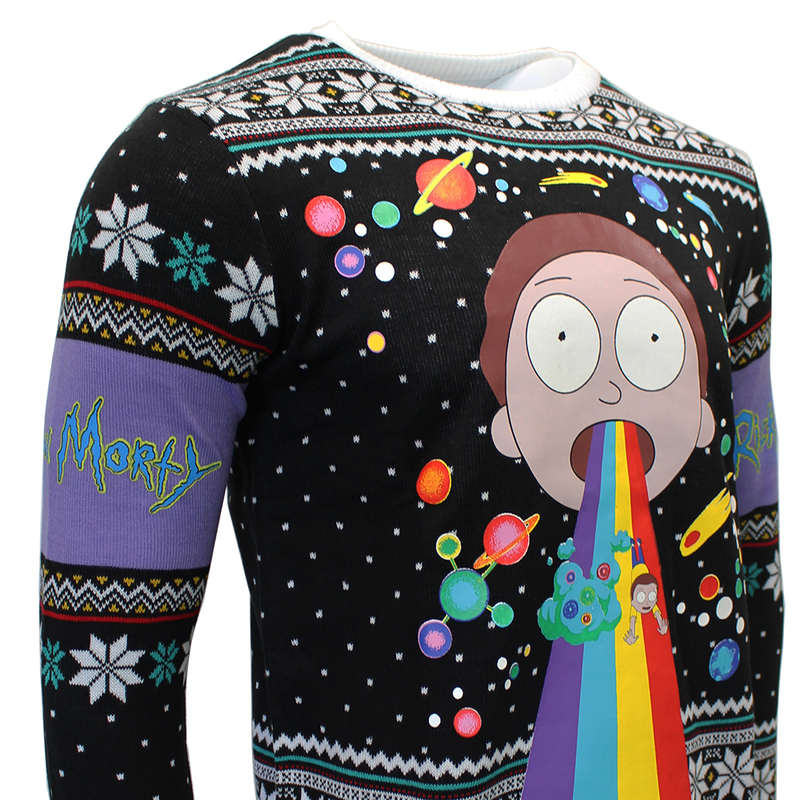 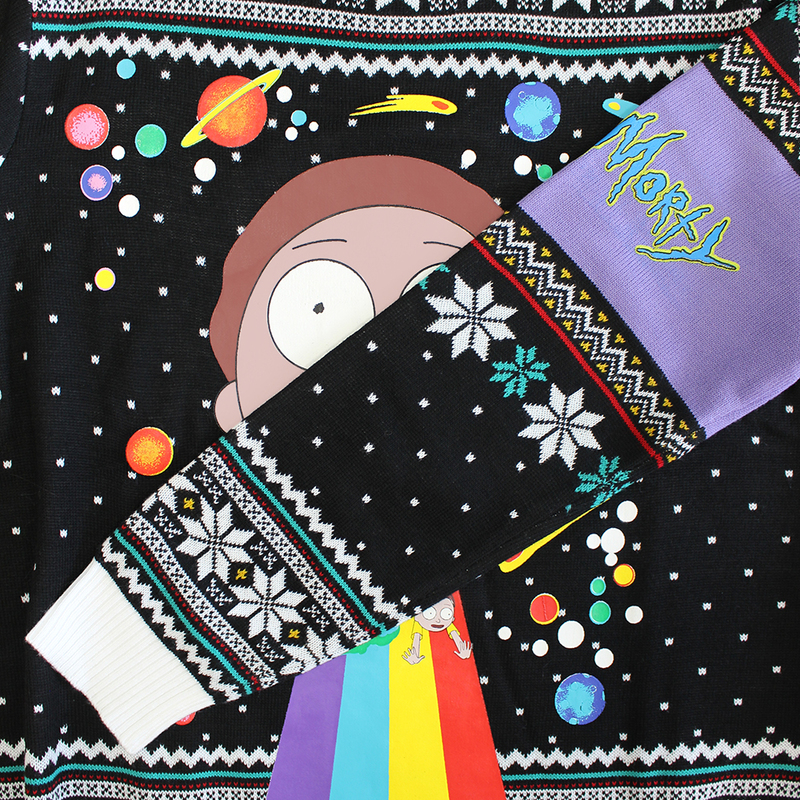 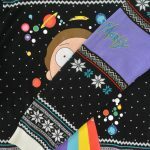 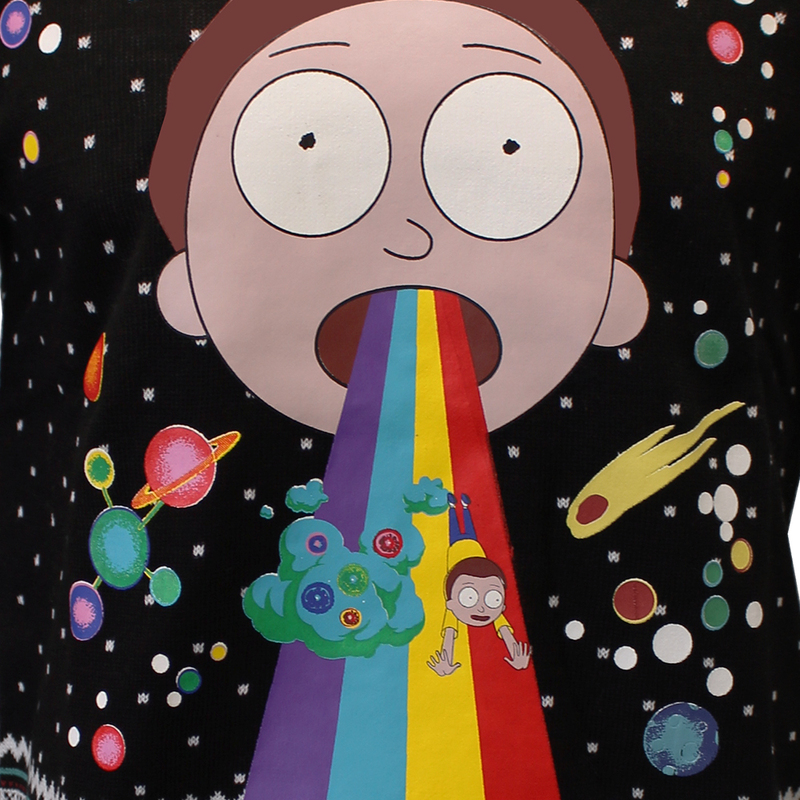 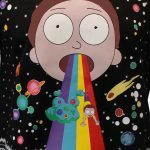 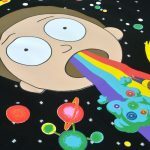 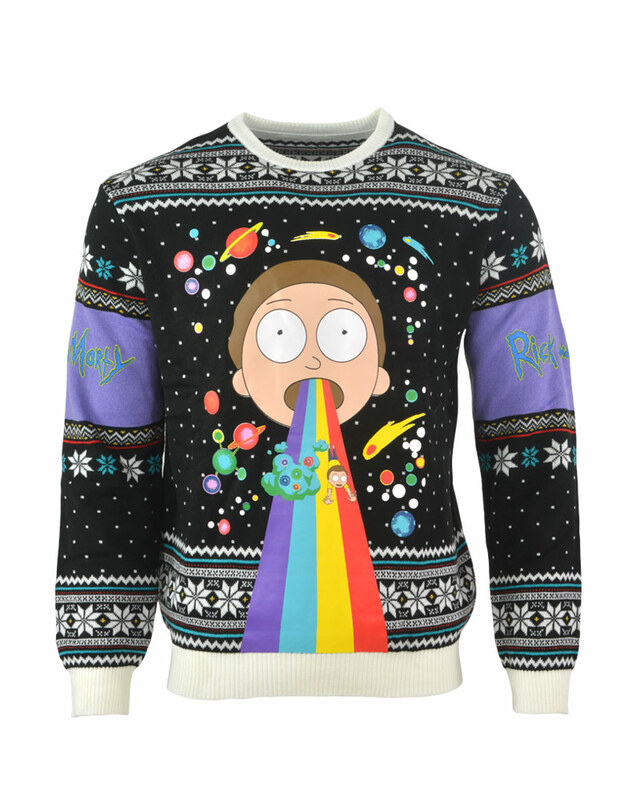 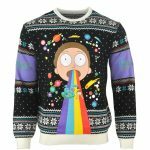 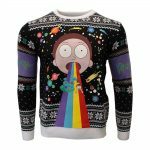 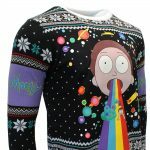 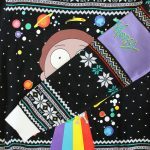 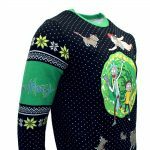 Amazon/other: This officially licensed Rick and Morty Christmas jumper is the perfect way for fans of the massively popular comedy animated series to celebrate the festive season! 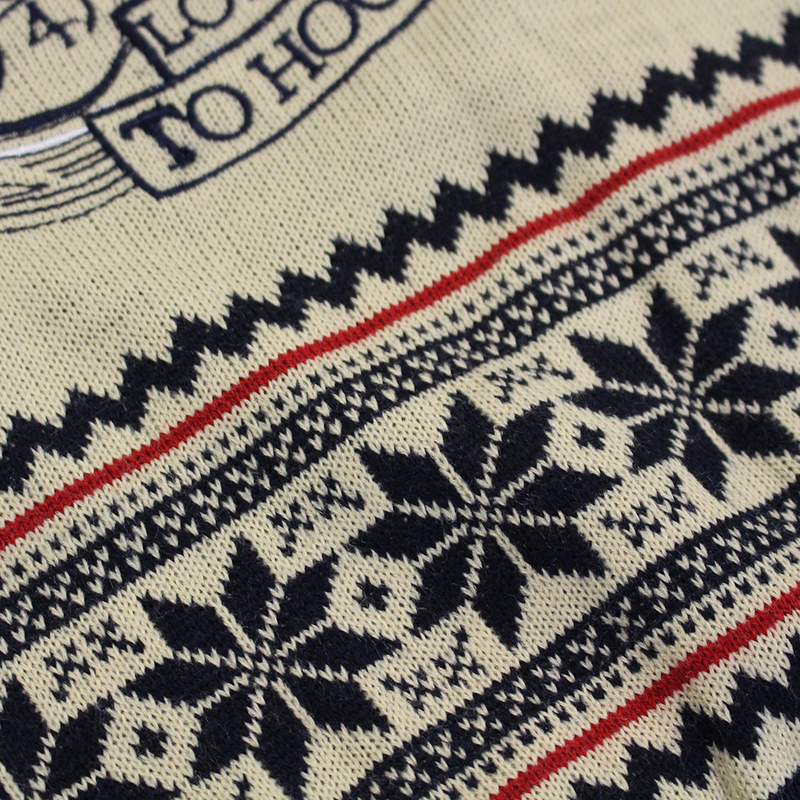 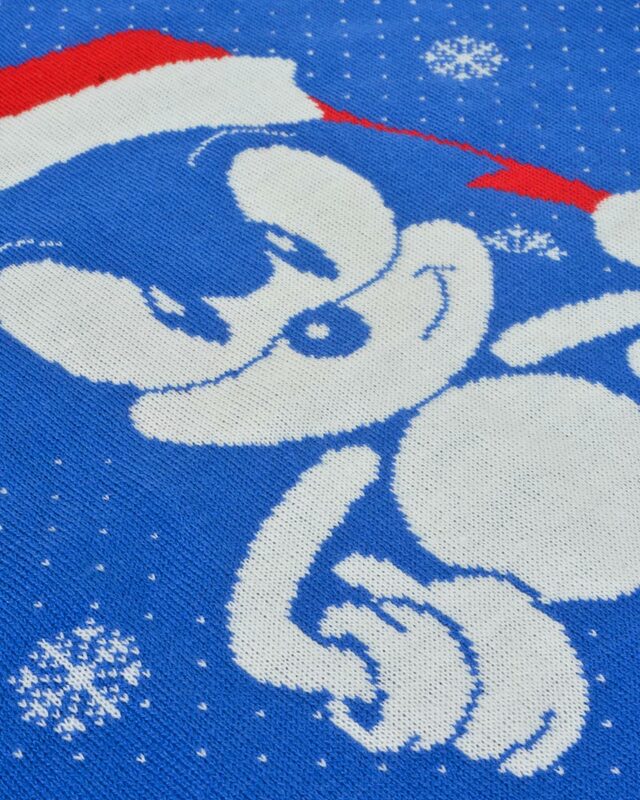 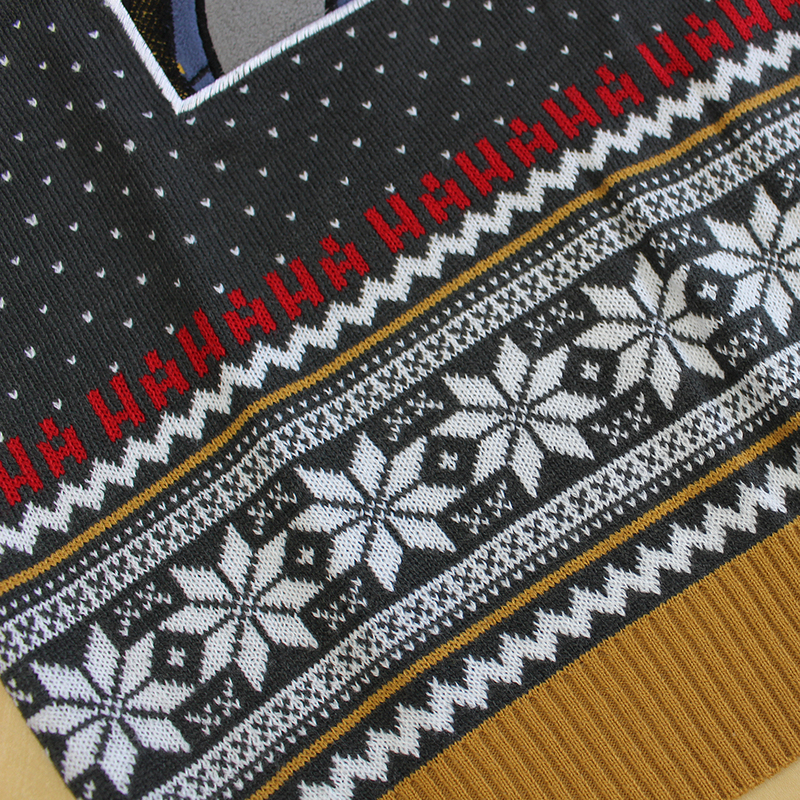 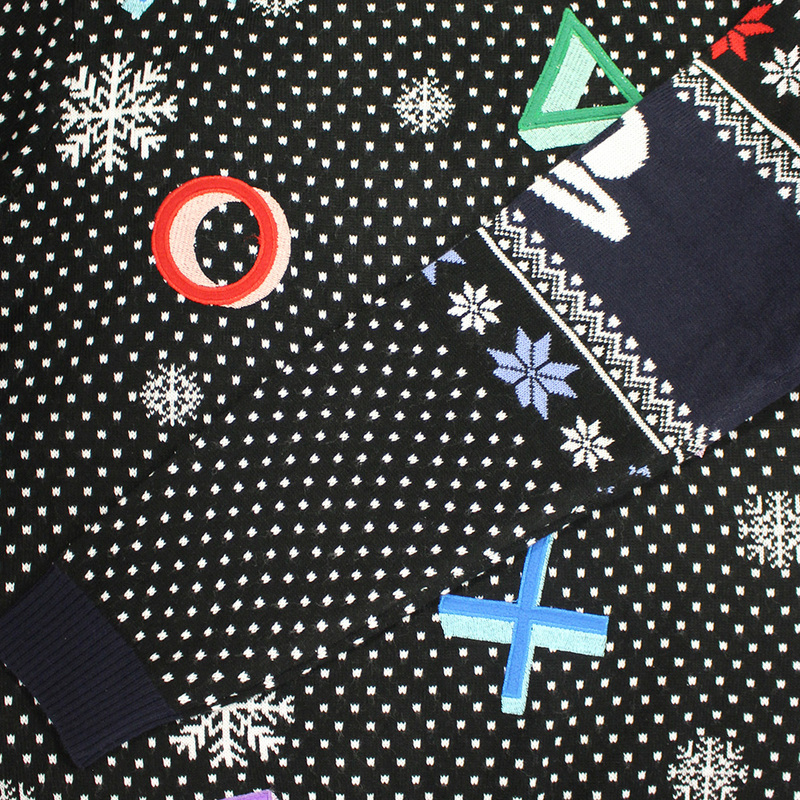 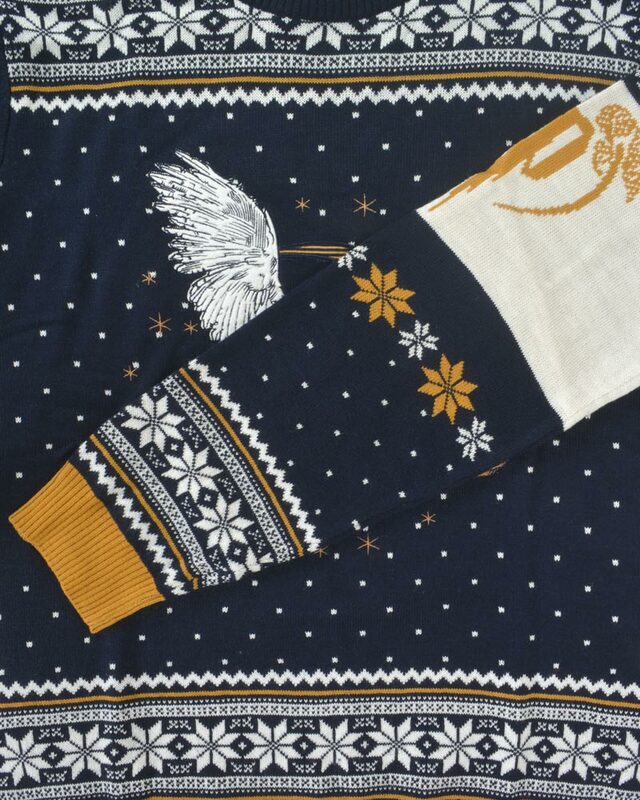 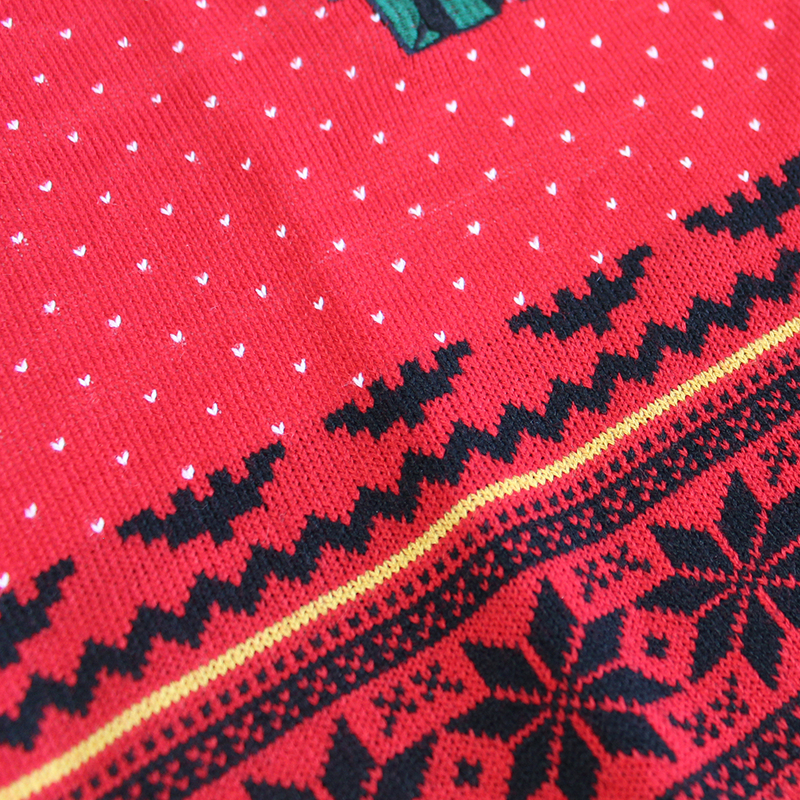 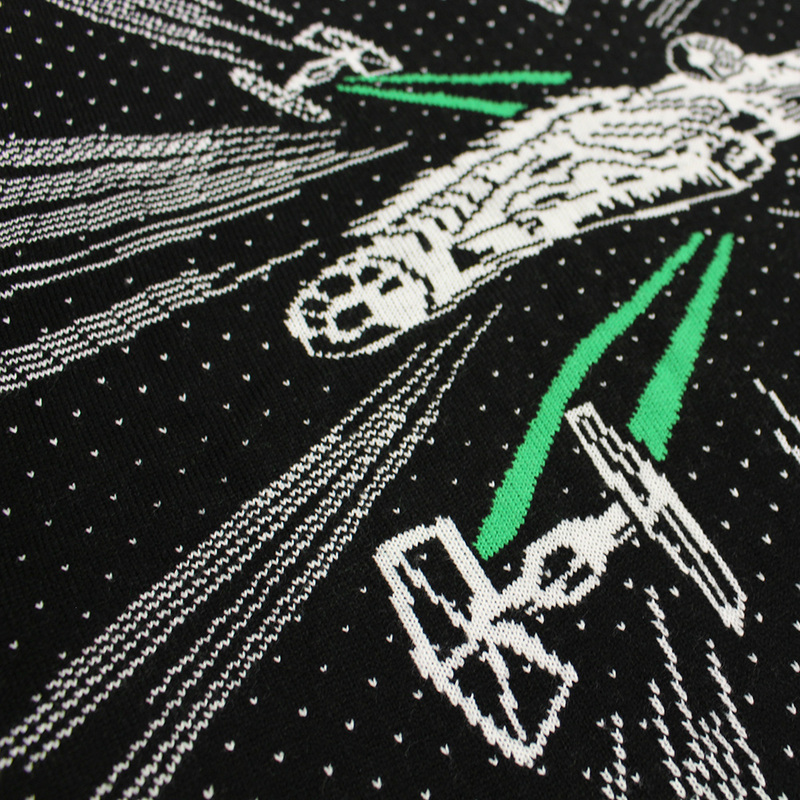 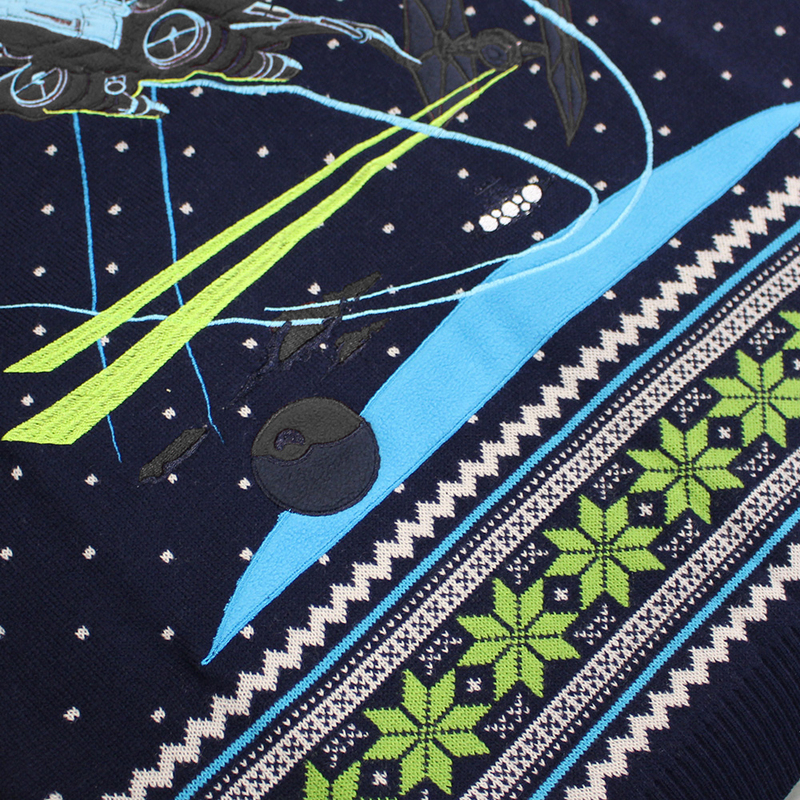 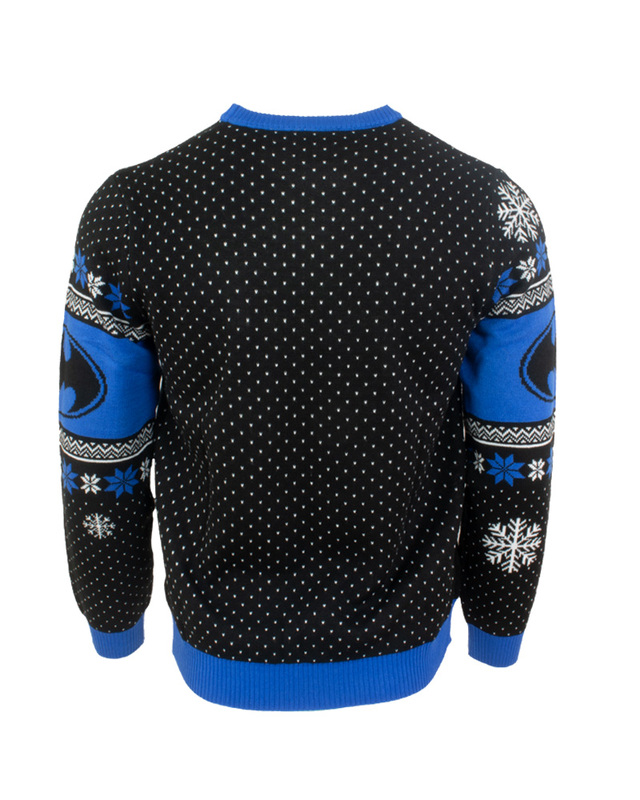 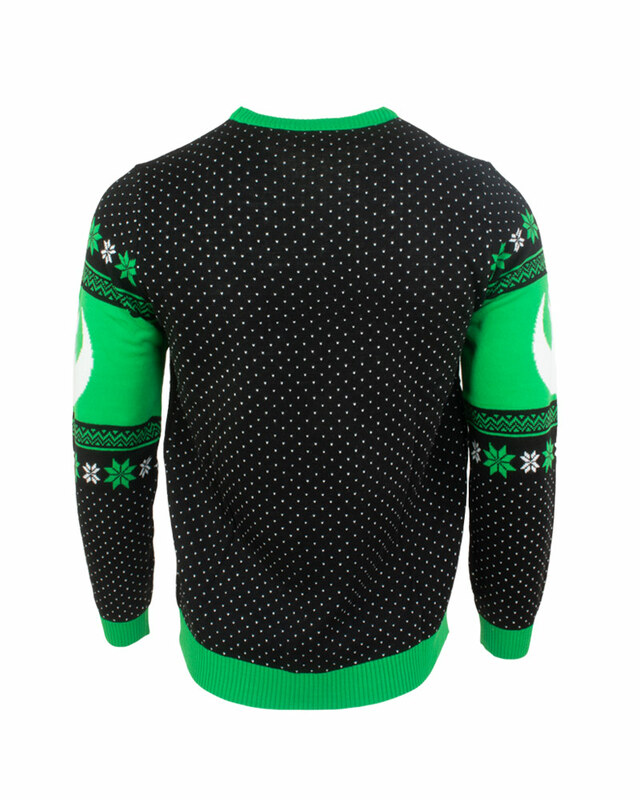 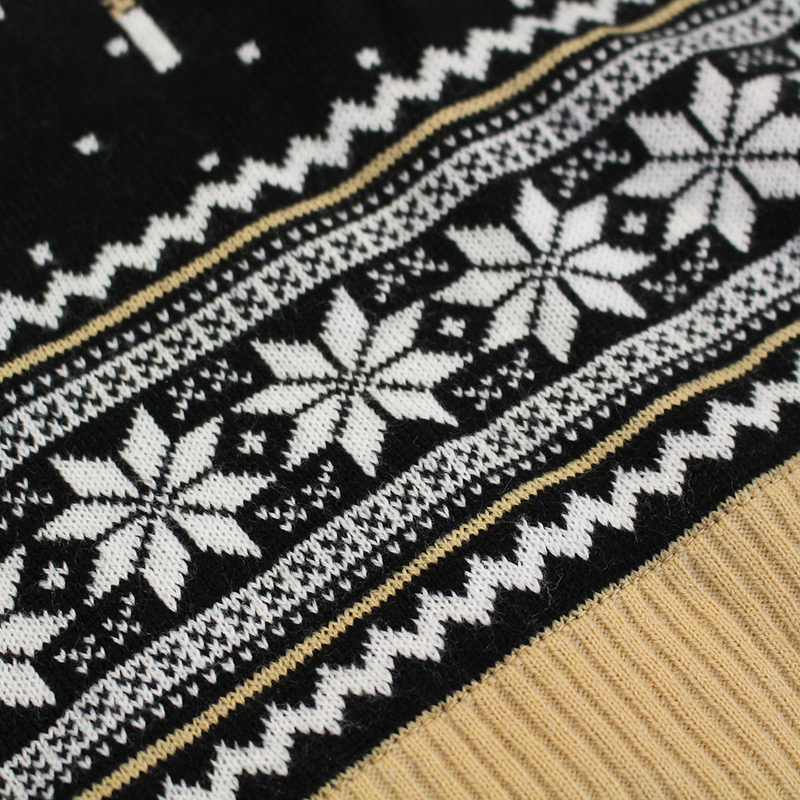 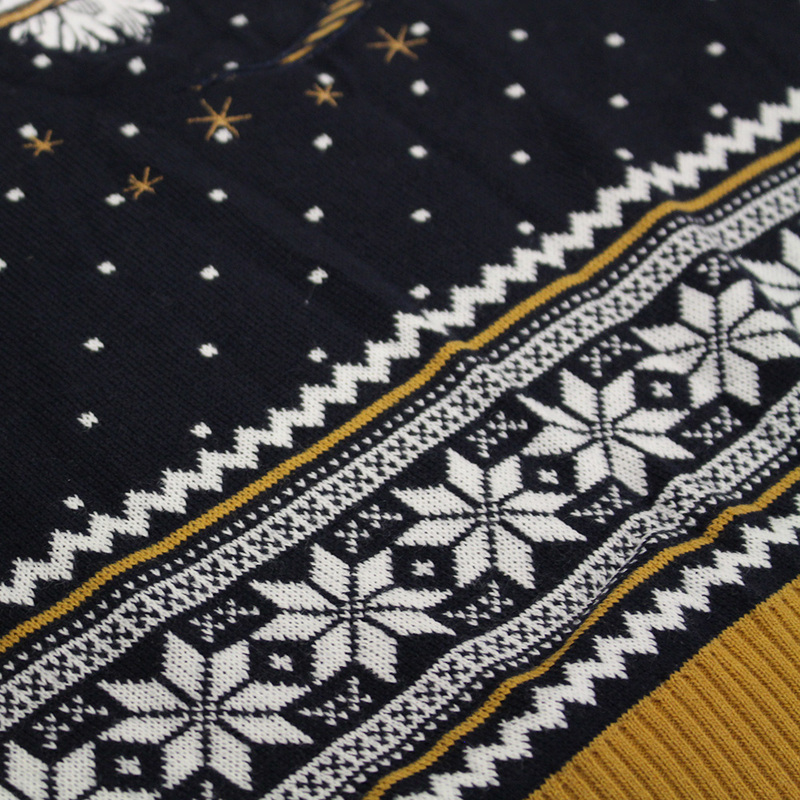 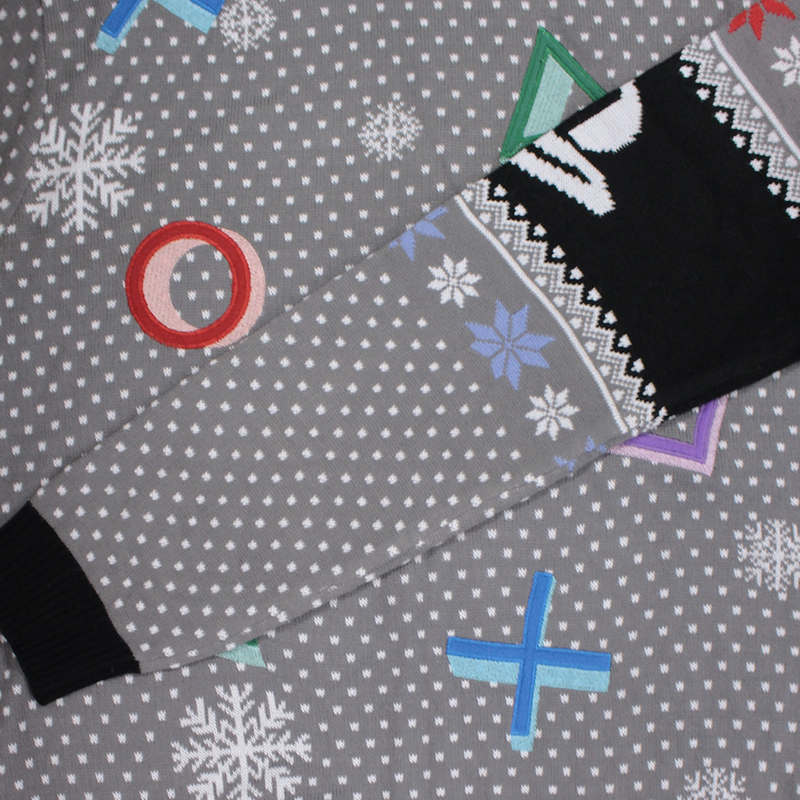 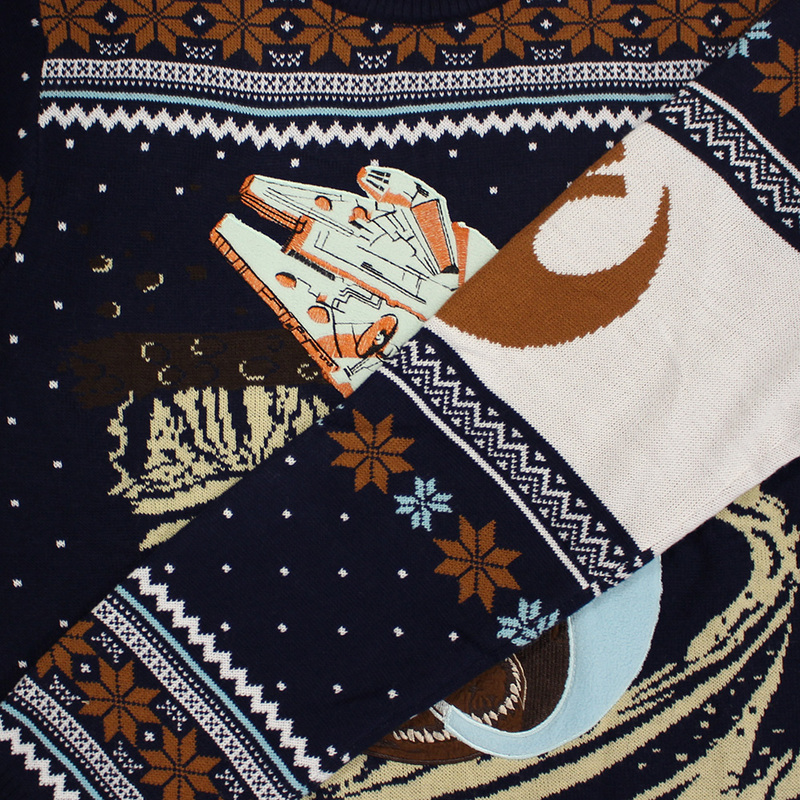 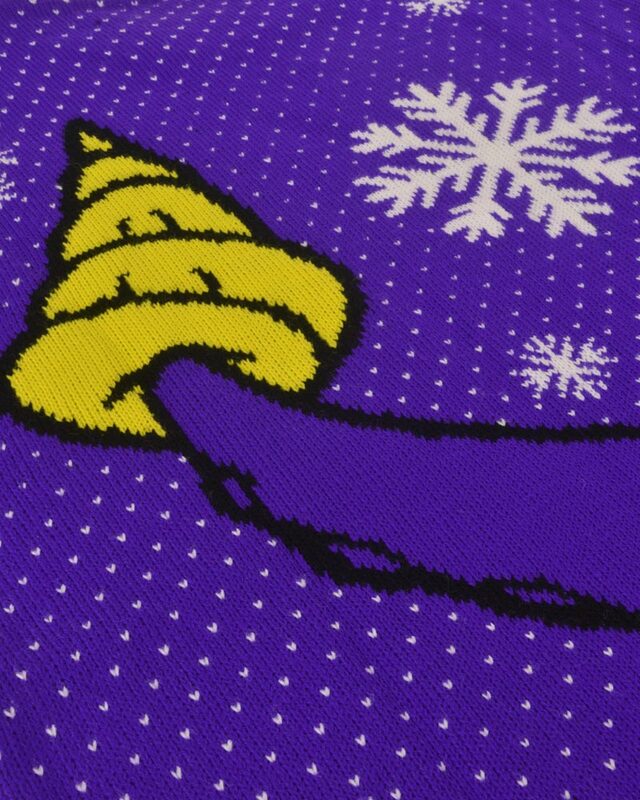 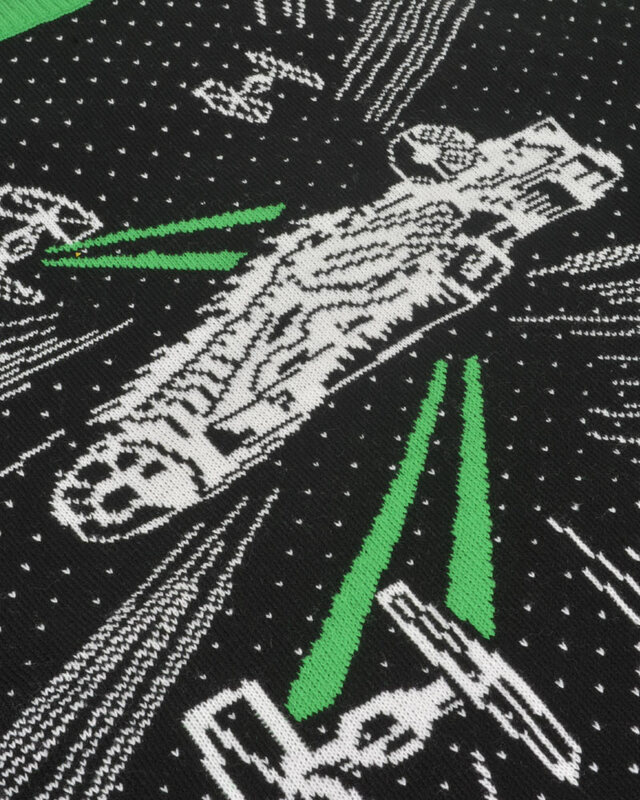 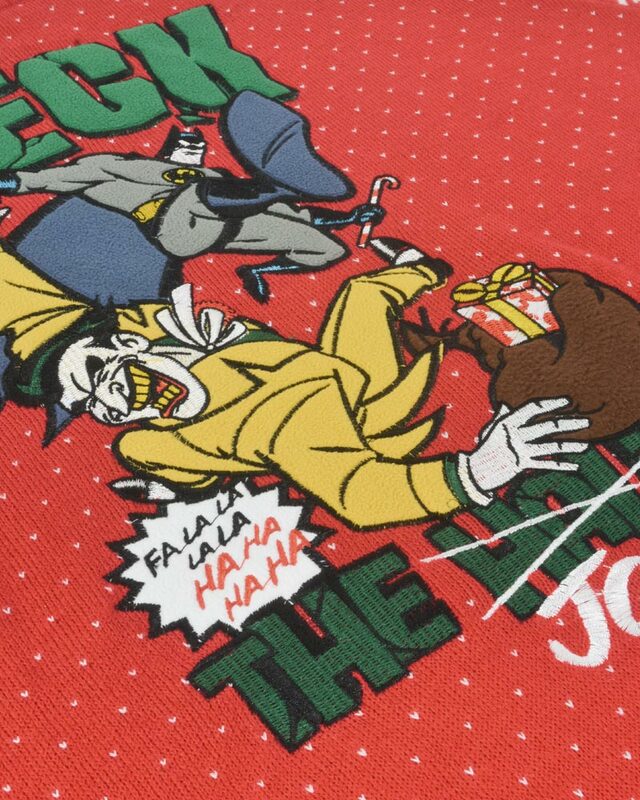 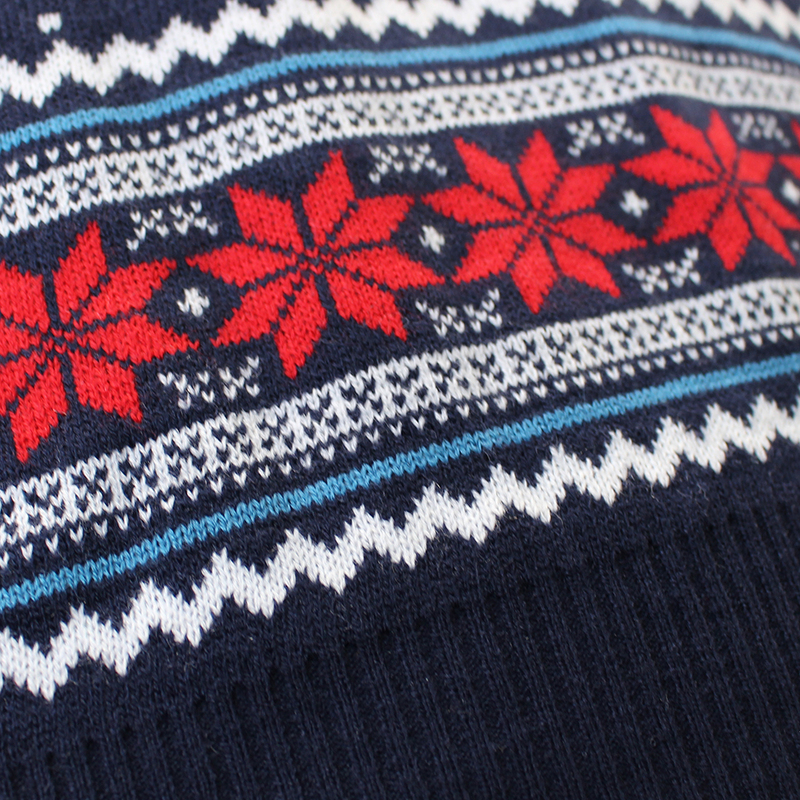 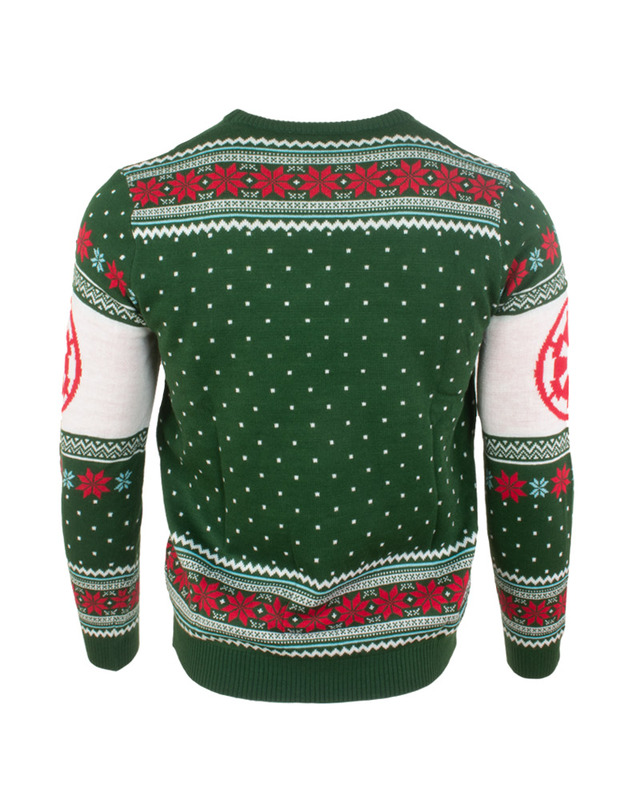 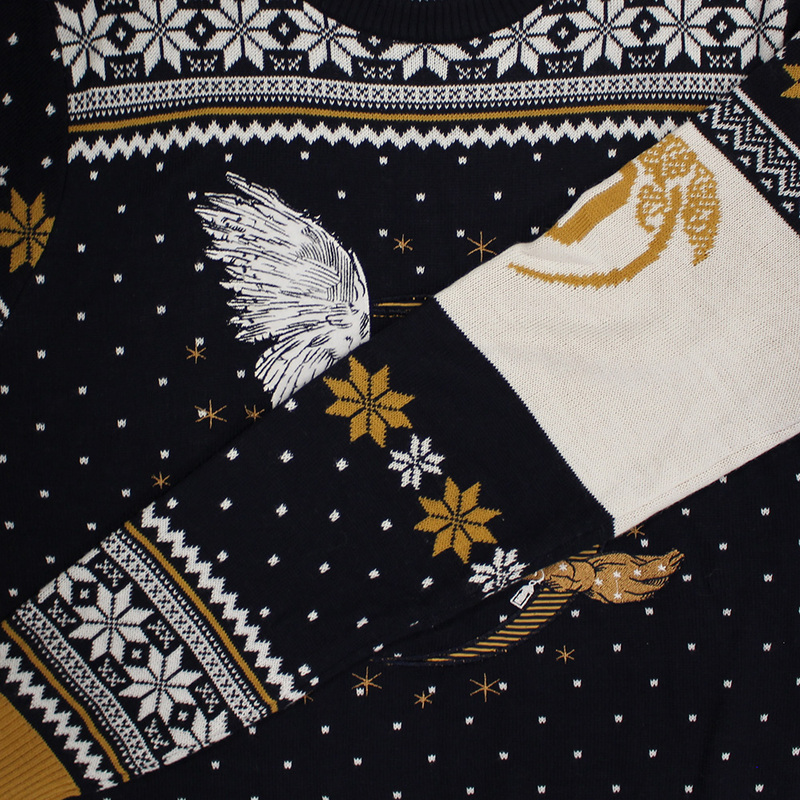 Featuring a design based on one of the episodes, this ugly Xmas sweater is fully knitted with gel print effects.